St Agnes AFC is very proud to have sponsored the Merlin MS Centre's 10th Anniversary Recipe Book. 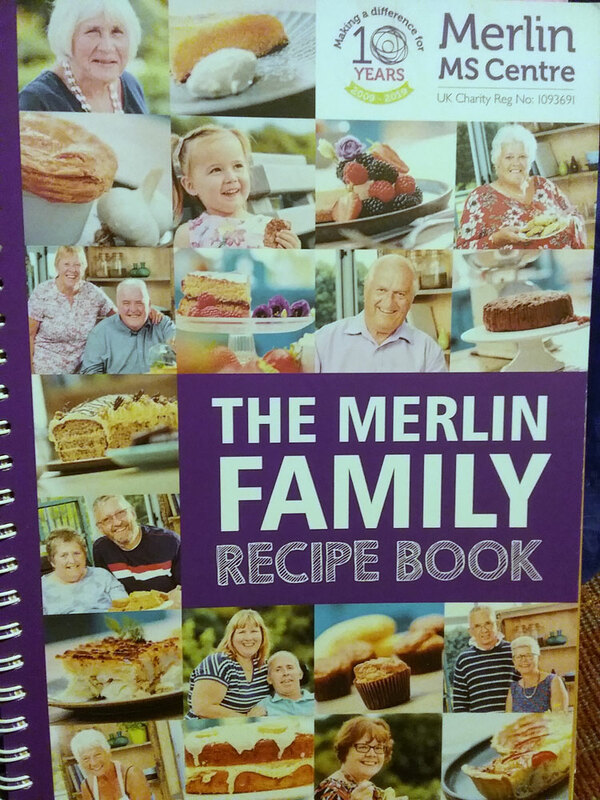 The book will help raise further funds to help the Merlin Centre provide a centre for excellence in Cornwall providing expert care, support and therapy for those living with MS and other neurological conditions; and for their families and carers. 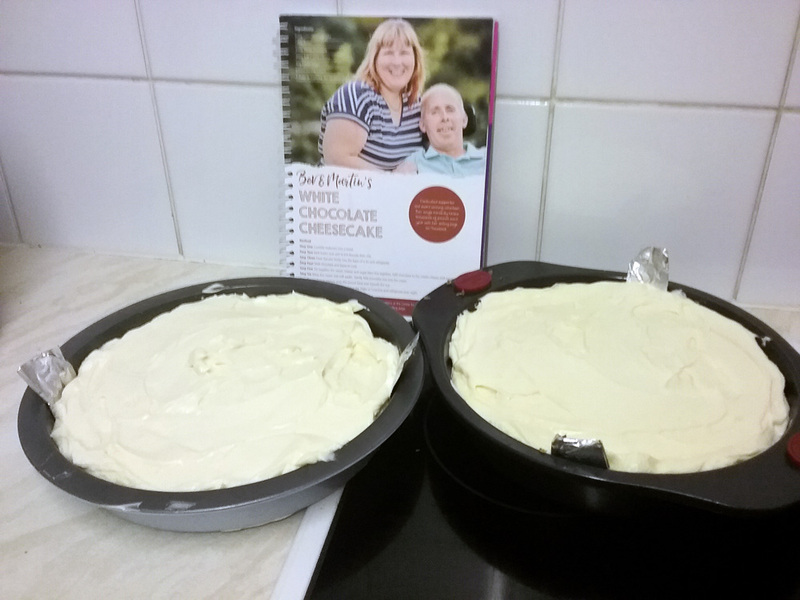 Its a lovely book and having just tried my first recipe from it I can recommend the white chocolate cheesecake! St Agnes AFC Ladies 1st team hosted Exeter & Tedburn Ladies in their last fixture of 2018 with a good 5-2 win and an important 3 points before the Christmas Break. 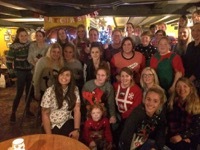 35 members of the squad and coaching crew then enjoyed a scrumptious festive team dinner at the Red Lion in Blackwater. The squad resume training on Wednesday 9th January 2019 and new players are always welcome. Wishing all our supporters, volunteers and sponsors a Merry Christmas and Happy New Year! 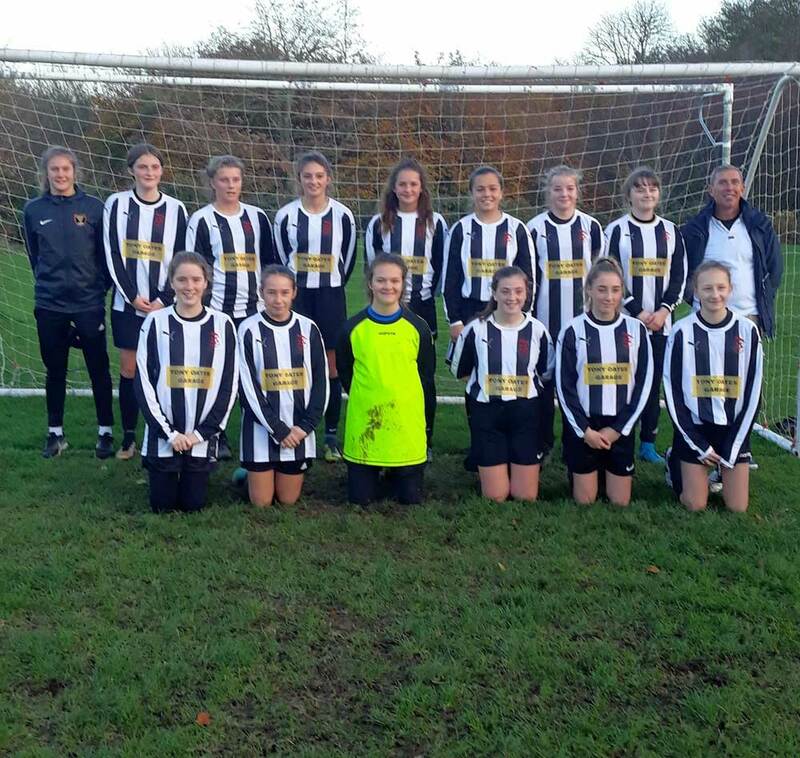 St Agnes AFC under 15's girls played their last fixture of the Autumn League at home against Bodmin with a 3-3 draw seeing them two points clear at the top of the table to win the Trophy. 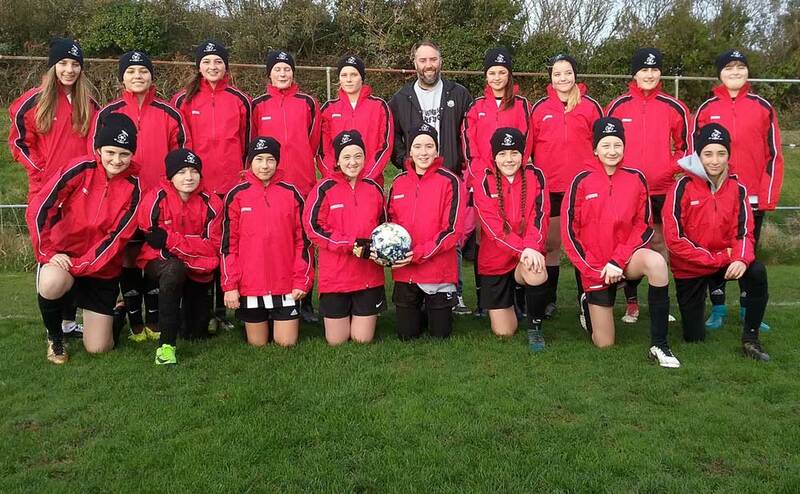 Before the match the team were presented with new jackets and club hats generously sponsored by Maddocks Building Co. of Cornwall. With the CGFL Autumn League finished the squad look forward to continuing training and the Futsal and Spring League Fixtures. 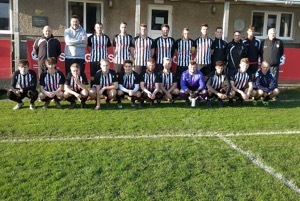 Photos of team in new jackets with sponsor and with trophy at end of fixture. 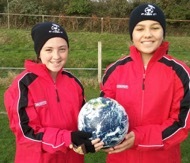 St Agnes AFC were very excited to be chosen by the FA's Football Foundation as a busy, proactive community project in Cornwall to receive a limited edition One World football. 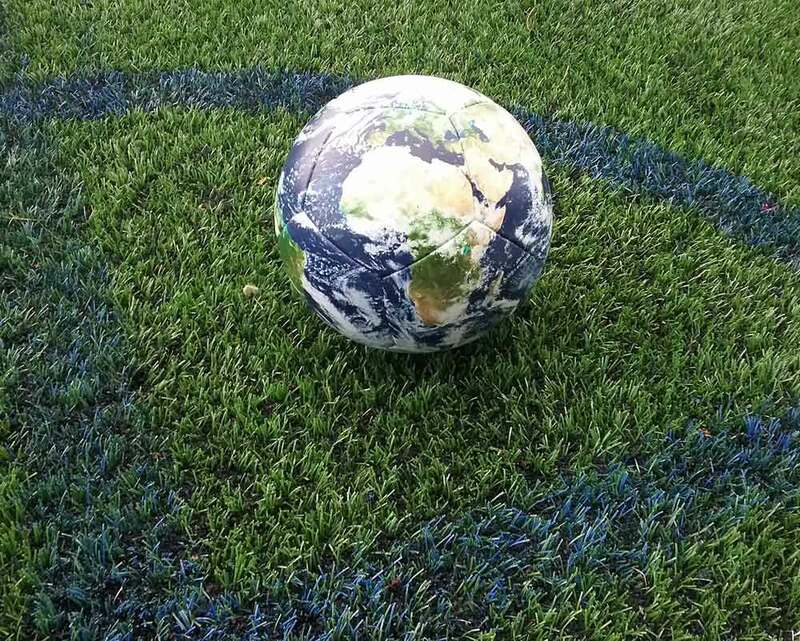 The football is a special art commission by Mark Wallinger marking the centenary of the First World War through football and inspired by the Christmas Truce. 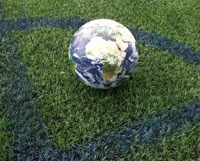 St Agnes AFC will be sharing the ball and its message celebrating how football brings people together across its 29 teams and groups making and sharing photos and videos with the message 'St Agnes AFC belong to #OneWorld' uploaded to social media as part of the project. 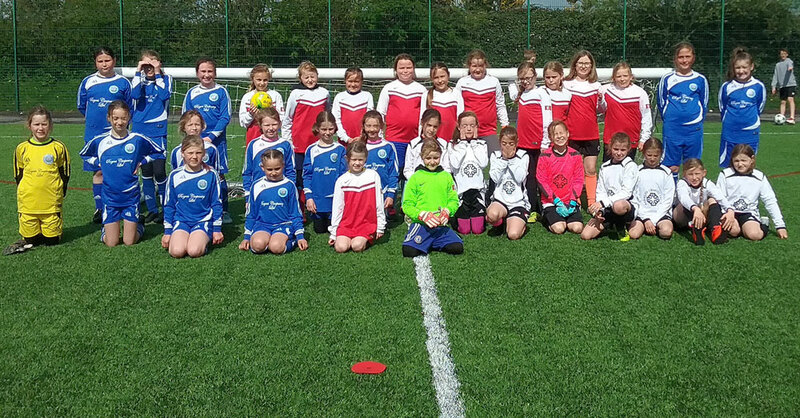 This weekend the ball was shared and photographed with members of the clubs under 10's, under 15's girls and Ladies Reserves players. St Agnes AFC Ladies County Cup 1st round 8-0 win against FXU. Goal scorers - Mollie Dring (hat-trick), one each for Debbie Duncan, Laura-beth Metcalf, Abbie Carveth, Sarah Fisher and Alice Hope. A strong dominating performance against a side that competed and never gave up throughout. We look forward to hearing who we have in the Quarter Finals of the County Cup. Next Sunday the first team are at Home against Feniton back in South West league action and the reserve team are away against FXU continuing in their league campaign. 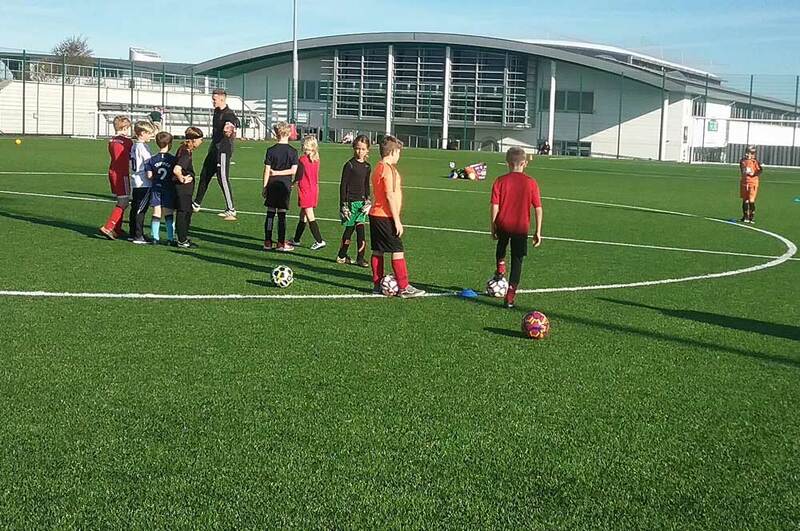 Training Wednesday evening's at Truro College 3G 7-8pm. 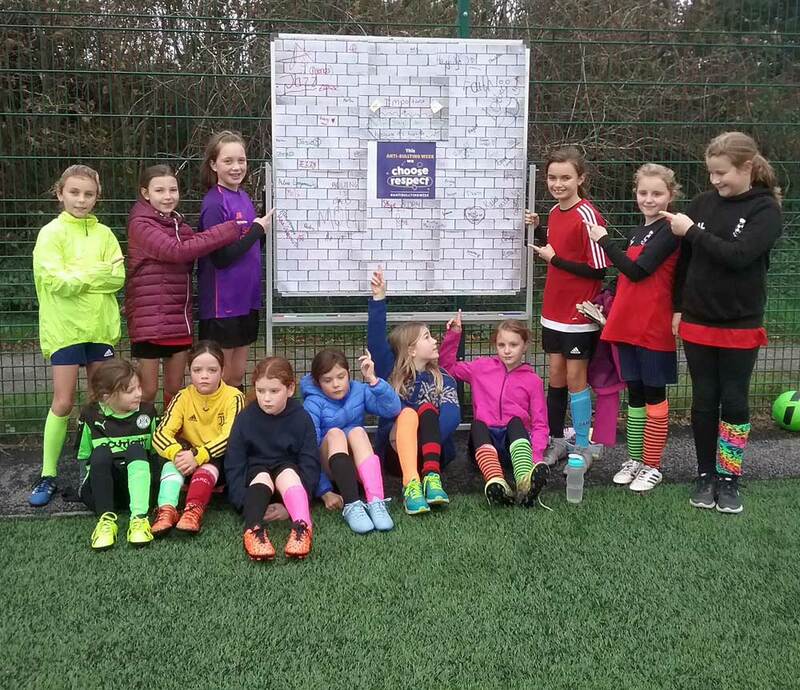 Members of St Agnes AFC Dynamos Girls wore odd socks to training on Saturday in support of anti-bullying week 2018 and eagerly signed up to a 'Wall of Respect' against bullying. 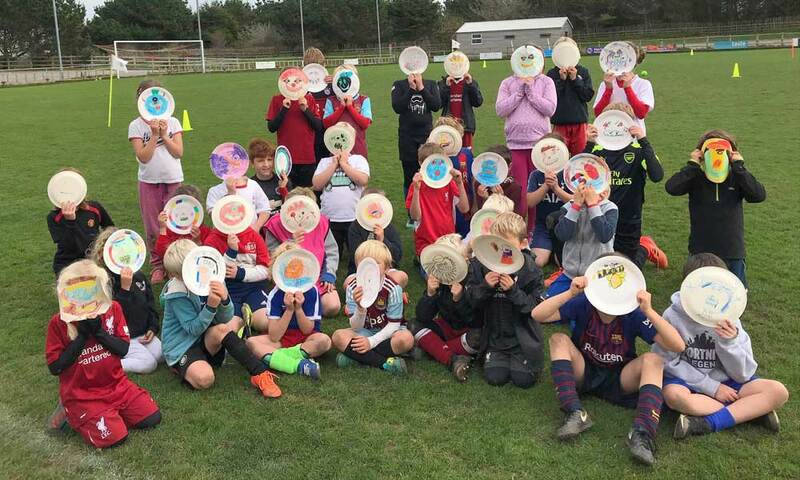 All the age groups with coaches and parents discussed bullying and were 100% against it sharing information on what to do to help stop it and how to get help including advice from the FA's anti-bullying guidelines. Members of the St Agnes AFC Dis-ability Squad also discussed anti-bullying and signed stars they stuck on the wall against bullying. A very positive morning shared by players, coaches and parents. St Agnes AFC 1st team unveiled their new playing shirts for a squad photo at home before their match v Culdrose at Enys Parc today. The squad is very grateful to local publican Anouska Andreou of the Railway Inn for her long term ongoing support and sponsorship of St Agnes AFC. The new shirts proved lucky with a convincing 7-0 win to improve the squads recent form with Mark Bell scoring 3 and Ed Wilton 4. 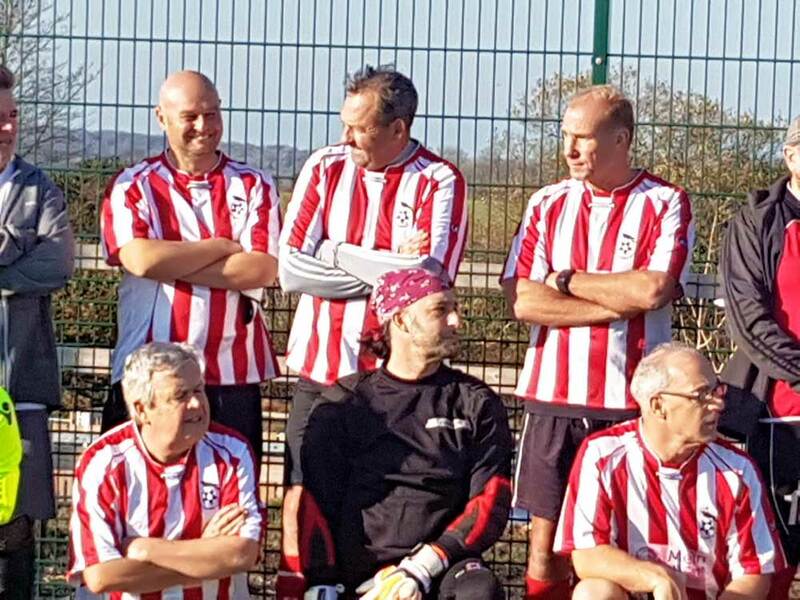 St Agnes AFC Walking Football team were in action again at the second Walking Football Festival. 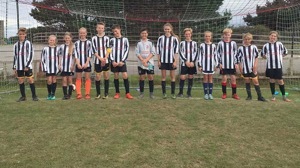 Keenly contested fixtures amongst the eight teams entered saw end to end matches and goals galore with the St Agnes team ending up 3rd placed. 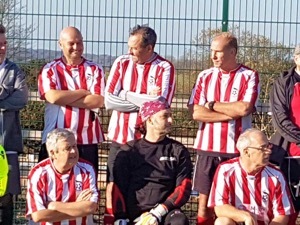 St Agnes AFC Walking Football team train at Enys Parc on Tuesday evenings from 6.30pm-7.30pm (£2 each) with everyone welcome. Contact Martyn Kimmins 07974 370666 for more details. St Agnes AFC Dynamos Girls under 15's held a respectful silence for Remembrance Sunday before their fixture today away at Penzance today. A well battled match ended with the St Agnes girls winning 3-2. 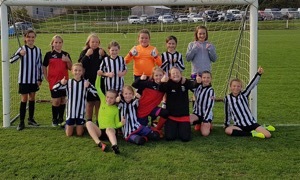 Well done to both teams on a great example of girls football in Cornwall and thank you to all the amazing parents and volunteers who ensured the fixture went ahead. St Agnes AFC Under 13's County Cup V Saltash. 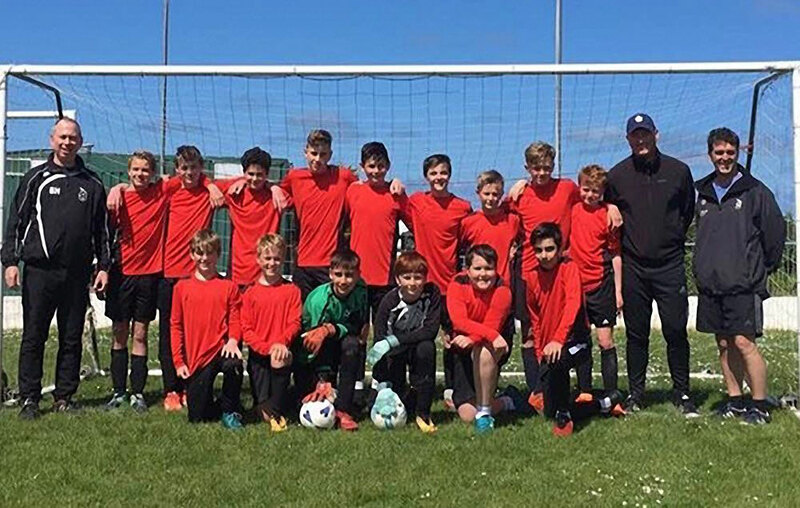 The newly rebuilding St Agnes AFC Under 13's squad were at home this weekend in the CCFA U13's County Cup versus a strong and organised Saltash under 13's team. Fielding a squad of 14, but with 3 key players missing the final scoreline did not reflect the amazing effort, battling and commitment of the St Agnes team right to the final whistle. The match was well refereed by Steve Tootle and in goal for St Agnes Lucas Lang was outstanding. 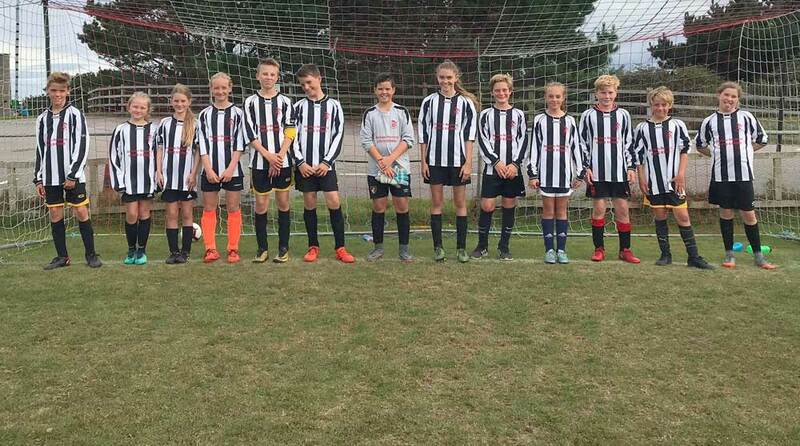 Every member of the St Agnes team should be very proud of their work rate keeping their heads up and playing on with sportsmanship and we wish Saltash good luck in the next round. 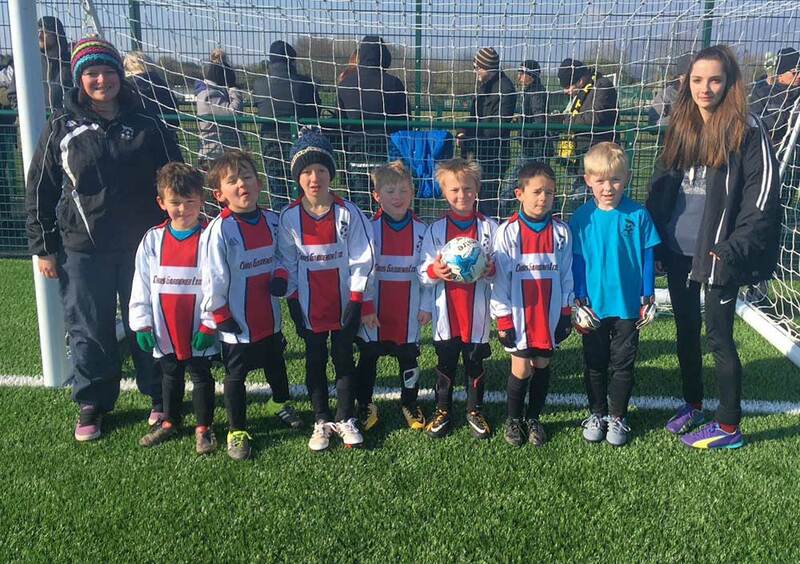 In only their third fixture since reforming at the start of the season the squad are improving and learning well to work together and would welcome any new players interested to training please contact manager Martyn Kimmins 07974 370666 for details. 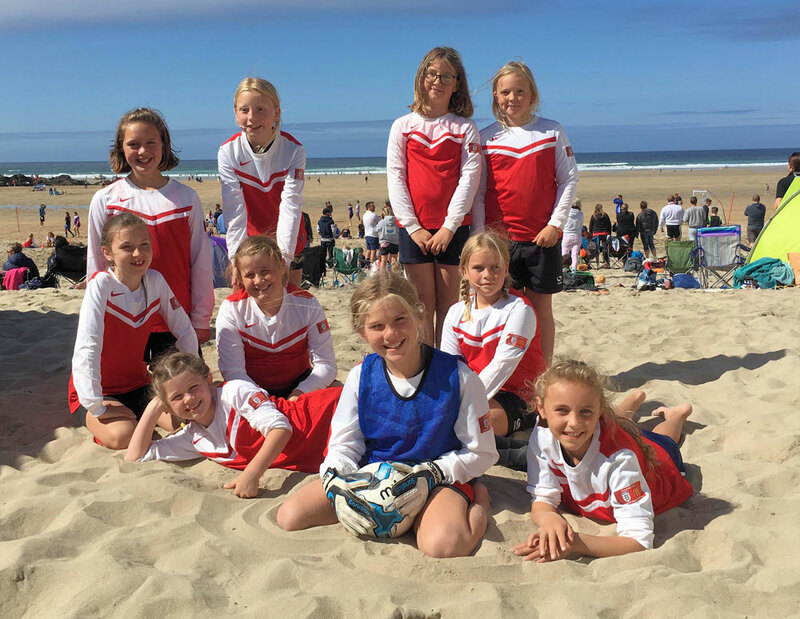 St Agnes AFC Dynamos under 11's thoroughly enjoyed their trip to Newquay at the weekend with an excellent display of footballing skills and sportmanship! 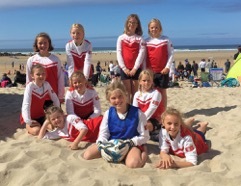 A match both teams performed brilliantly in and played in the true spirit of the girls game in Cornwall much the enjoyment of all the parents and coaches watching it! Well done both teams! 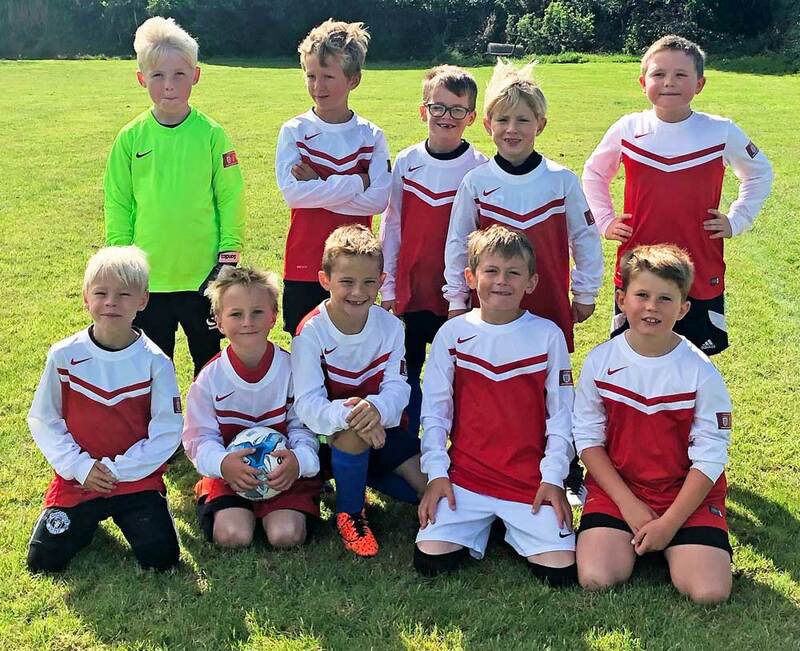 St Agnes AFC Under 8's attended the KYFL Festival at the weekend fielding two amazing 5-v-5 teams of players managed by their excellent new young coach Liam Taylor . All the players were brilliant on and off the pitch making everyone very proud of them all. 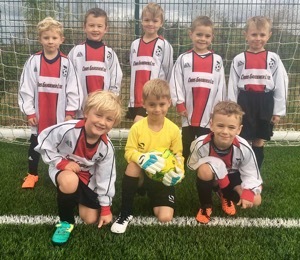 St Agnes AFC Under 7's travelled to Mounts Bay on Sunday with two teams to take part in the KYFL Festival. All the players were fabulous making their coaches, parents and club very proud! Well done to all at the KYFL for a well run entertaining event. 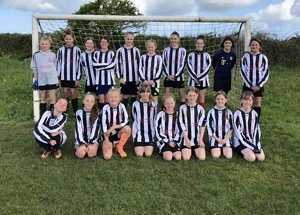 As the only club in Cornwall raising two ladies teams it was a positive day again for St Agnes AFC Ladies 1st & Reserves with two squads out on the pitch. The 1st team travelled to Bude putting in a decent performance especially in the first half, but unable to capitalise on their efforts. 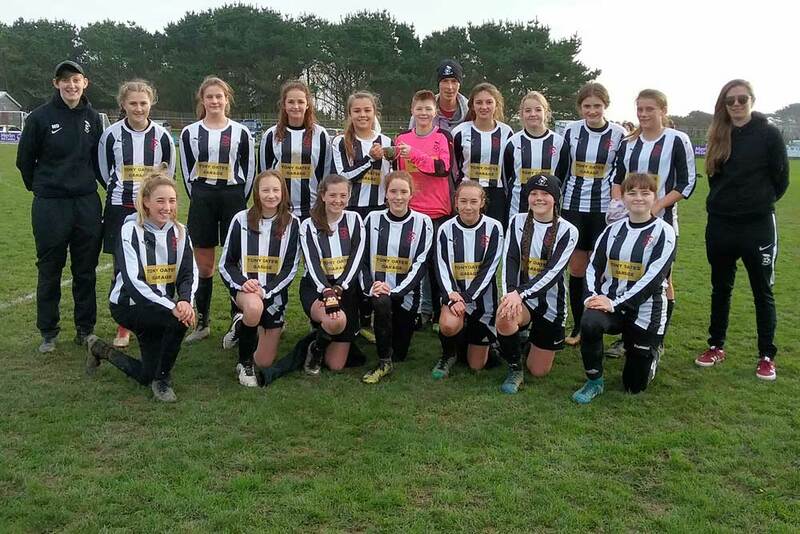 The score 3-1 to Bude with Abbie Carveth on target for the visitors: scoring her second goal in her second SWWFL fixture and gaining her joint St Agnes 'Maid of the Match' with 'keeper Harley Gonzales growing in confidence every game. 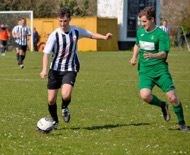 The reserves were home to a rejuvenated, improved Culdrose team who opened the scoring in the CWFL League Cup fixture. St Agnes reserves rallied back to a convincing 7-4 win with the on form Charlotte Collier bagging 4, Rachel Blackham heading one home from a Charlotte Collier corner and new to the club this season Megan Pearce scoring her first goal in St Agnes colours and then a second gaining her the home teams 'Maid of the Match' for an excellent performance all game. 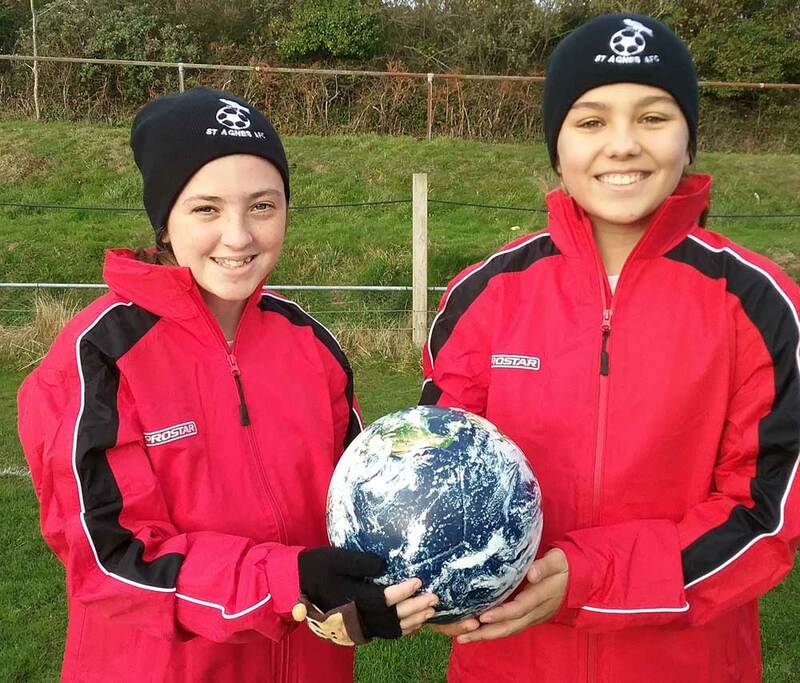 The match was marred when, after a penalty was awarded to St Agnes as a player was brought down in the area, the Culdrose 'keeper was shown a red card for foul launguage to the referee and received a second red card as she continued the language as she left the pitch of play. 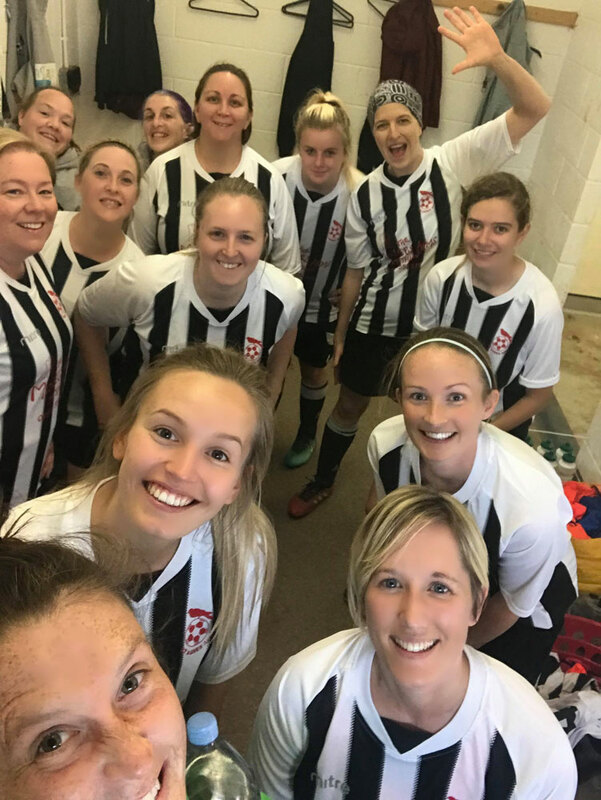 St Agnes Ladies are back to training on Wednesday evening 7-8pm at Truro College astro-pitch all welcome with both teams in League action next week the 1sts away v Plymstock and the Reserves at home to Wadebridge. 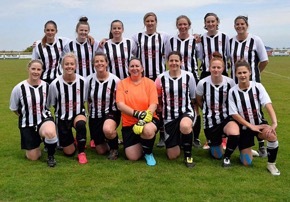 A positive weekend for the St Agnes AFC Ladies squad, successfully fielding two teams with the 1st team securing a point at home with a great 3-3 draw against a determined visiting Bideford who are presently sitting 4th in the league. On target for St Agnes Laura-beth Medcalf, Zoe Arundell-Lethbridge and with screaming volley from a corner: Mollie Dring! The 1st team are away at Bude next Sunday. 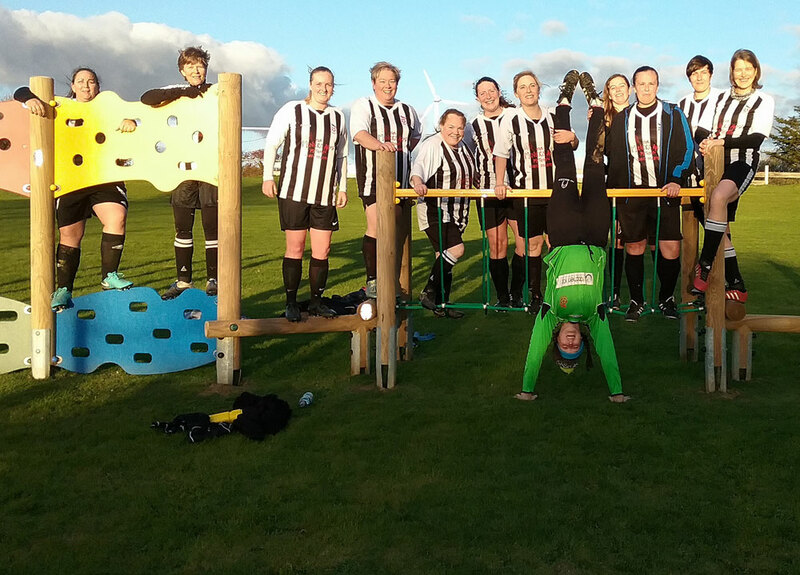 The Reserves travelled away to St Teath (with the obligatory team picture in the play park adjoining the pitch!) and faced a battling opposition who never gave up to the final whistle. 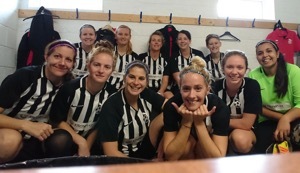 A good win for the Reserves 2-10 with goals from Charlotte Collier (4), Kaz Marsden (3), Rachel Blackham, Grace Dent and with a great debut appearance and goal from Oz Brazier. The reserves are home -v- Culdrose next weekend. 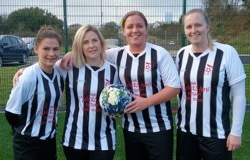 St Agnes AFC Ladies train on Wednesday evening at Truro College astro-pitch 7-8pm. 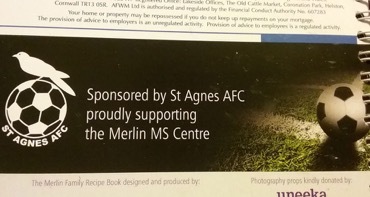 Thank you so much to our St Agnes AFC Under 7's Sponsors! 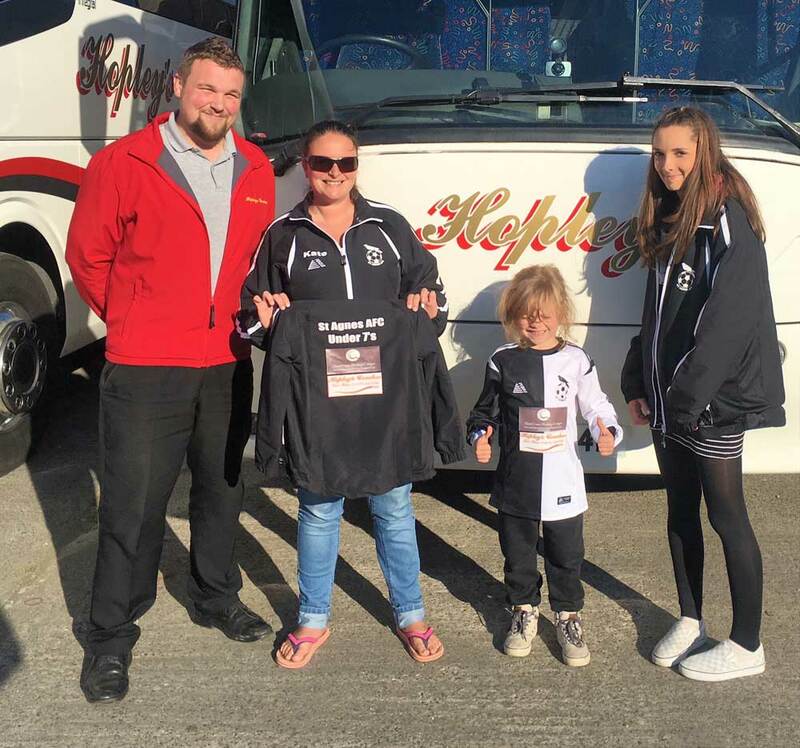 Thank you to Rob over at Hopley's coaches and Natalie from North Coast Holiday Cottages who sponsored our new kit and training jackets. All the coaches, the players and the parents really are very grateful to you both! 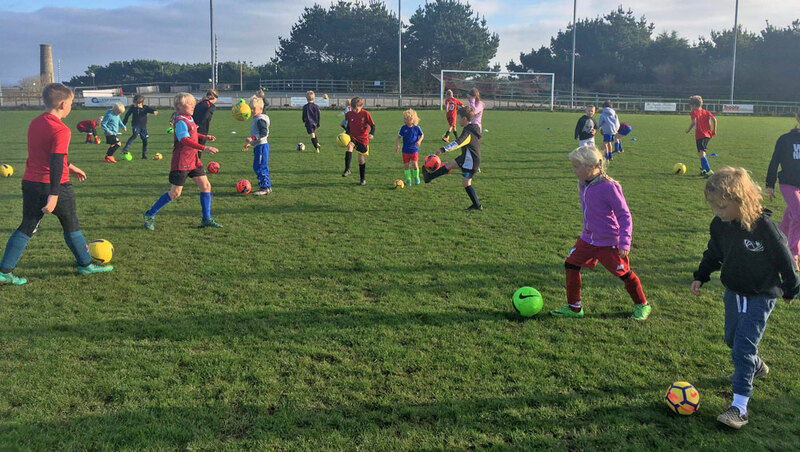 Well done to all the fabulous sporty youngsters who attended the St Agnes AFC Autumn Holiday Coaching Club today. 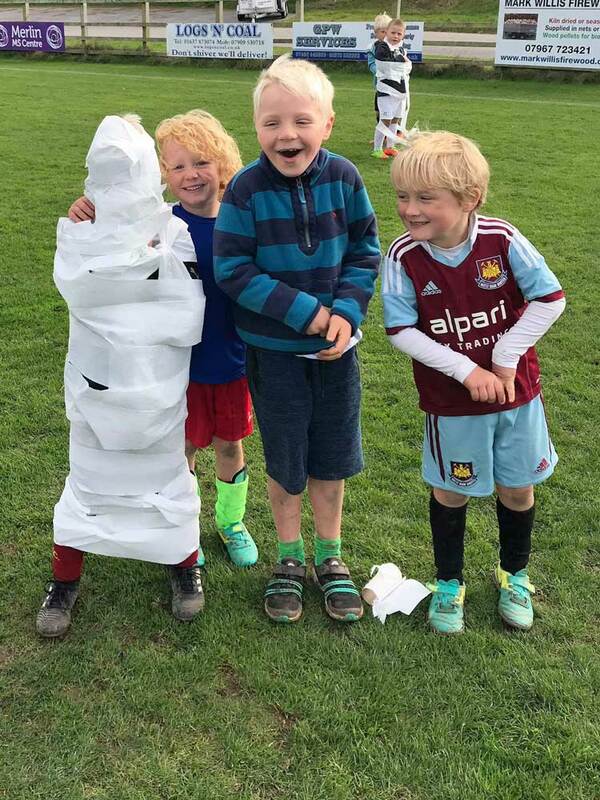 They were all brilliant at the Halloween themed activities including broomstick racing, pumpkin hide and seek, toilet roll mummies, Halloween Masks, football, rugby, donut on a string eating and so much more! 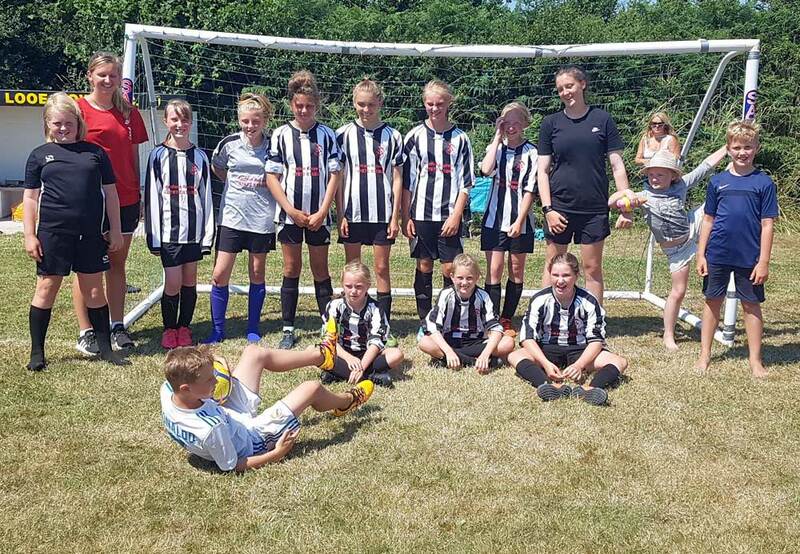 Thank you to coaches from St Agnes AFC Ladies who organised and hosted the event providing a great value day appreciated by children and parents alike and raising important funds to support football in our community! 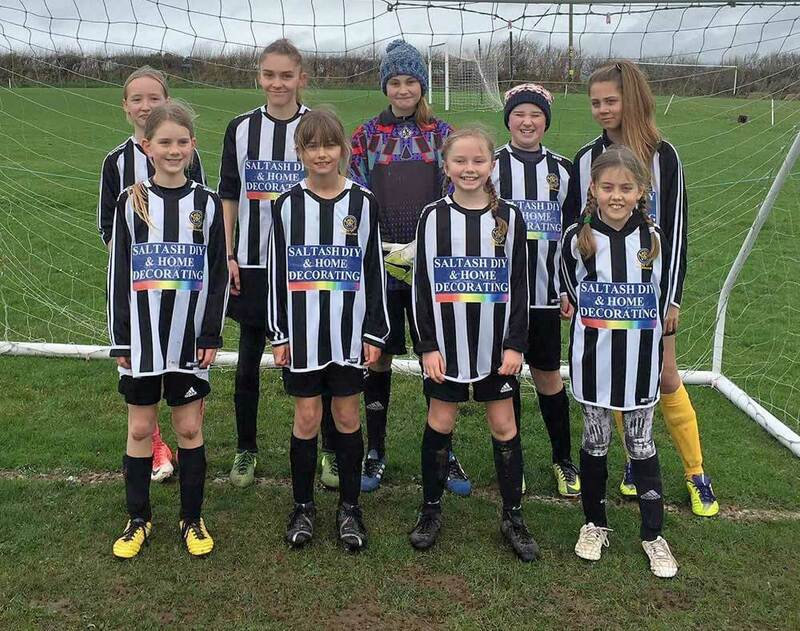 St Agnes AFC Dynamos Girls under 11's faced Helston away today and showed their great improvement in a spirited performance which started with a Respect handshake and continued respectfully throughout. Having lost to Helston by double figures last season the scoreline was not only down in single figures they scored a couple too! 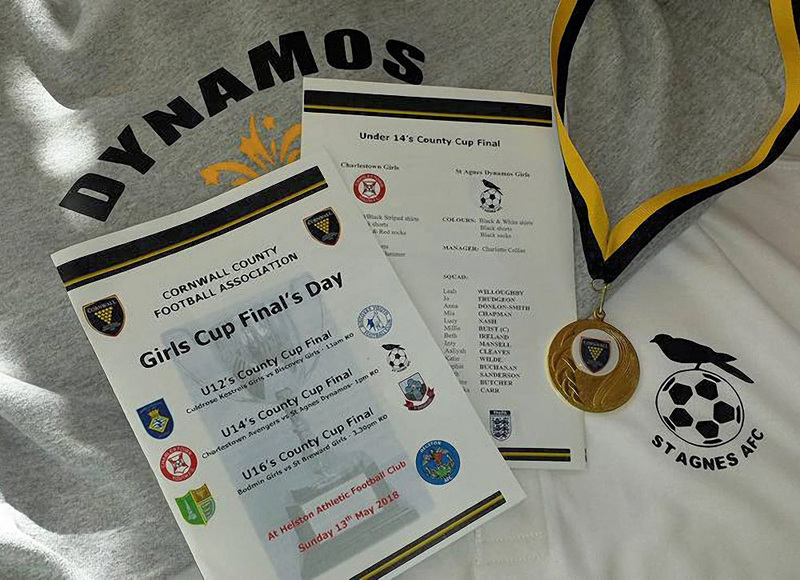 Thank you to coaches, parents and everyone who supports St Agnes AFC Dynamos Girls! Excellent turn out for training today from the St Agnes AFC mixed under 13's team. Any under 13's interested in joining this squad are welcome to get in touch for a season of KYFL Fixtures and grass and astro training. 07974 4370666. St Agnes AFC Under 10's were delighted to welcome their new coach/manager Sam Emery to training today and would like to thank everyone who has supported them and kept the squad together whilst a new coach was found. The team have a busy season of football ahead to look forward to with KYFL fixtures and a mixture of training on grass and astro. Well done St Agnes AFC Under 8's great concentration and effort at training today. Good numbers too for half-term with several away for the holiday. Exciting times watching the younger squads and teams develop! Fabulous session tonight with the St Agnes AFC SSE Wildcats. Awesome group of girls although getting all 14 to stay still at the same time for a photo proved challenging! 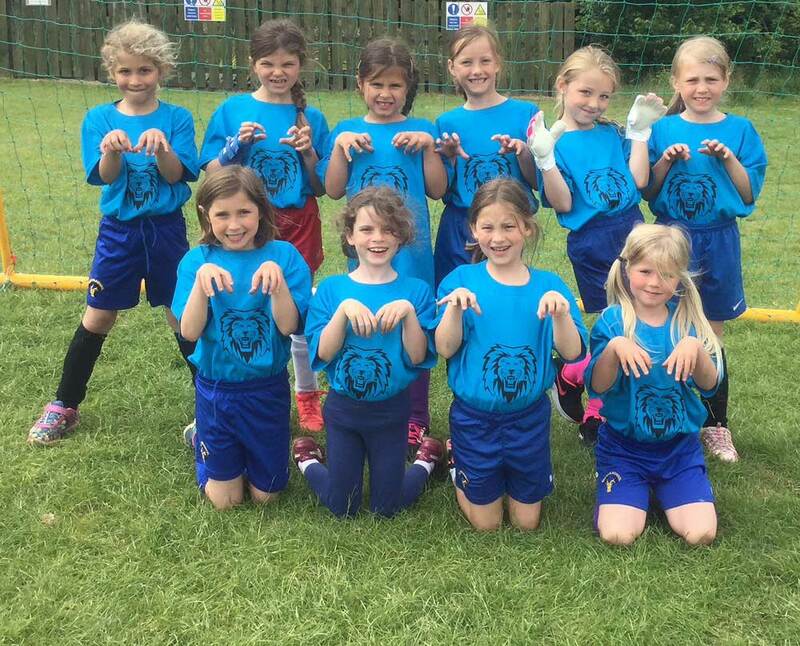 No half-term Wildcats next week 26th October, but they are back to fun, fitness, friendship and football the following week on Friday 2nd November 6-7pm (£2) all girls aged 5-11years welcome. Well done and thank you to their awesome coaches Charlotte & Claire! 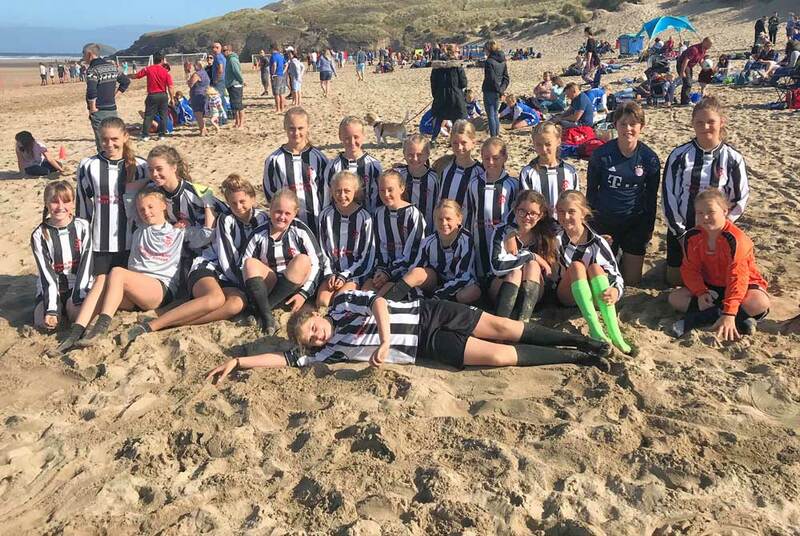 St Agnes AFC Dynamos Girls under 13's teams were both in action at the weekend with the Silvers securing another good win against Newquay in a well played fixture from both sides. The Whites team travelled to Helston securing their best result of the season in a respectfully played match the score 2-0 to Helston. Well done to the Whites (photographed) who are working really, really hard at training, putting everything into it and improving and progressing week by week We are all mega proud of them! 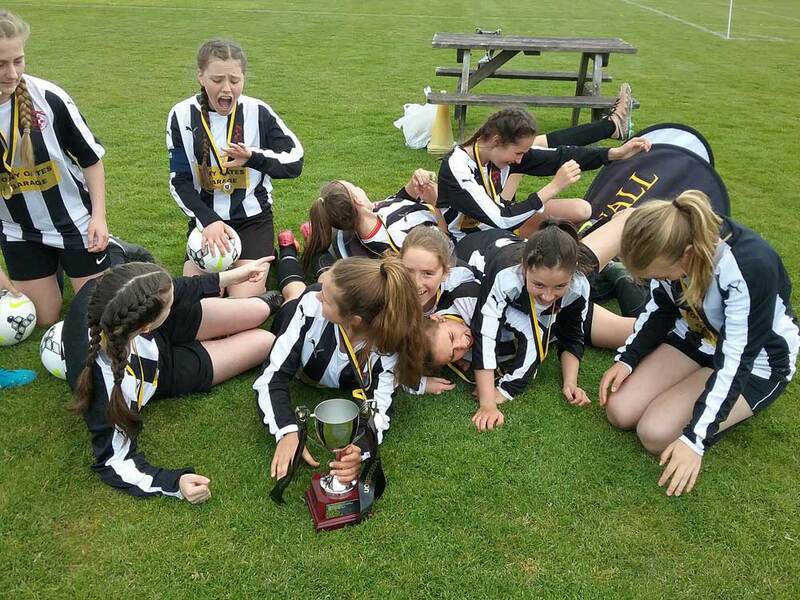 Thank you to their awesome coaches and everyone who supports all the St Agnes AFC Dynamos Girls in every way. 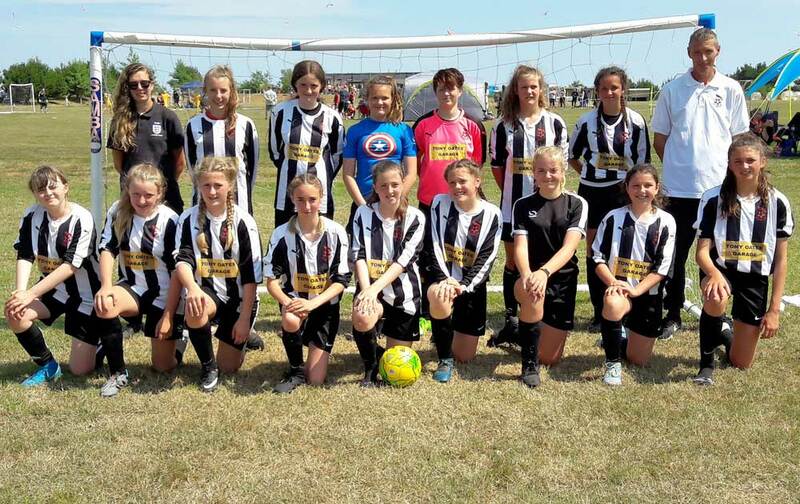 St Agnes AFC Girls Dynamos train 9-10am at Truro College (£2) all girls of any ability welcome to come along and join in ages under 15's, 13's, 11's, 9's & 7's. 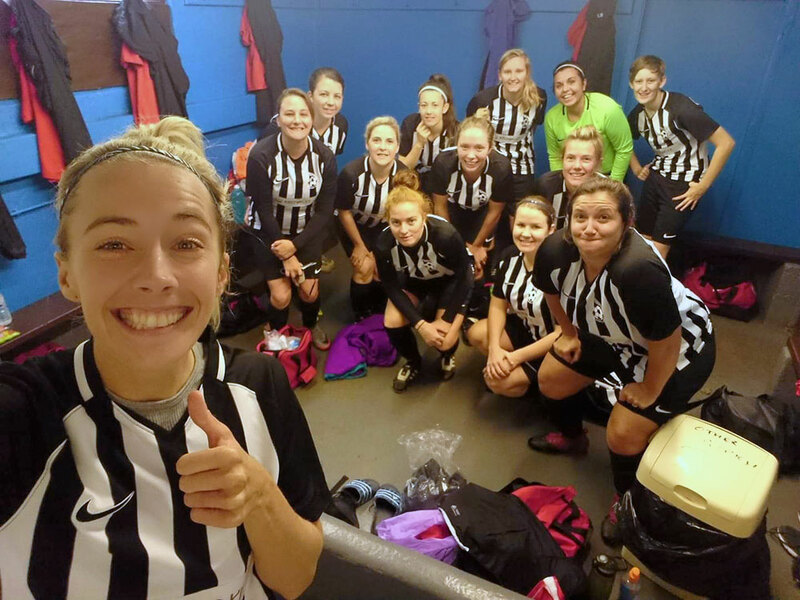 Both teams were in action again at the weekend with St Agnes AFC Ladies 1st team hosting Weston Super Mare LFC in a goal fest 6-6 draw! Goals from Laura-beth Medcalf (2), Debbie Duncan (3) and an awesome free-kick from Zoe Arundell-Lethbridge completed the St Agnes tally. Great debuts from Beth Willshaw, Stacey Tonkin and Abbie Carveth. 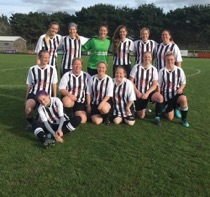 St Agnes AFC Ladies travelled to new team FXU at Falmouth in an end to end battle with Charlotte Collier bagging 2 and a splendid free kick from Kaz Marsden securing the 3rd in a 3-3 draw. 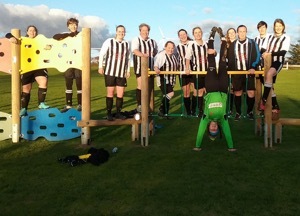 The team welcomed back Katie Ashworth from injury with Katie Skilbeck entertaining in the St Agnes goal. Either team could've come away with a win with FXU sending a penalty skywards over the bar and Charlotte Collier hitting the crossbar in the dying minutes a draw a fair result for all. 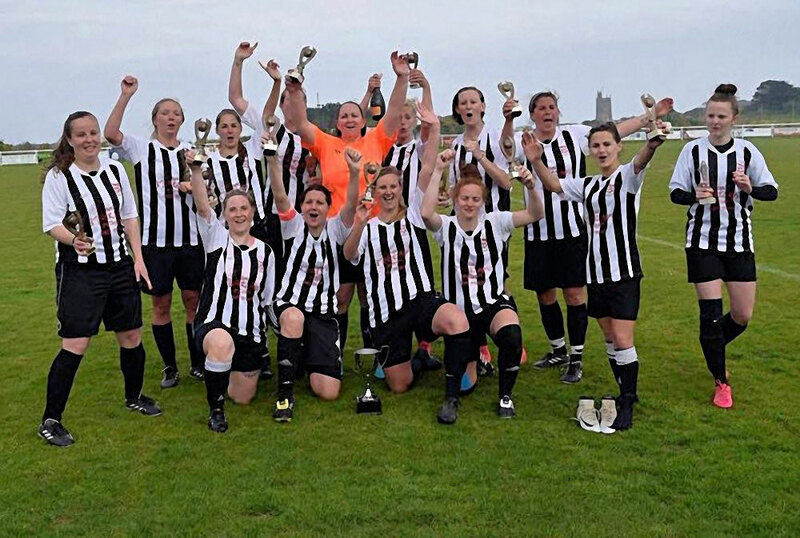 St Agnes AFC Ladies start winter astro-training this Wednesday at Truro College 7-8pm (£1), players 16 years and over welcome! 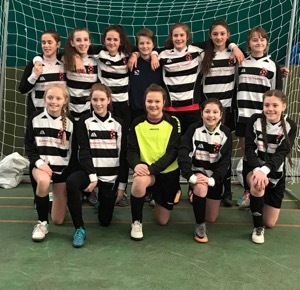 Well done to St Agnes AFC Dynamos Under 13's Girls Silver progressing through to the next round of the CCFA County Cup against a very good Helston team. Thank you to all volunteers and parents. It's a big thumbs up from St Agnes AFC Dynamos under 11's who massively enjoyed their CGFL game at home v Culdrose this weekend winning 2-1. Well done everyone and thank you volunteers and parents. Well done St Agnes AFC Ladies Reserves who faced higher division Illogan in the CWFL League Cup at Enys Parc as the underdog, expecting a hard fought fixture with their visitors progressing to the next round. An exciting end to end game followed with both teams playing some good and entertaining football. Ordinary time ended 2-2 with the score aet 3-3 (Charlotte Charlotte Collier scoring all three for St Agnes). Penalties followed with St Agnes winning 3-1 with a dramatic save from Katie Skilly in the St Agnes goal and Grace Dent calmly striking home the 5th and deciding penalty. 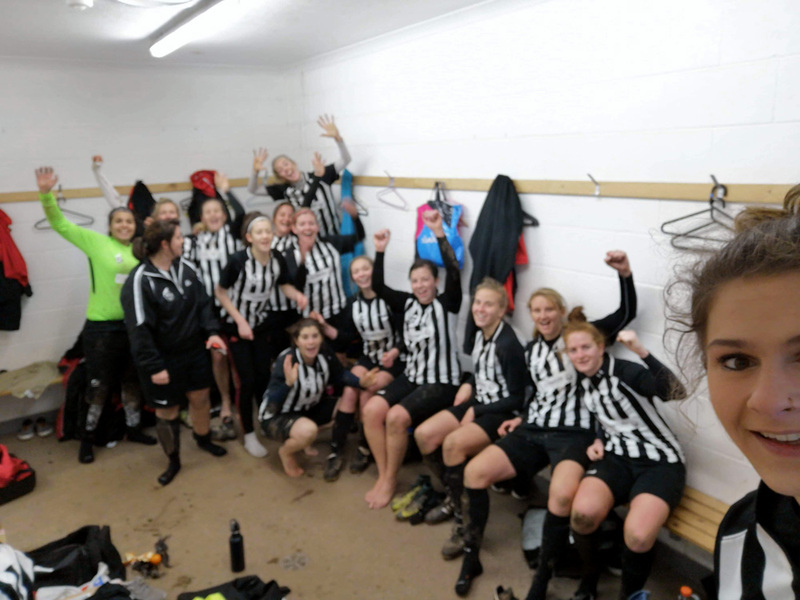 Good luck to Illogan Ladies for the rest of the season and well done Reserves progressing into the 1/4 Final! 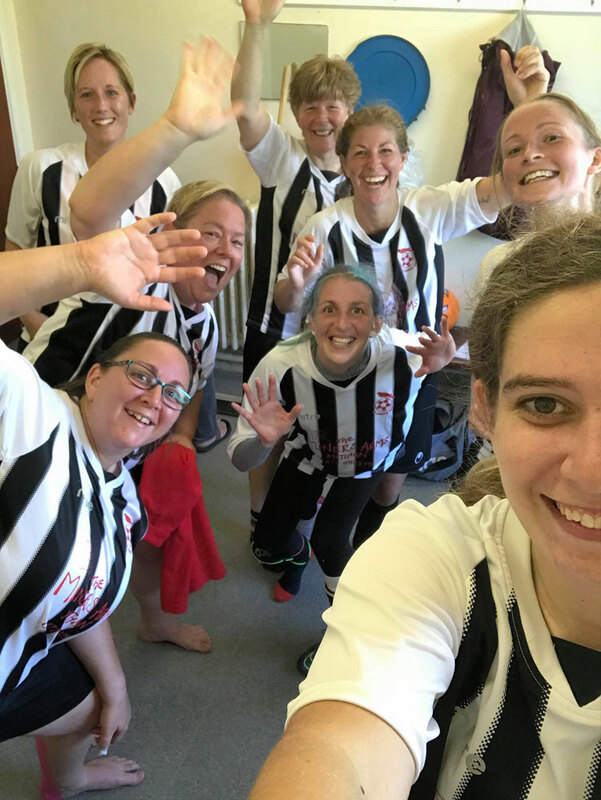 With a couple of late abstractions for the long trip to Weston Mendip Ladies St Agnes AFC Ladies 1st were 2-0 up through Debbie Duncan when reduced to 10 players through injury. A lack of subs led to a 3-2 win for the opposition. The team are competing really well in their new league and look forward to hosting Weston Super Mare Ladies FC at home next weekend. 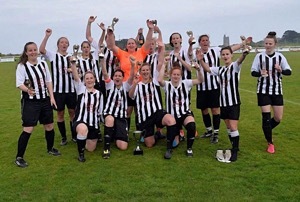 Well done St Agnes AFC Ladies 1st team we are all very proud of you! 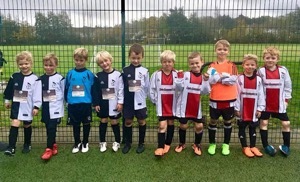 This weekend saw the next generation of footballing super stars take to the pitches as St Agnes AFC under 7's and under 8's both played their first ever fixtures. The enthusiasm, energy and excitement was infectious. Well done all players, coaches, managers, parents and thank you to all the amazing volunteers in grassroots football who help make this happen! 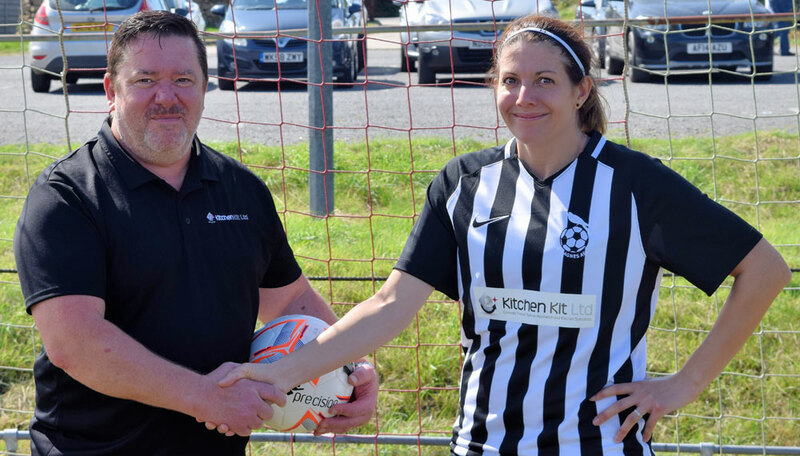 The newly promoted St Agnes AFC Ladies 1st Team unveiled their new kit and thanked their sponsor Nigel Dilley of Kitchen Kit Ltd ahead of their SSE Women's FA Cup fixture at Enys Parc. 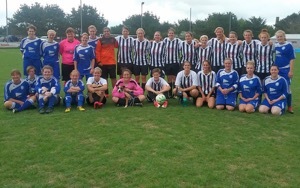 Hosting higher placed Keynsham Town Ladies Dev in the first ever FA Cup fixture in the whole of the St Agnes AFC Club over 100 year history the ladies gave a fabulous account of themselves. Alice Hope scored for St Agnes with the final score 1-3 to Keynsham who progress into the next round facing Swindon Ladies. 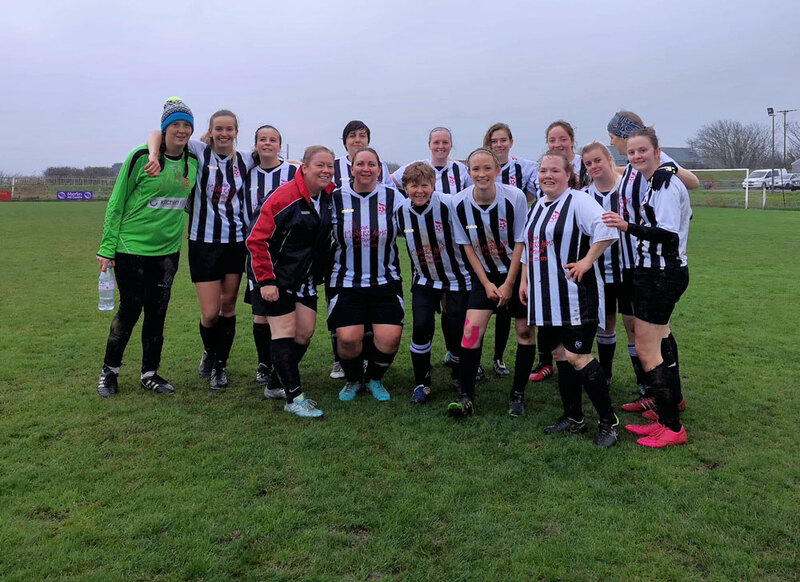 The 1st team SWWFL opening game was also a home fixture with Pen Mill Ladies making the long trek from near Yeovil bringing them a very 'direct' approach. 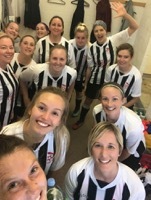 St Agnes ladies battled well and were rewarded with a good 3-2 win, with goals from Mollie Dring, Alice Hope and Debbie Duncan. Any new ladies interested in joining the St Agnes AFC Ladies 1st and Reserves squad are welcome to come along. 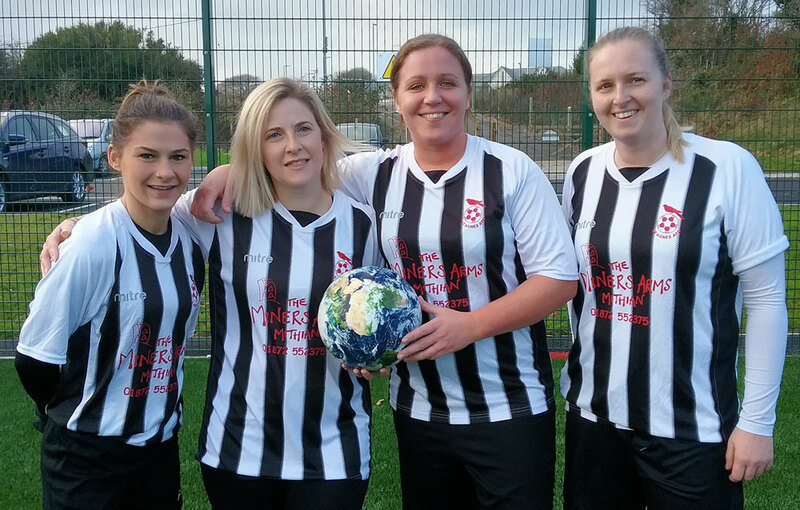 Sunday was probably one of the proudest days as football manager for Mandy Kimmins since starting St Agnes AFC Ladies 16 seasons ago, fielding for the first time ever two teams. 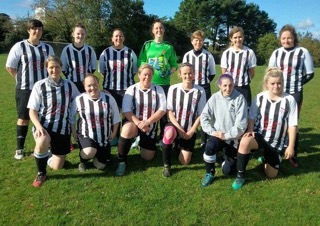 With our newly promoted 1st team hosting a very direct Penn Mill (near Yeovil) team at Enys Parc and winning 3-2 with St Agnes goals from Mollie Dring, Alice Hope and Debbie Duncan. 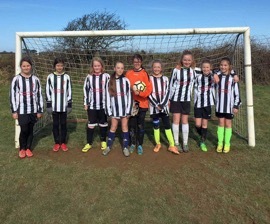 A fabulous start to the SWWFL season. 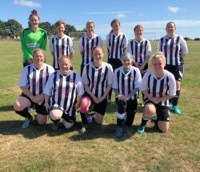 The newly launched St Agnes AFC Reserves travelled away to face a much improved Culdrose Ladies winning 8-0 with goals from Charlotte Collier (4), Lennon Lewis (2) and one each from Helen Jones and Victoria Stone. 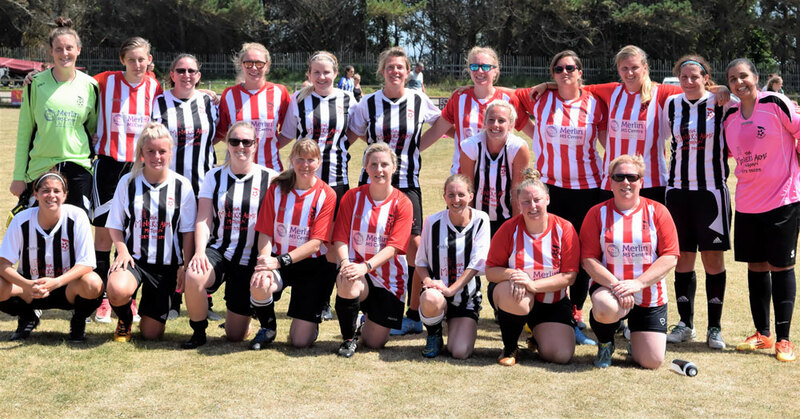 The 2018/19 Season is going to be a very challenging one for St Agnes AFC Ladies fielding two teams every week with increased travel and extra expense, but the squad are working very hard to make it happen. Additional players are welcome to come along to Wednesday evening training and to join our squad who are now the only club in Cornwall fielding two teams! Thank you to everyone who has supported, encouraged, sponsored and helped make this happen. 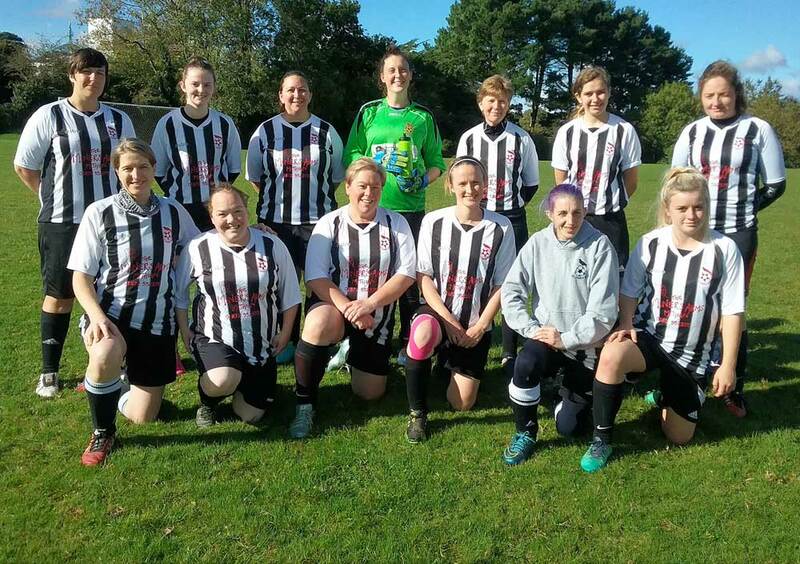 The newly launched (and photographed) St Agnes AFC Ladies Reserves would love to hear from anyone interested in sponsoring them thank you. 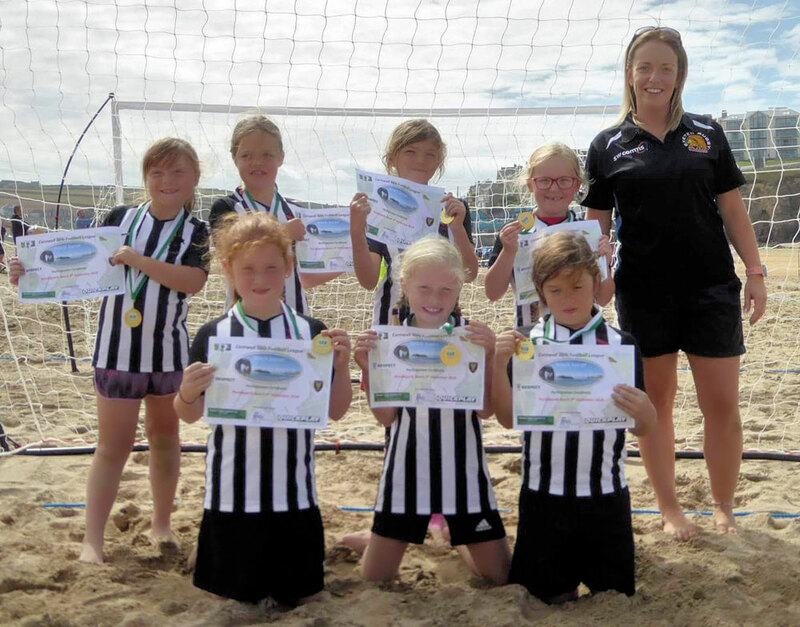 CGFL 2018/19 Season launch of the Beach Soccer event at Perranporth beach was totally awesome today and so well organised by the league members, volunteers and referees! 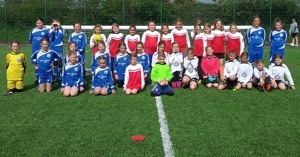 Over 50 members of St Agnes AFC Dynamos Girls (age groups under 15's, 13's, 11's & 9's) had a wonderful time. Special thanks to our fabulous coaches and tremendous supportive parents! 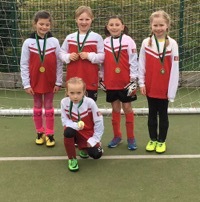 St Agnes AFC Dynamos Girls train on Saturday mornings at Truro College all players welcome. 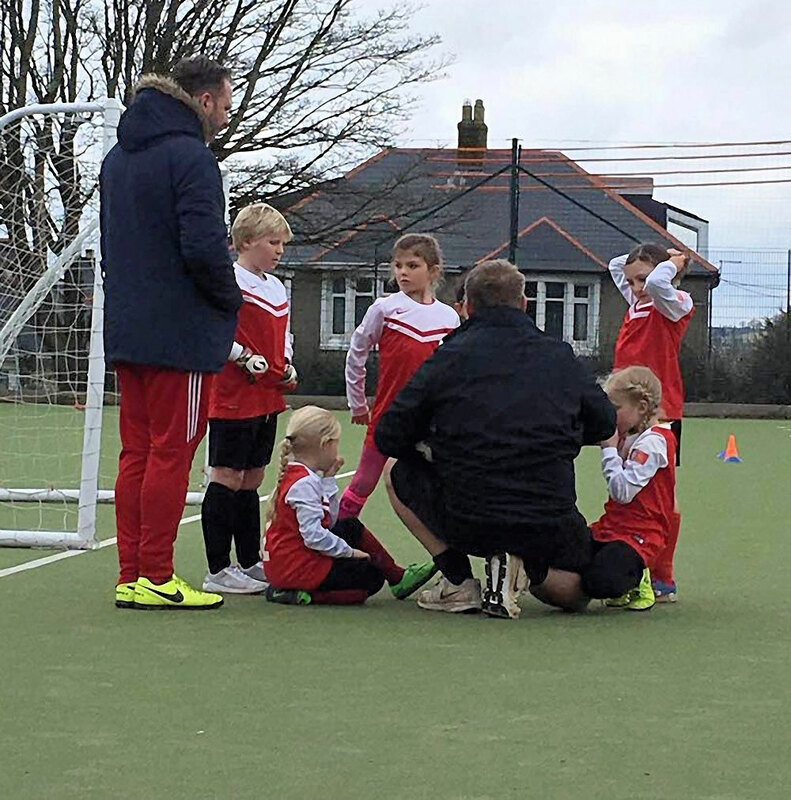 We will shortly be restarting our very popular SSE St Agnes AFC Wildcats and launching a new Under 7's girls group. 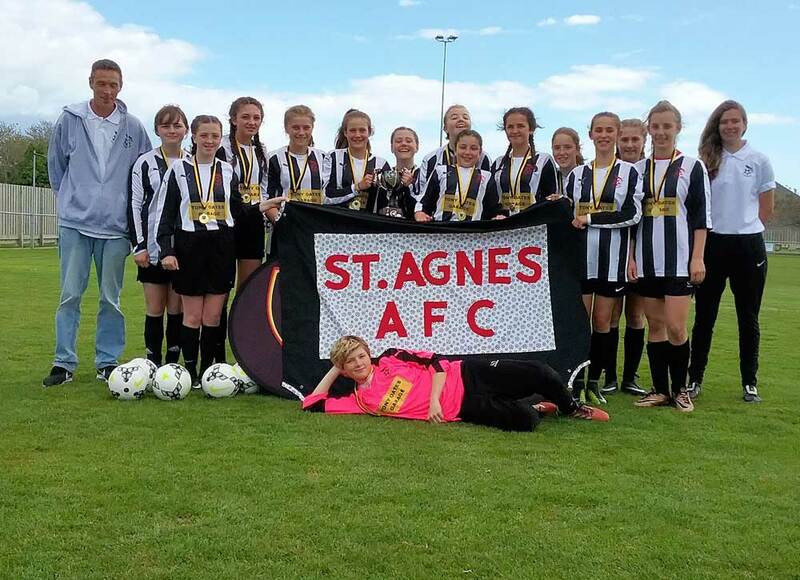 Exciting times for female football at St Agnes AFC all girls welcome. 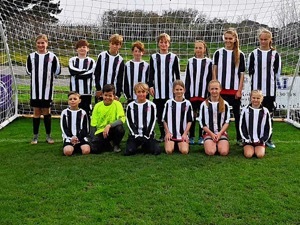 The new look St Agnes AFC Under 13's (mixed) had a great start to their 2018/19 Season hosting Penzance at home yesterday in the KYFL. Goals from Sam (2), Fred (2) and Stan also on target for a 5-3 win. Well done players, coaches, parents and all! 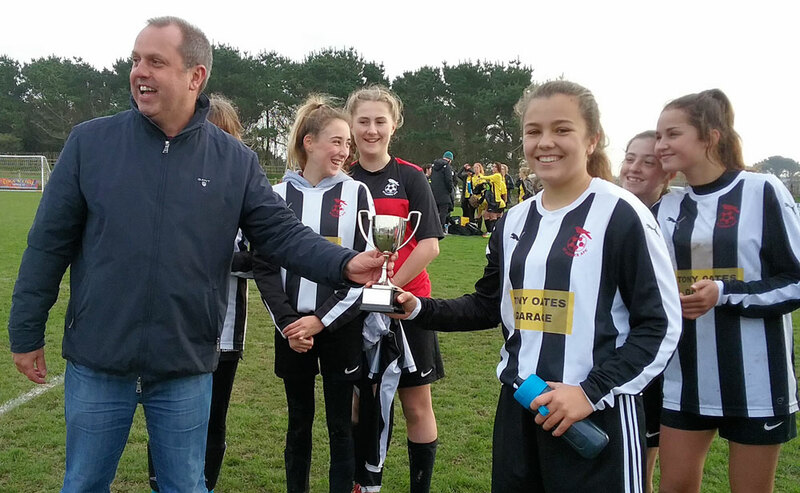 Paul Simpson welcomes the funding success of St Agnes AFC. 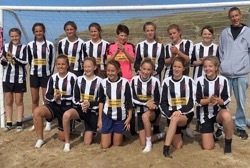 England Under-19s Head Coach, Paul Simpson, believes funding from The FA’s Retain the Game scheme could help to secure the long-term future of St Agnes AFC. 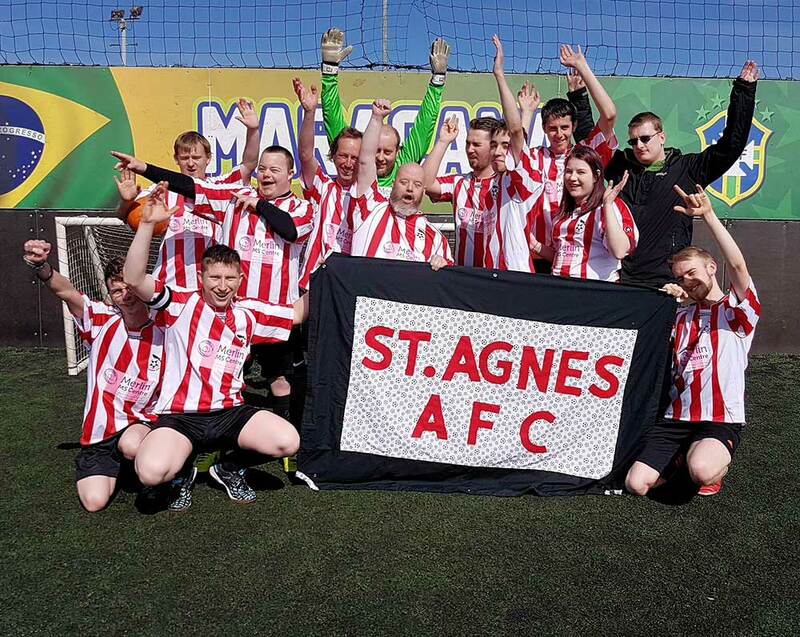 The grant, which has been awarded to help aid the retention of adult male teams within grassroots football, will enable St Agnes AFC to sustain their three adult male, veterans and flexi-league teams over the coming years. Retain the Game is a programme funded by The FA and delivered by the Football Foundation. 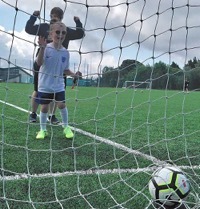 It awards grants of £750 to existing grassroots football clubs to boost their financial sustainability and allow them to continue offering playing opportunities in organised football. 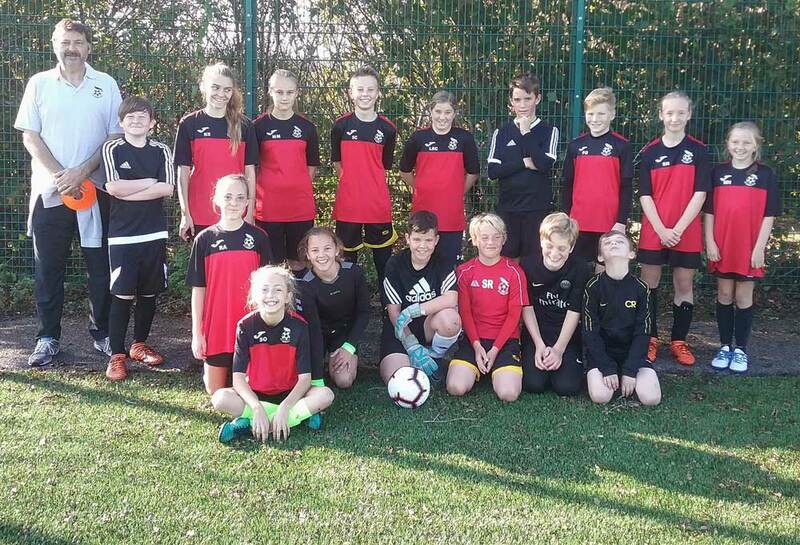 Funding has been targeted at clubs that operate with two or more male teams aged under-17 and above, and either currently hold The FA’s Adult Charter Standard Award or commit to attaining the award within the next footballing season. The strategy aims to encourage more clubs to strive for Adult Charter Standard, with research from The FA demonstrating increased levels of sustainability and player recruitment for teams with this award. 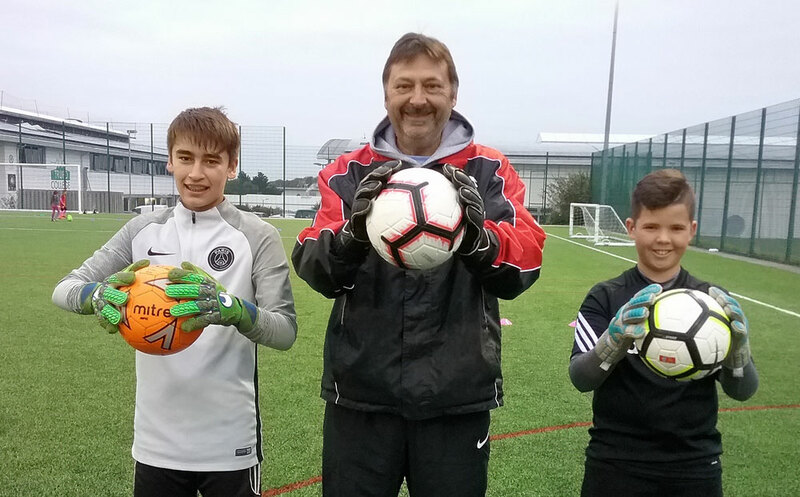 Paul Simpson, England Under-19s Head Coach, said “It’s great to see The FA and the Football Foundation supporting participation in the adult male game at the community level. 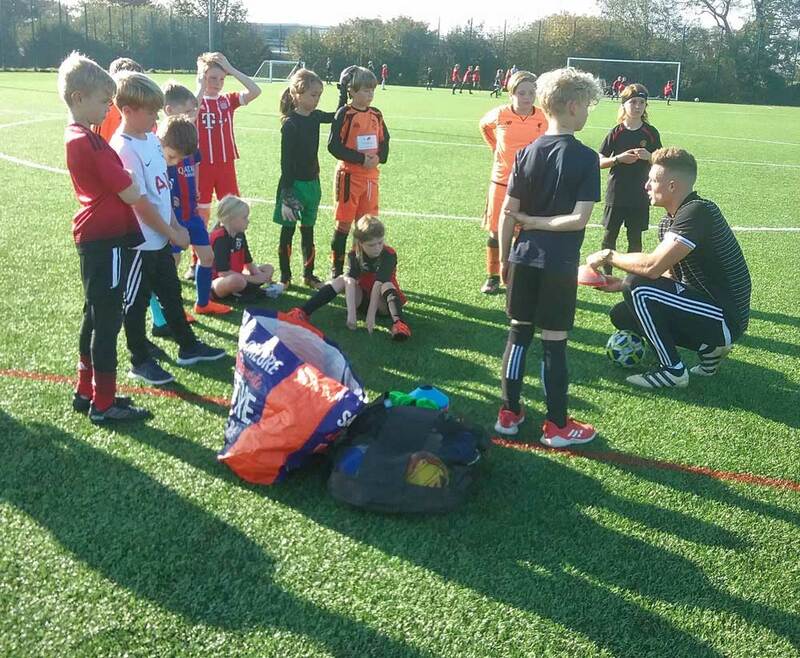 Affordability has often been identified as a key barrier, so this grant will ease the financial burden placed on clubs and allow them to concentrate on providing access to competitive football. 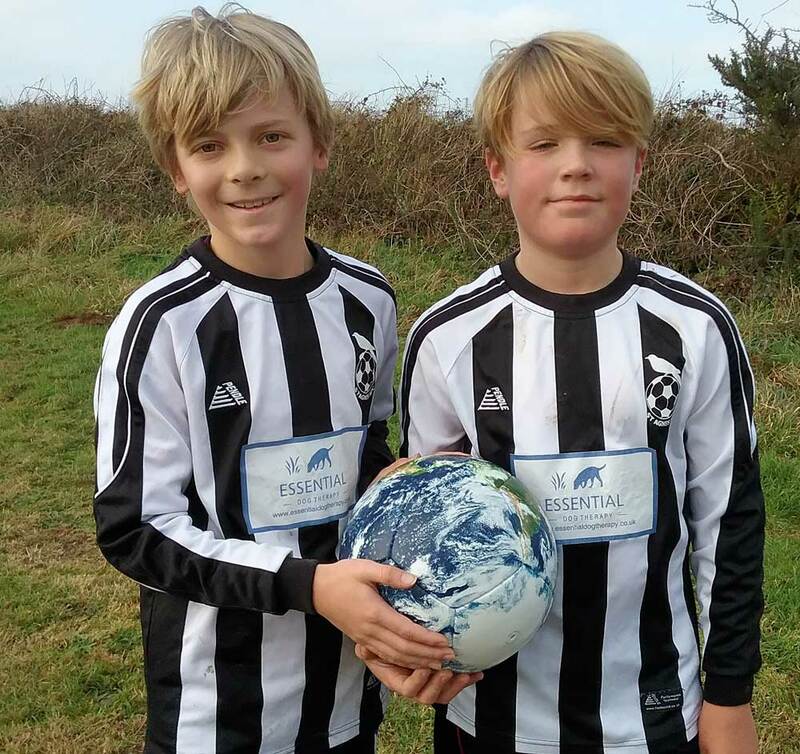 It is very pleasing to see St Agnes AFC taking advantage of this pilot scheme and ensuring that they look forward to a bright future, providing regular opportunities for local people to enjoy the benefits of playing our national game”. Money invested as part of Retain the Game will go towards covering core costs - including matchday and training facility hire - first aid training and new Nike kit and equipment through a bespoke voucher. The new scheme has further bolstered The FA’s efforts to increase participation in grassroots football. 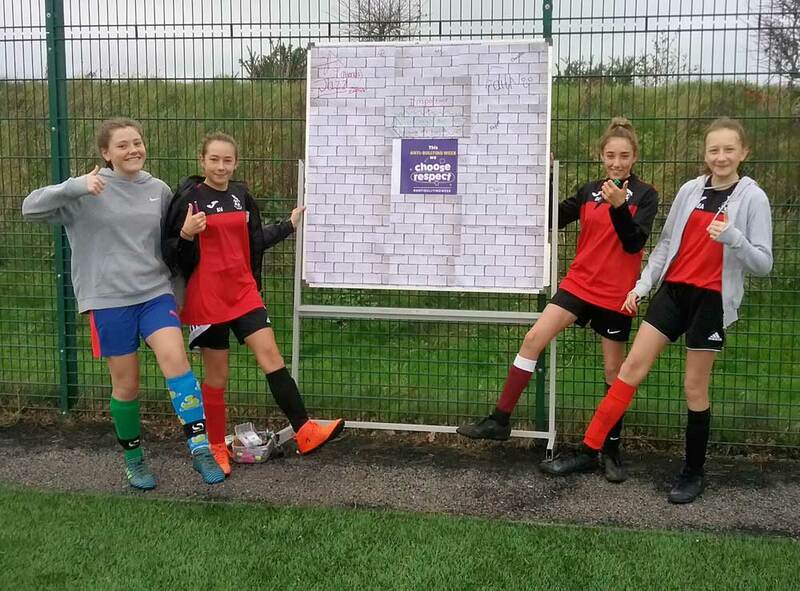 Earlier this year, they also awarded grants of £1,500 as part of their Grow the Game programme, with particular emphasis placed on boosting the number of female and disabled grassroots football teams. Martyn Kimmins St Agnes AFC 1st Team Manager, said "We have been awarded a Retain the Game grant from FA & Football Foundation! This money will mean we can help keep funding our adult male teams and provide a platform to keep playing the game. 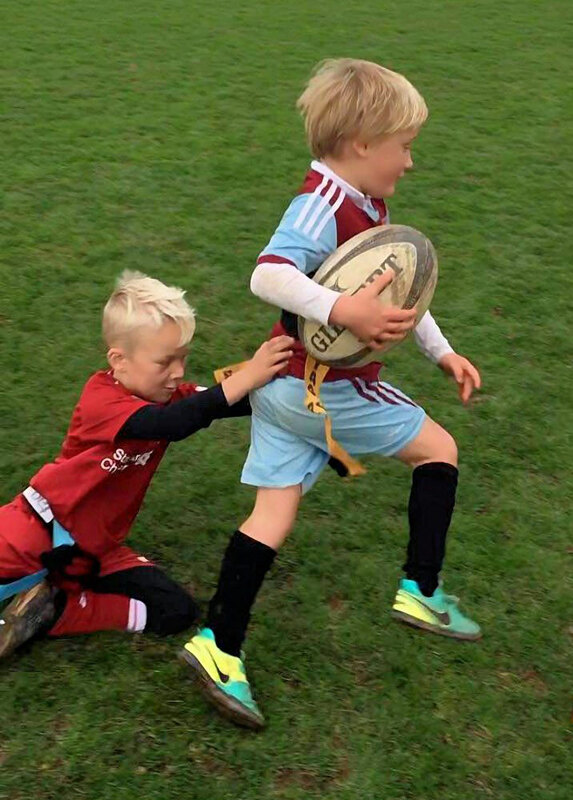 For many years the emphasis has been on 'growing the game' and its fabulous to see an initiative to help us try to retain the adult male game". 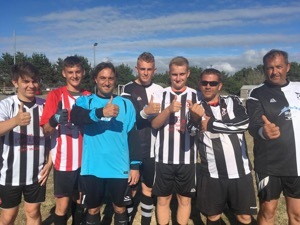 Photo attached Representatives of St Agnes AFC different Men's Teams giving Retain the Game the thumbs up! St Agnes AFC 3rd team are very grateful to Fay Caruana of Daisy Fays Nursery for generously sponsoring their new polo shirts for the 2018/19 Season. 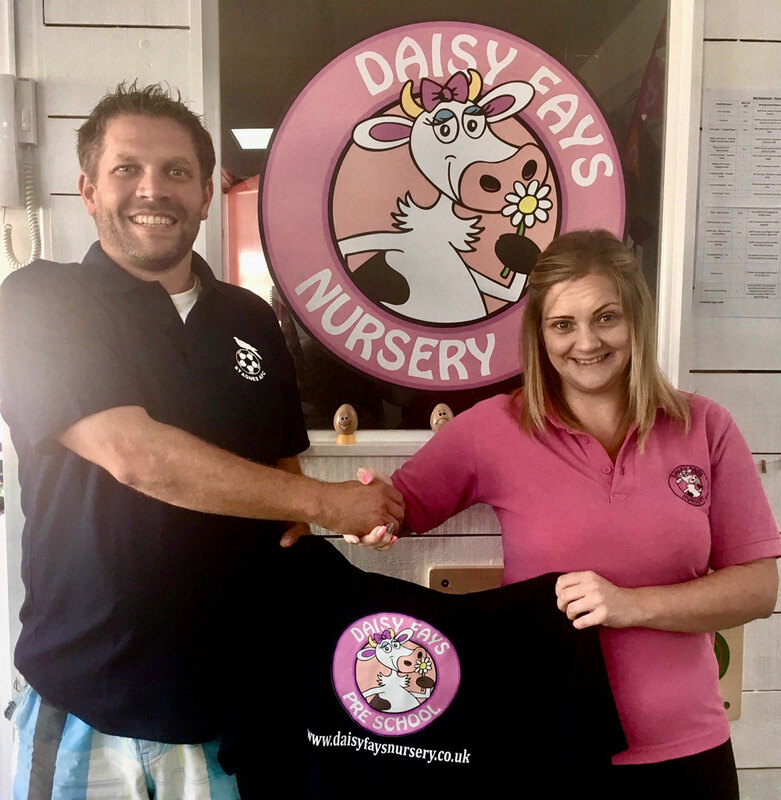 Manager Chris Wells is photographed receiving new polo shirts from Sophie on behalf of Daisy Fays. 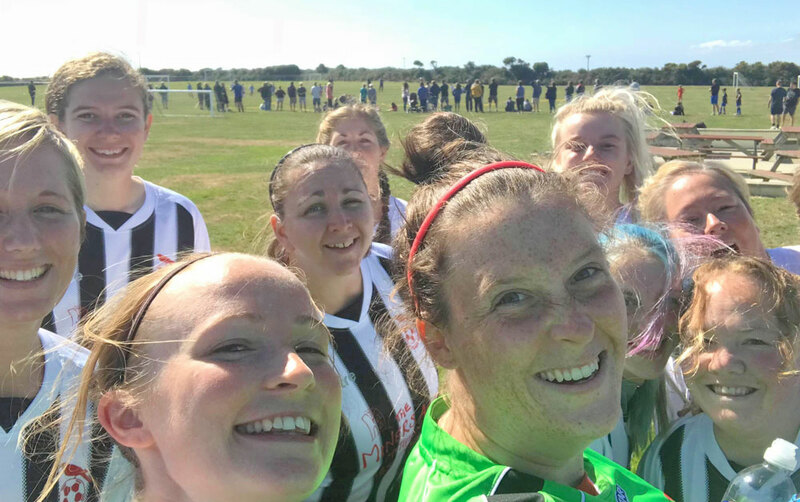 St Agnes AFC Ladies enjoyed welcoming Halwill Ladies from Devon to Enys Parc at the weekend for a really entertaining pre-season fixture. St Agnes 5-2 Halwill. 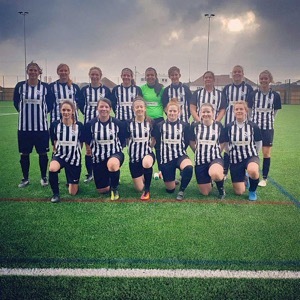 Good luck to Halwill Ladies for the 2018/19 Season. 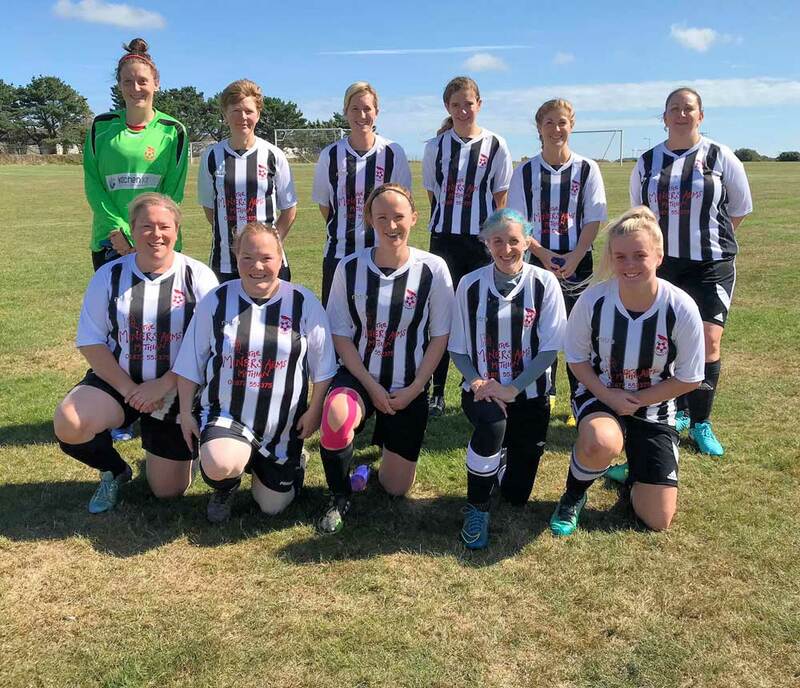 St Agnes AFC Ladies will be fielding two teams for the 2018/19 Season 1st in the SWWFL and Reserves in the CWFL and would welcome additional players of any level of ability or experience to Wednesday evening training. 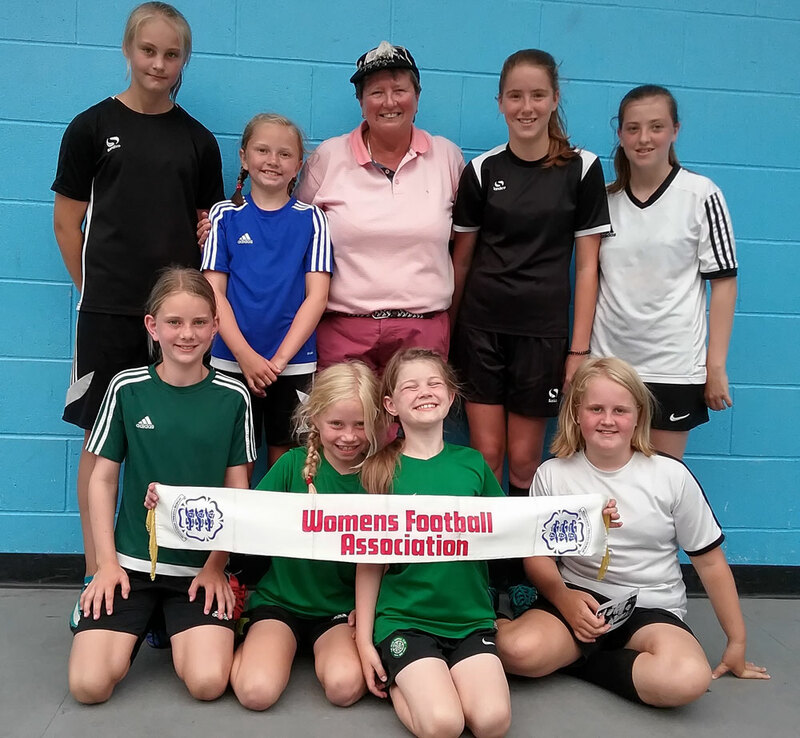 Members of St Agnes AFC Dynamos Girls were very excited to welcome former England Ladies football player Pat Firth to training on Saturday! Pat, who was the first ladies player to score a hat trick for England, during her debut aged 16 years versus Scotland in 1973, enjoyed meeting coaches and parents and watching the Dynamos train. Following training and with refreshments shared Pat had the players captivated with stories of her England Ladies playing days from scoring the debut hat trick with goals one left foot, one right and a header to receiving a 'payment' of half a dozen eggs following one match. Pat explained how female football had not been permitted to be played by the FA historically and deemed unsuitable for women moving on and within her era the lack of support with kit and facilities during her playing days. 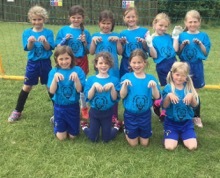 This led to the question of the day from under 8's player Destiny "Were you stinky if you had no showers?" Pat's response "Yes i expect we were!" 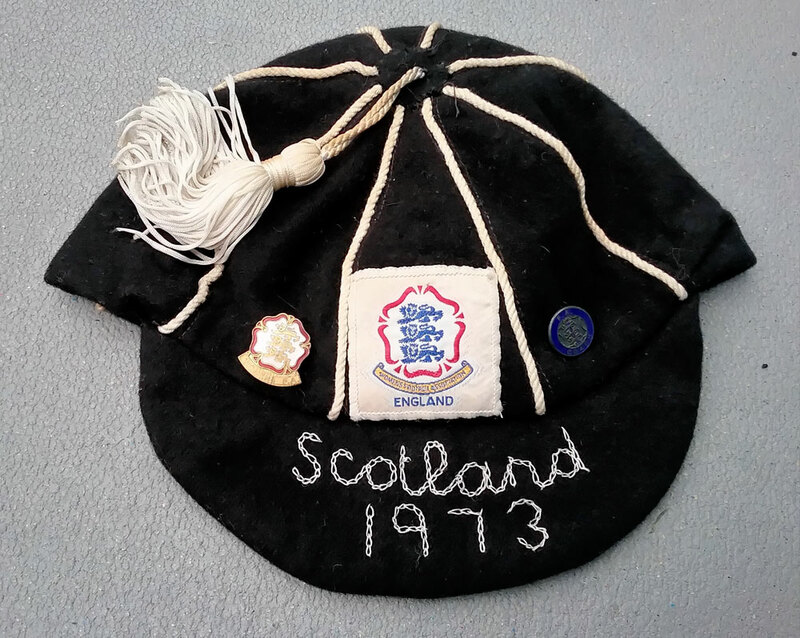 Pat brought her England Cap and Women's FA Scarf with her explaining they only received one cap regardless of how many games they played, unlike today when players receive a cap for every game, but her's was handmade as was traditional then. 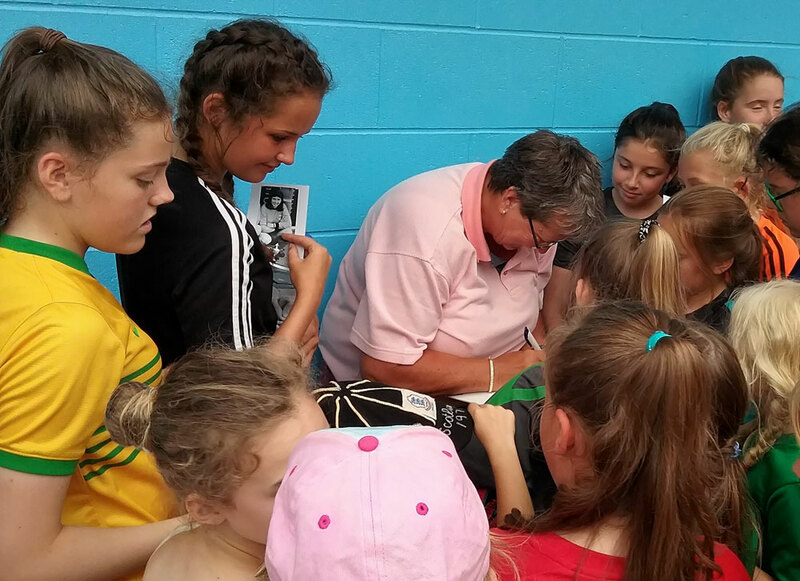 Players, parents and coaches were inspired by her stories and the girls loved trying on her England Cap. 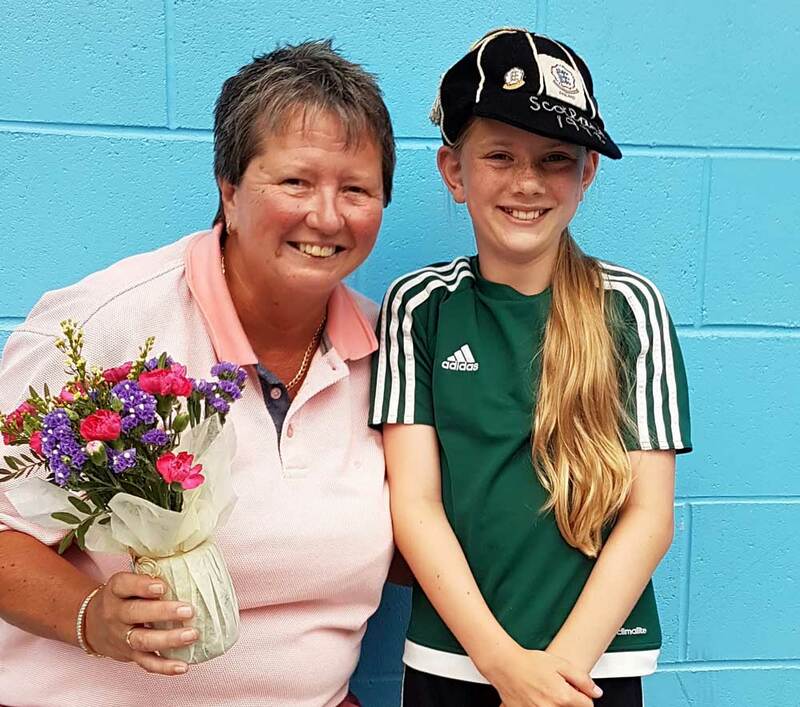 Presenting Pat with flowers under 13's player Brydie said "Thank you it has been brilliant to meet you and hear your stories." Summing up Pat said " Thank you for inviting me along it has been wonderful to see female football in safe hands at St Agnes AFC. 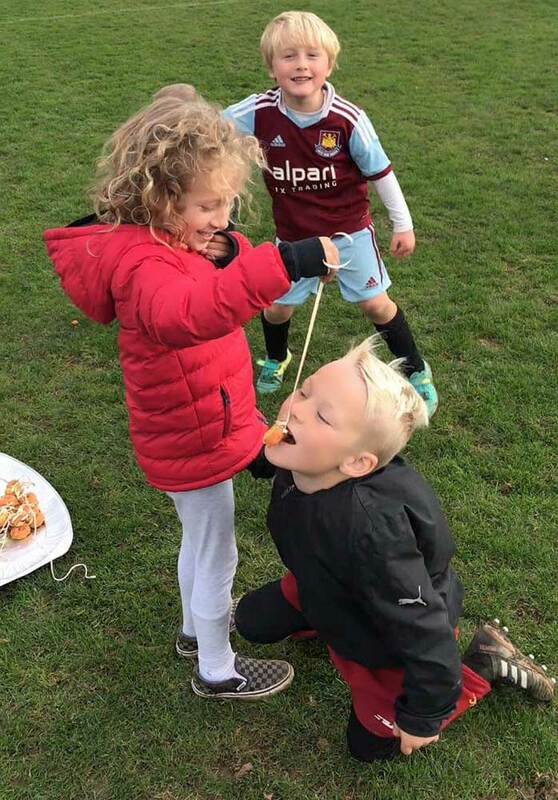 I am almost jealous of the opportunities girls have today within football. Work hard, train hard and follow your dreams. I hope to come and watch some of your matches when the season starts." 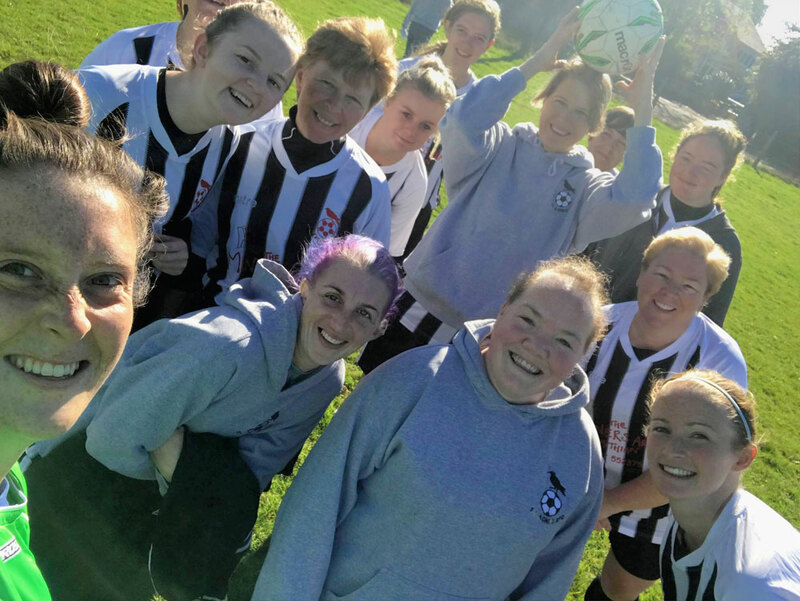 With her playing career cut short by injuries Pat went on to become a pioneering coach within both female and disability football and following her time with the girls met and chatted with members of the St Agnes AFC Dis-ability Squad. All photo permissions in place. 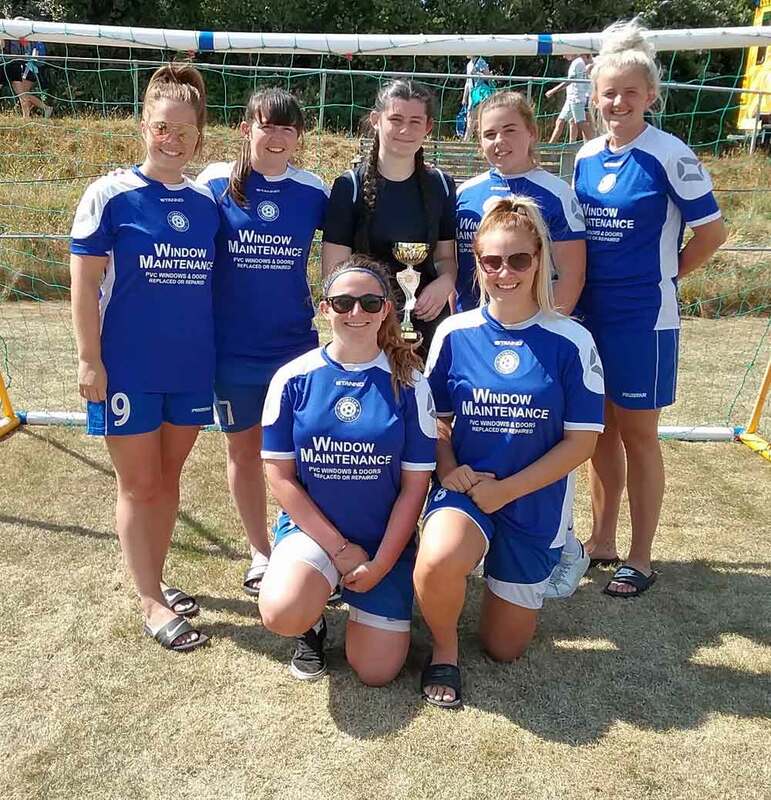 St Agnes AFC Ladies held their 10th Annual 7-a-side tournament on Sunday with lots of ladies playing football at Enys Parc. The league format event was won by Plympton Ladies from Devon on points (blue team photo attached) with Cornish sides Illogan and Wadebridge joint runner's up. 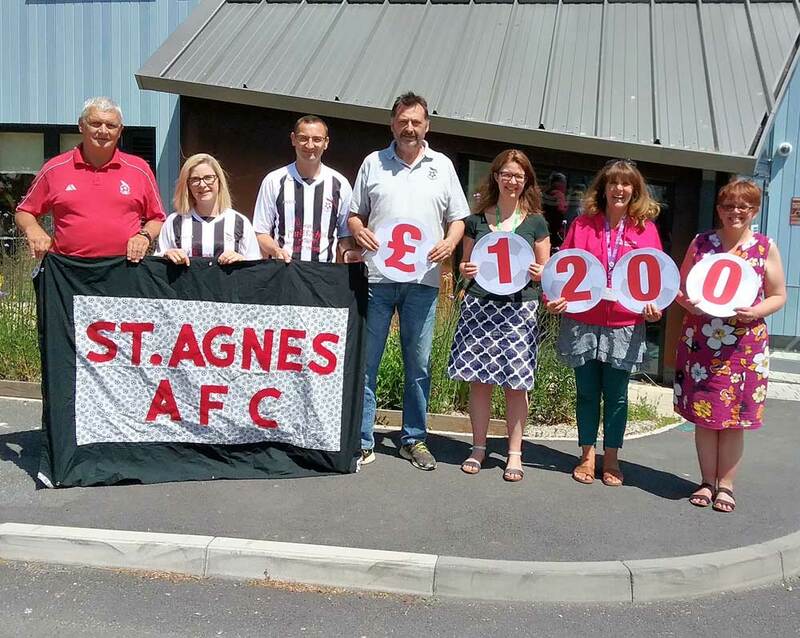 The proceeds from the day were split between Cancer Research UK and to support St Agnes AFC Ladies who will be running two teams for the 2018/19 Season. 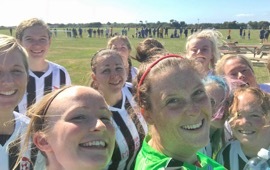 St Agnes AFC Ladies are already back at training on Wednesday evenings and would welcome new players of any level of ability to their set up. 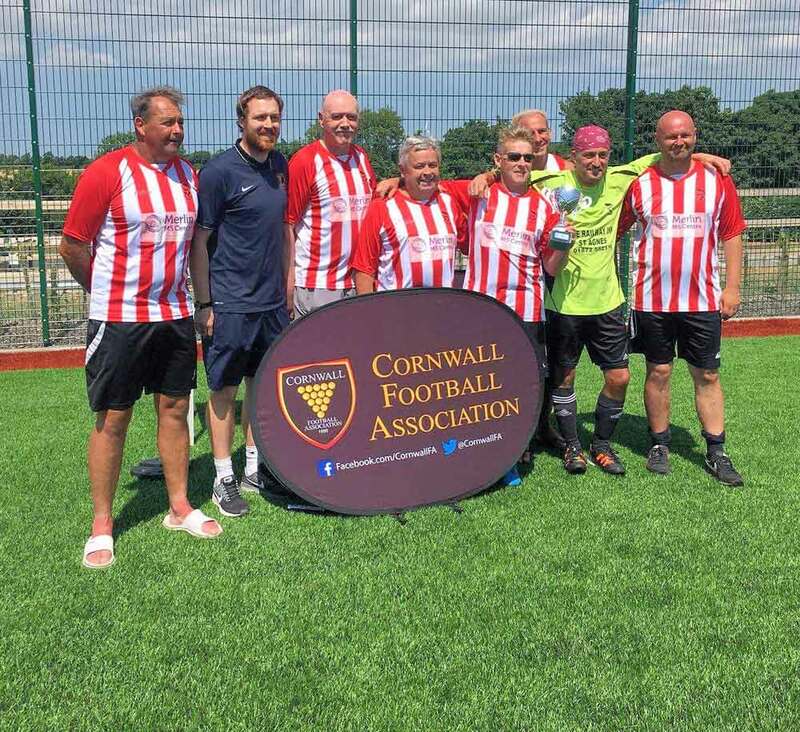 Massive congratulations to the St Agnes AFC Walking Football team winning the first Cornwall Walking Football Festival yesterday. 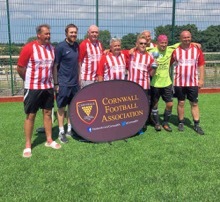 CCFA Cornwall Walking Football Champions! Fabulous! Anyone interested in taking part training night is currently at Enys Parc 6-7pm on a Tuesday - £2. Get in touch with Martyn Kimmins 07974 370666 or pop along and join in! "The best day of my life" was how 9 year old Teyah in her own words described her taster session at St Agnes AFC Dis-ability youth football. 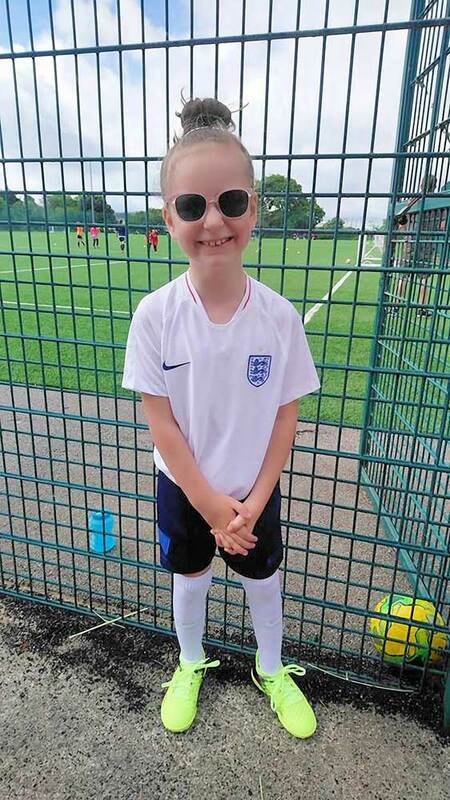 Dressed in her England kit Teyah, who has Peter's Anomaly and neuronal migration disorder meaning she is severly sight impaired with very low muscle tone, had a wonderful fulfilling experience taking part in football skills and scoring a goal. 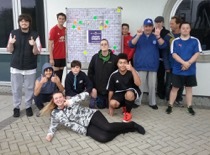 The taster session, which was attended and supported by Cornwall FA's newest FDO Vicky Fisher (Women's, Girls and Disability), forms part of St Agnes AFC's plan, following their successful application to the FA for funding, to enhance their present disability provision to offer youth and female football to players with disabilities. 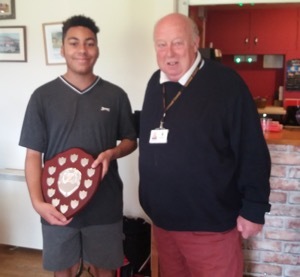 England Blind footballer Brandon Coleman has praised Grow the Game and St Agnes AFC following the award of a £4,500 grant over 3 years from The FA. 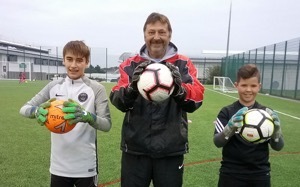 The grant, which will provide a boost to grassroots disability football in St Agnes and central Cornwall, has paved the way for St Agnes AFC Dis-ability to offer football to youth and females by funding equipment, fees and kit to support coaches to gain their qualifications to deliver the best possible enhancing experience for the players. 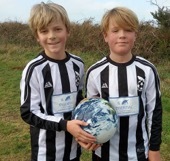 Brandon said “I am delighted that St Agnes AFC has been awarded a Grow the Game grant. 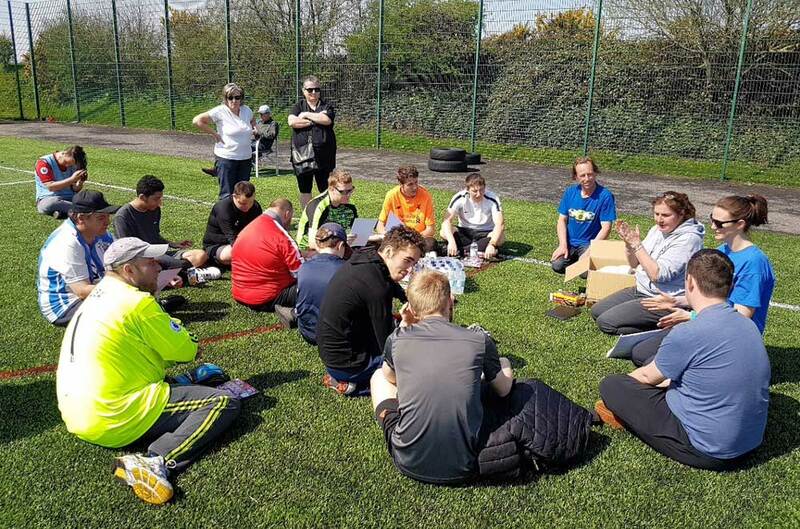 The club has worked extremely hard with Cornwall FA and the Football Foundation to give more local players living with a disability the opportunity to get involved in the game. 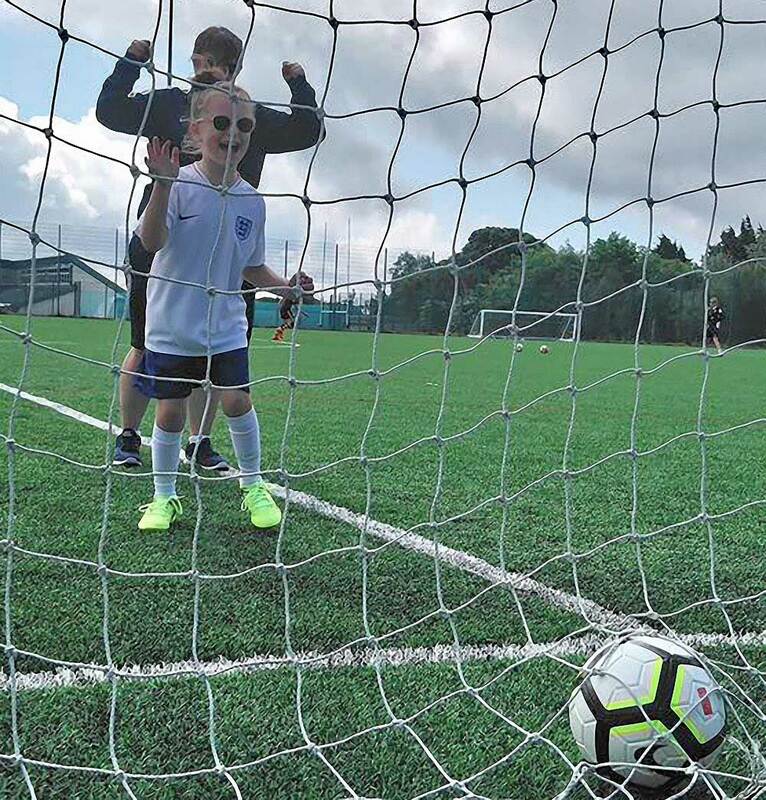 Playing disability football from a young age not only provides a number of physical, mental and social benefits, but gives players the best chance to develop skills and achieve their potential. 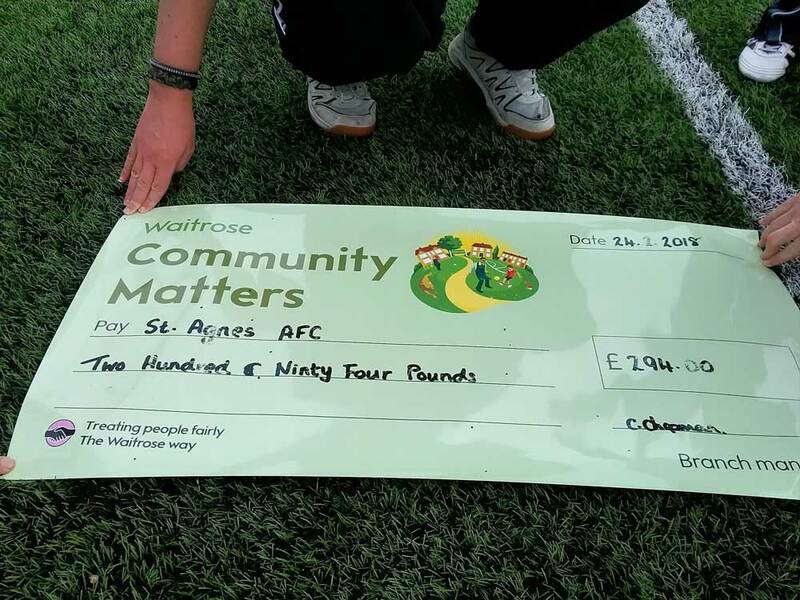 It is fantastic to see this money flowing down to the grassroots of the game and I wish St Agnes AFC the very best of luck for next season”. Grow the Game is a programme funded by The FA and delivered by the Football Foundation. It awards grants to grassroots football clubs that wish to create new teams, especially amongst under-represented groups. 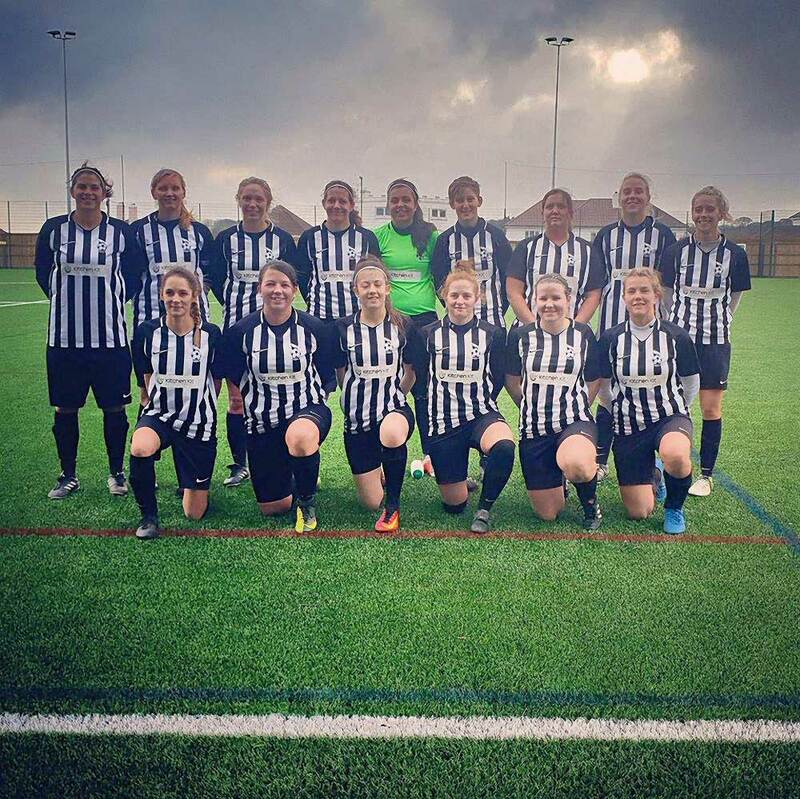 This year funding was made available for clubs looking to create new female and disability football teams to help towards the costs of FA coaching courses; FA league affiliation costs; referees’ fees; first aid kits; football kit and equipment. 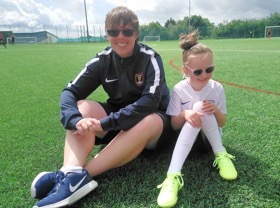 St Agnes AFC Chair Mandy Kimmins said " This grant over three years from the Football Foundation will help our club offer Teyah and other young and female players with disabilities an inclusive footballing opportunity which is fabulous". 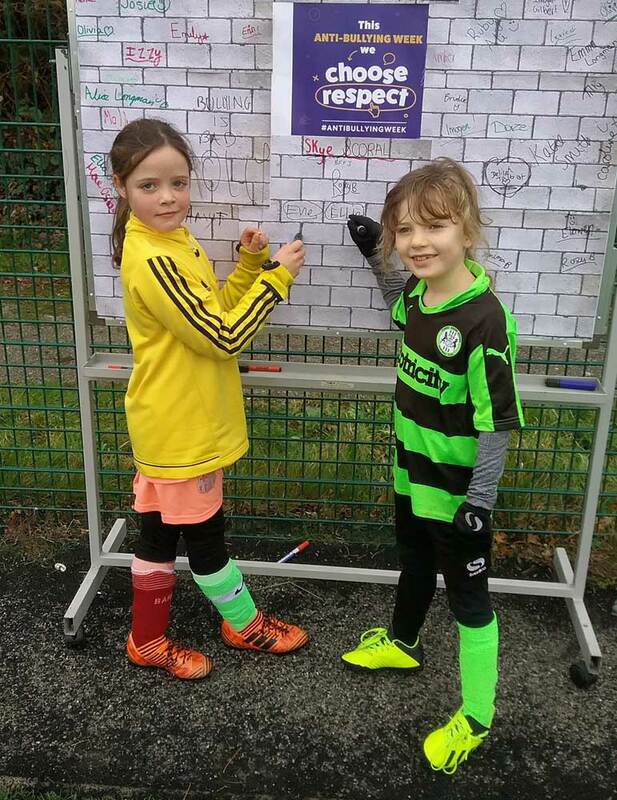 Teyah's mum Charlie, herself a ladies football player at St Agnes AFC burst into tears and said " I never thought I would ever see Teyah playing football. Thank you so much to everyone who has made it happen". 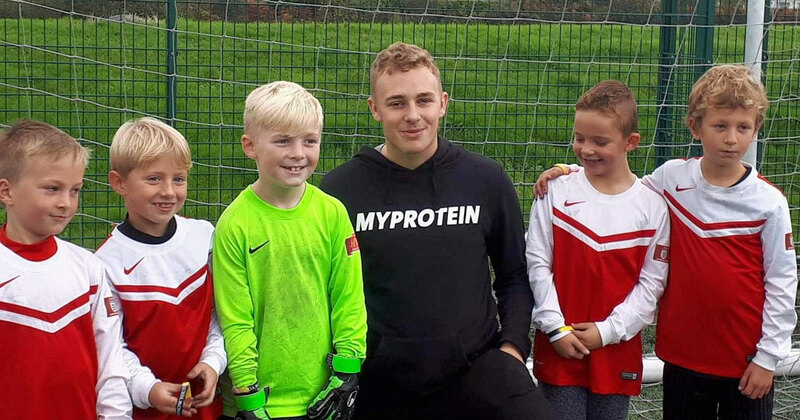 As well as delivering Grow the Game, the Football Foundation delivers the Premier League and The FA Facilities Fund on behalf of the Premier League, The FA and the Government, through Sport England. Since 2000, the Foundation has supported over 17,000 grassroots projects worth more than £1.4bn. Photos attached of Teyah at the Taster Session. All permission given by her parent for sharing and media. 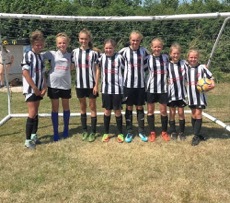 St Agnes AFC Dynamos Under 12's were in action today at the Looe Tournament on a seriously hot day! 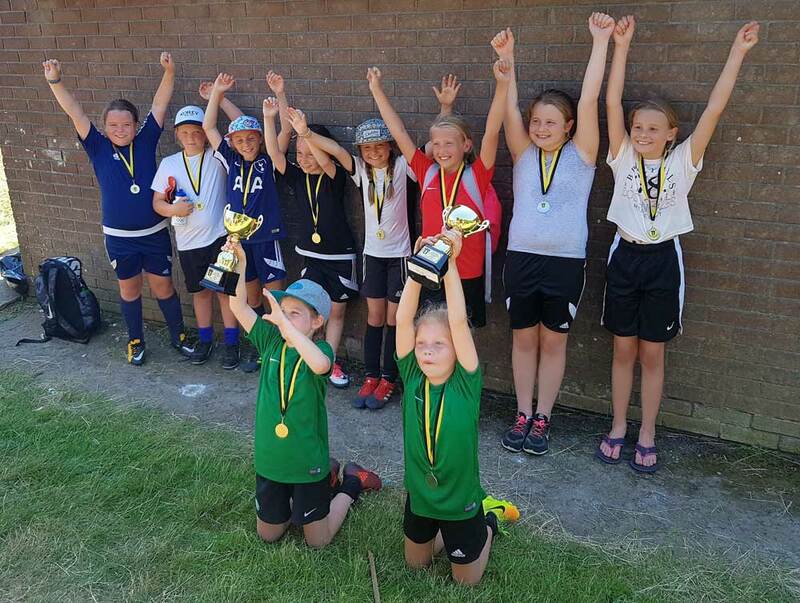 Fabulous effort and football with two teams entered and after three years of being runner's up, nearly and almost there and with three penalty shoot-outs they came home tournament winner's! Well done coaches, players, parents and everyone! 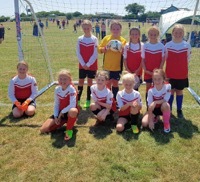 St Agnes AFC Dynamos Under 10's Girls attended the Summer Tournament at Looe today and had a cracking day, they were all awesome and played brilliantly! They finished 3rd and 4th overall, but those smiling faces win the day! 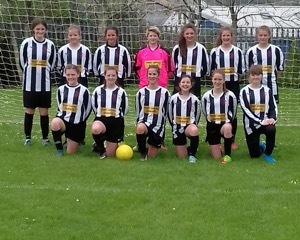 Thank you to everyone who supported all these fabulous girls to get two teams to Looe today. 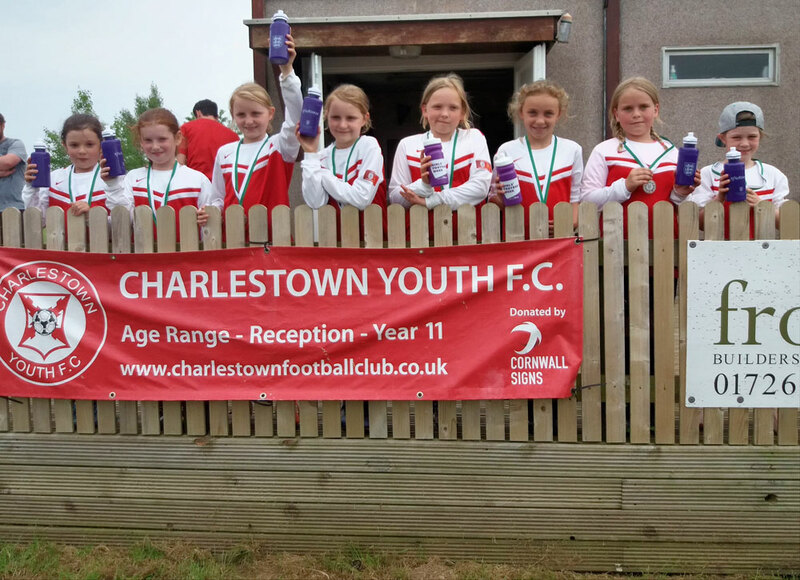 A massive well done to all our girls coaches, parents and players for a fantastic effort and attendance at the Charlestown Tournament this weekend. 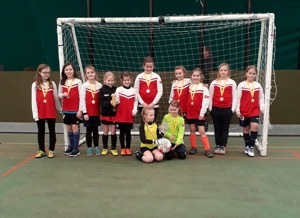 Just over 50 girls represented St Agnes AFC Dynamos within seven teams across four age groups, which is totally awesome! 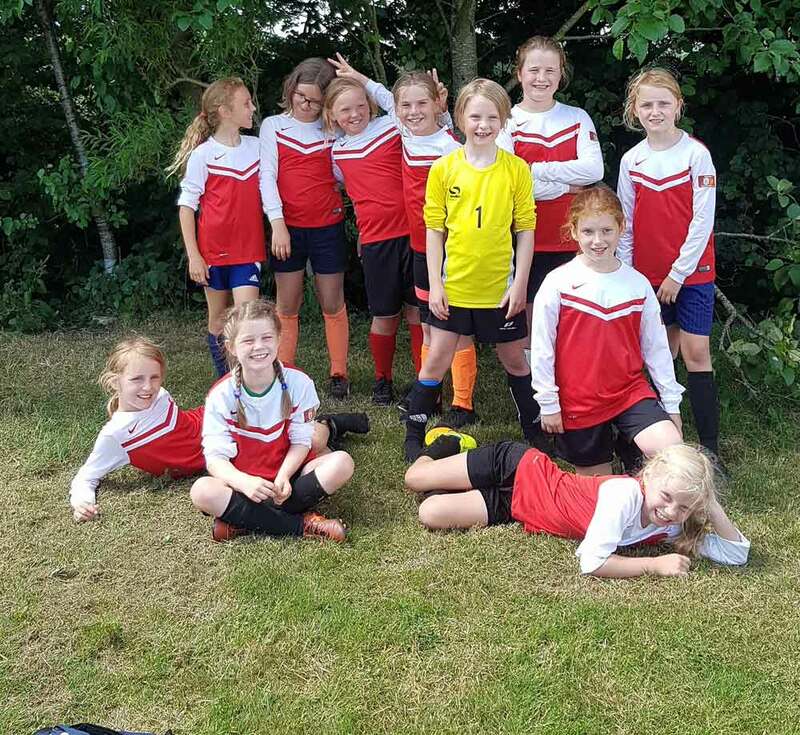 The coaches have reported that there were some fantastic, exciting games and wonderful individual and team performance with penalty shoot outs, sudden death and the u12's reaching a final and runners-up! 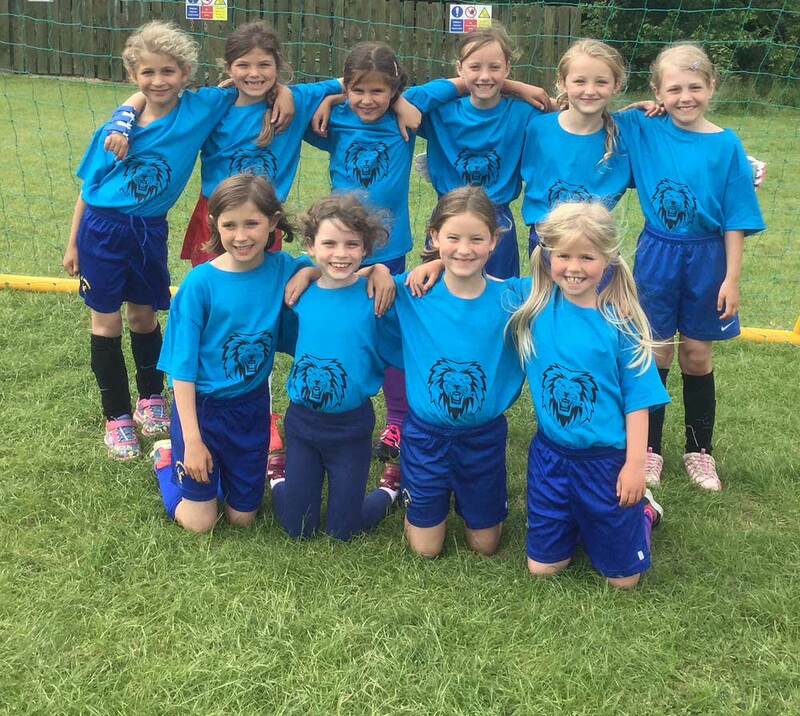 Best of all smiley faces and girls enjoying the football and friendships! It was a good experience to play against some different teams from Plymouth. Thank you everyone especially our brilliant coaches!! 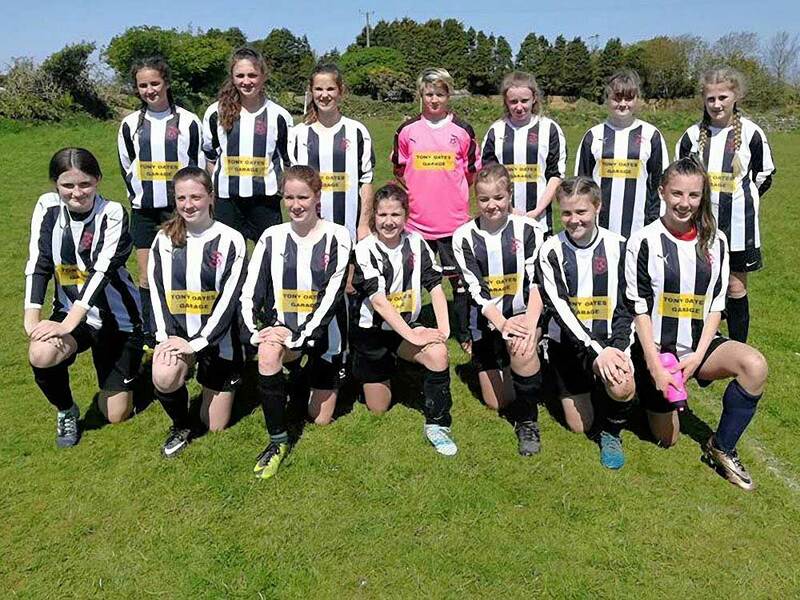 Any girls interested in playing girls football ages u15's downwards are welcome to get in touch (07974 370666) or for those 5-11 years pop along to our St Agnes AFC SSE Wildcats at Truro College astro-pitch 6-7pm on Friday evenings. 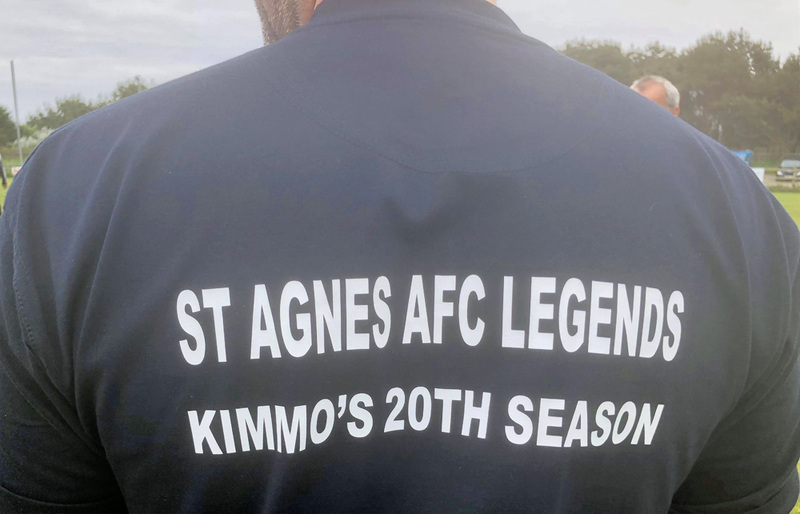 Celebrating Martyn Kimmins 20th Season managing St Agnes AFC 1st team - Football, Fundraising, Friends, Memories: A massive thank you to everyone who supported the charity day at Enys Parc celebrating Kimmo's 20th Season! A tremendous amount of money which demonstrates what a great force for good football can be! 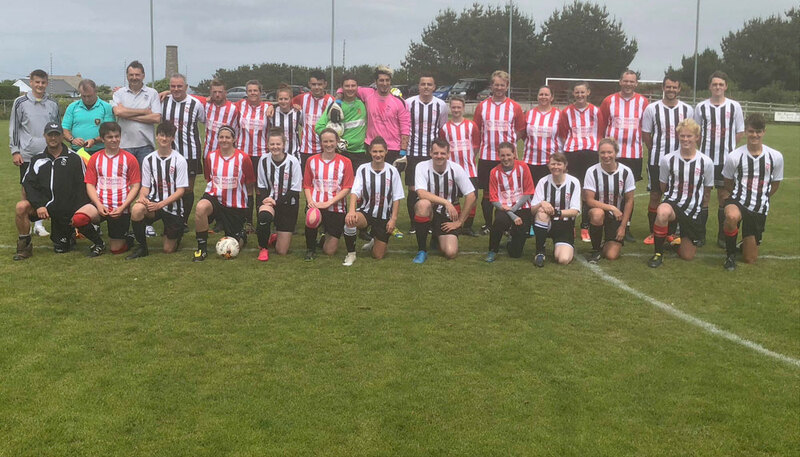 There were two football matches with the first a mixed up game between members of St Agnes AFC Ladies and Men the score 3-3. 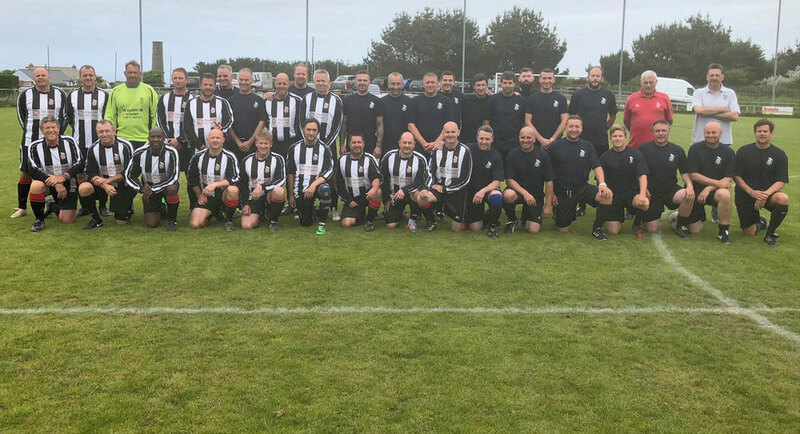 The second match saw St Agnes AFC Bolster Veterans take on St Agnes AFC Legends featuring players from across the last 20 years the score 4-0 to The Legends! A minutes applause was held with flowers placed around the ground to remember those loved and lost over the last 20 years. Volunteer referees Kevin Knowles and George Pattison refereed one game each and played in the other! Great spirit and thank you to both of them! The auction after the game was a lively affair and the event rounded off with Kimmo recounting some memories largely about winning and embarrassing stories about players across the years! Thank you to everyone who took part, played, donated or supported in every way it really meant a lot to Martyn. The day was extremely well supported and attended thank you everyone so much and Martyn hopes anyone who couldn't make it can catch him somewhere in his next and 21st Season! Martyn commented "What a fantastic day and a wonderful way to celebrate 20 years. It was great to see so many players from across the years both on the pitch and supporting during the day. I am overwhelmed with the charity money raised thank you everyone". 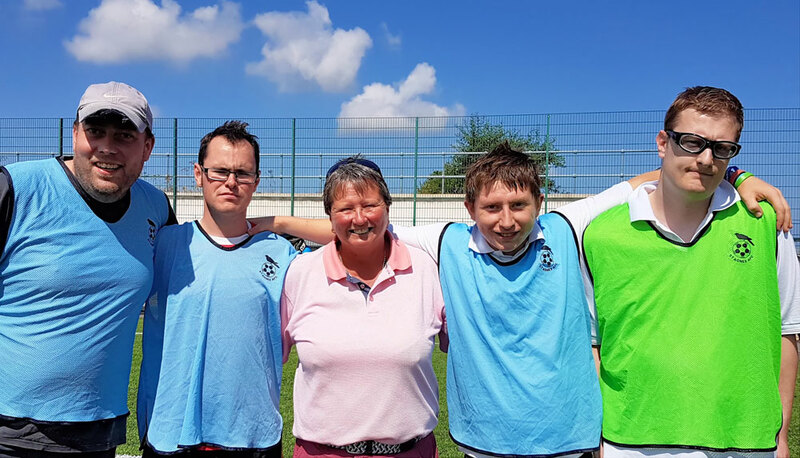 L-R - Chris Collins, Kathy Woolson, Dan O'toole, Martyn Kimmins (all St Agnes AFC), Louise Brown (The Cove), Lucy Chappell (Merlin MS Centre) Denise Reeve (Mermaid Centre). 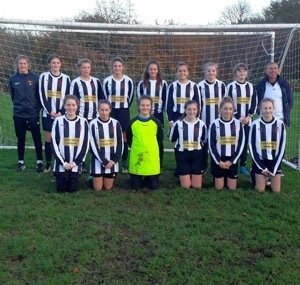 The Mithian School Wildcats girls football team are photographed before their exciting fixture against St Agnes ACE Academy. 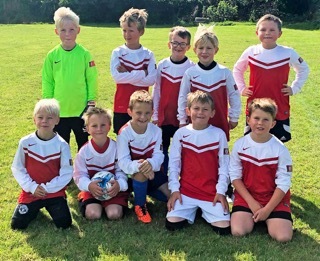 The team have been training hard as part of a school club link with St Agnes AFC and gave a tremendously enthusiastic performance wearing their newly sponsored T-Shirts. 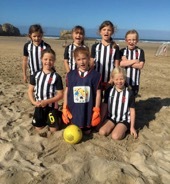 Any girls aged 5-11 years interested in football of any level of experience are welcome to come along to the St Agnes AFC SSE Wildcats Sessions at Truro College on the astro-pitch 6-7pm on Friday evenings. 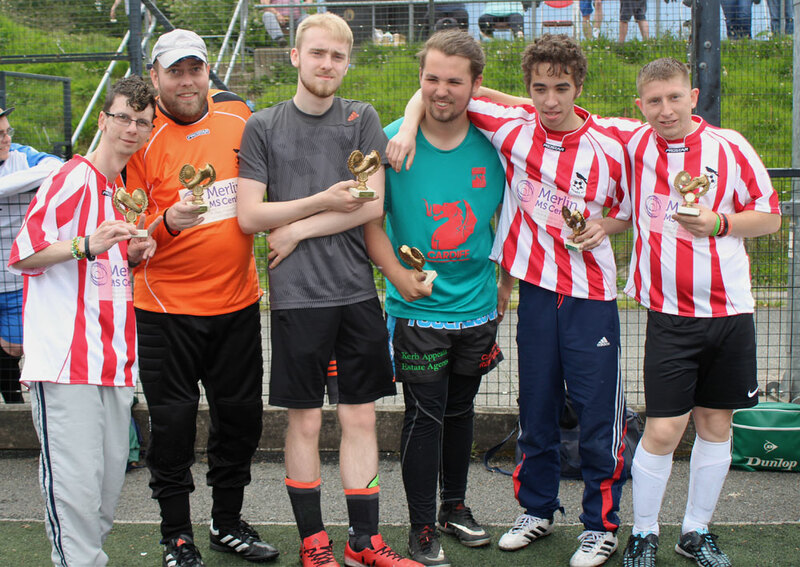 St Agnes AFC Dis-ability Squad held their end of 2017/18 season celebration at Enys Parc with football on the pitch, hot dogs and medals for all. 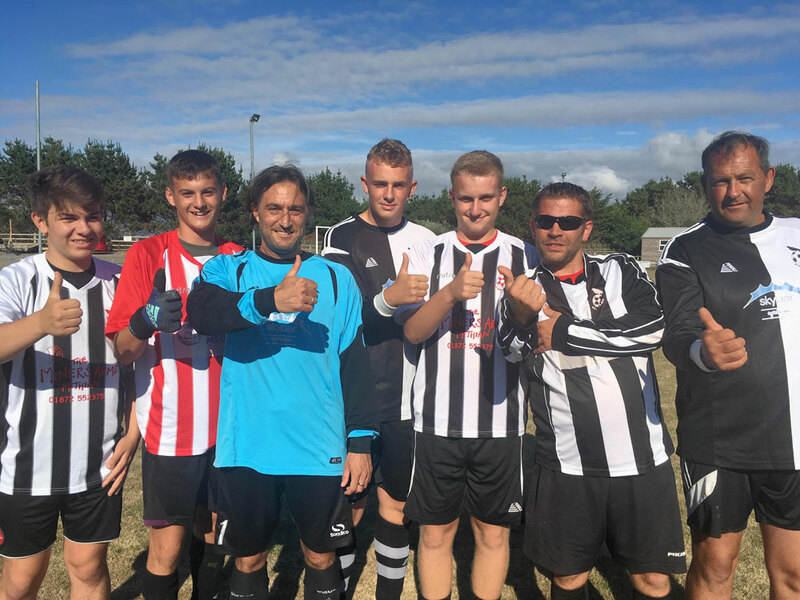 The newly formed squad with two teams have been amazing this year with both teams representing Cornwall in Bristol at the FA People's Cup and the League Team CDFL Champions! 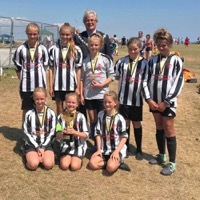 The morning was attended by Cornwall Councillor Pete Mitchell who was thanked for supporting the team with a donation from his Community Chest Funds. He also suggested and sponsored a special team award for endeavour/commitment, which was presented to Reece. Councillor Mitchell who watched the players on the pitch commented " You should be proud. The self esteem in those players and camaraderie between them was plain to see. Those of us without disability can only applaud the amount of extra effort these people have to make. 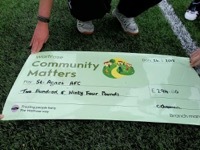 Well done St Agnes AFC". St Agnes AFC Dis-ability resume training on Saturday 23rd June in preparation for the 2018/19 Season and welcome any new players at Truro College Astro 11-12 noon (£2). 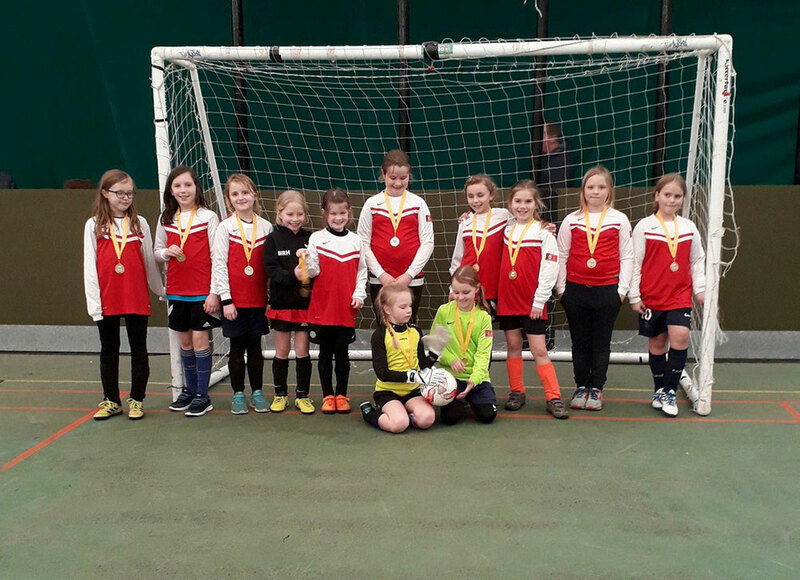 St Agnes AFC Dynamos Girls held their end of 2017/18 season do on Saturday with fun football, hot dogs and awards. 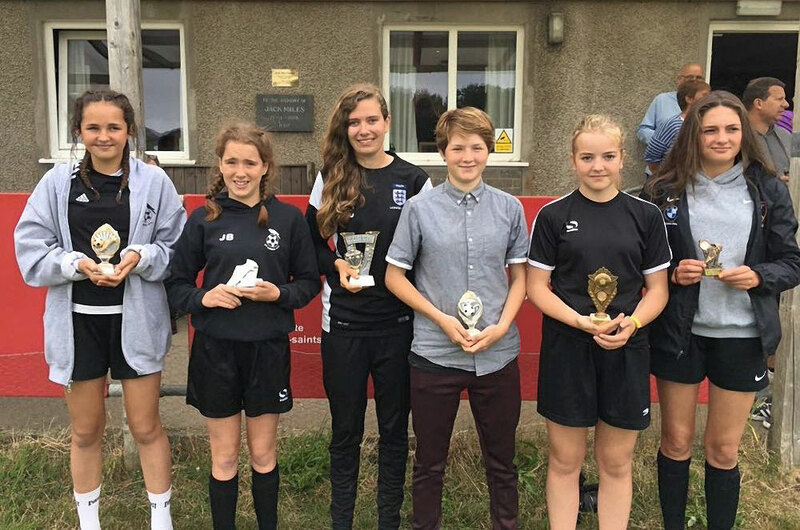 A tremendous year for girls football at St Agnes AFC. 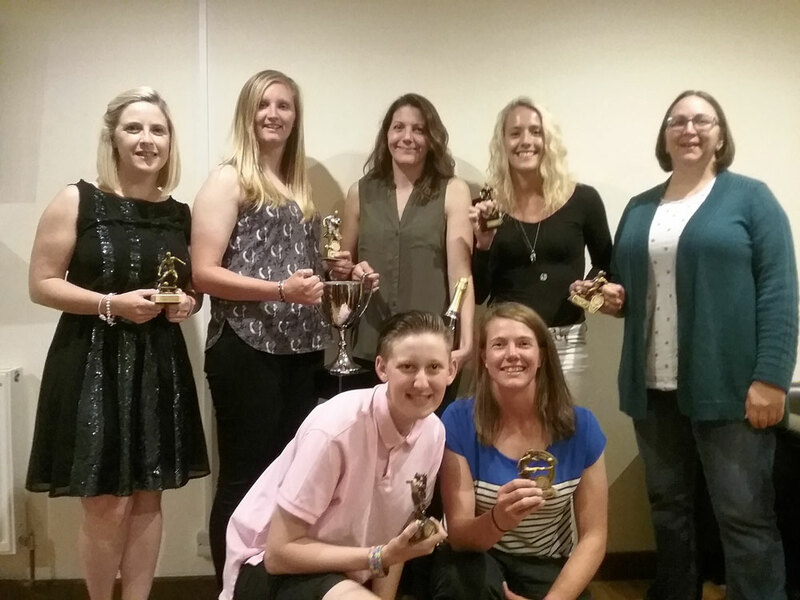 Photos are of the u12's and u14's award winners! All u10's and u8's received medals with one young lady (photographed) particularly delighted with hers! 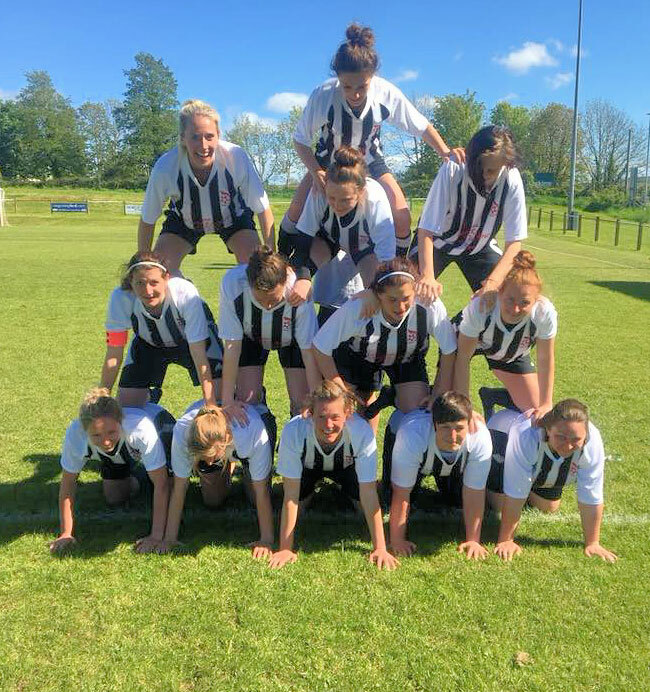 The girls resume training next Saturday 23rd June 9-10am for their 2018/19 season (£2) at Truro College on the astro pitch and any girls of any ability interested are very welcome to join in or come along to our Friday night Wildcats Centre. St Agnes AFC Ladies held their end of 2017/18 Season Awards at the clubhouse with pizzas and an important meeting re the next season's campaign. 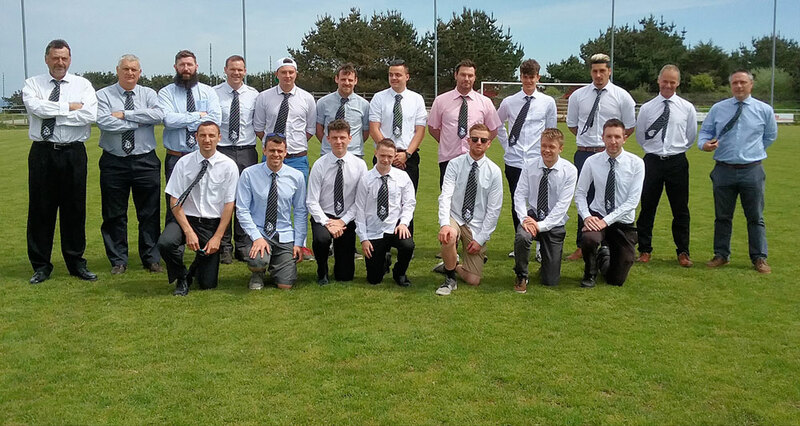 After 15 seasons playing within Cornwall and finishing back to back CWFL League Champions 2016/17, 2017/18 the team held a very detailed players meeting and voted to accept promotion to the SWWFL. 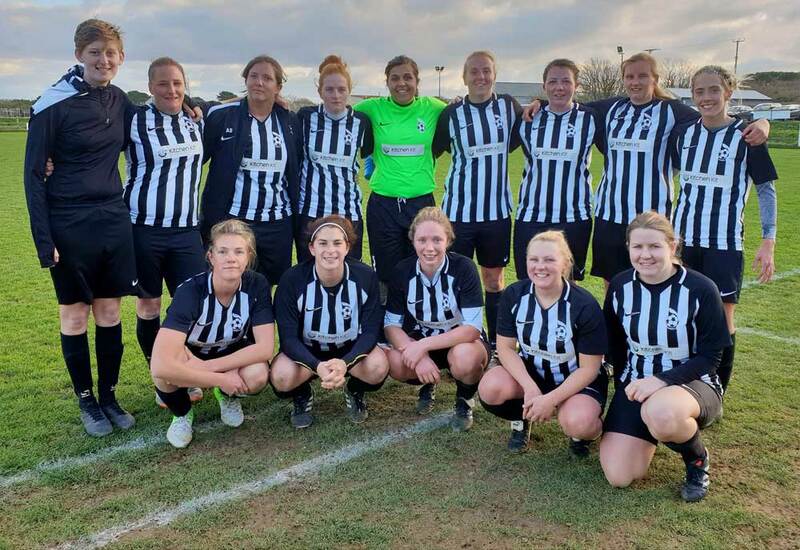 With the only other Cornish team in their SWWFL Division being Bude, their nearest away game being in Plymouth and the anticipated furthest game near Yeovil (280 miles round trip) its a big commitment for the squad both on and off the pitch. 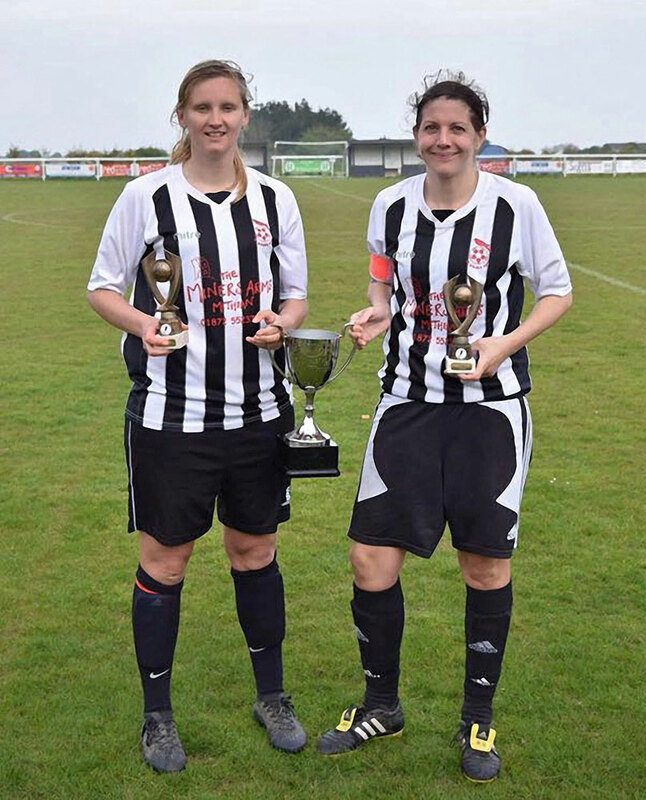 St Agnes AFC Ladies will also be taking the exciting step of launching a Reserves team for 2018/19 with the ethos 'two teams one club'. Any interested new players of any ability/experience or none at all are very welcome to come along to pre-season training commencing on Wednesday 4th July at Enys Parc 6.30pm-8pm. 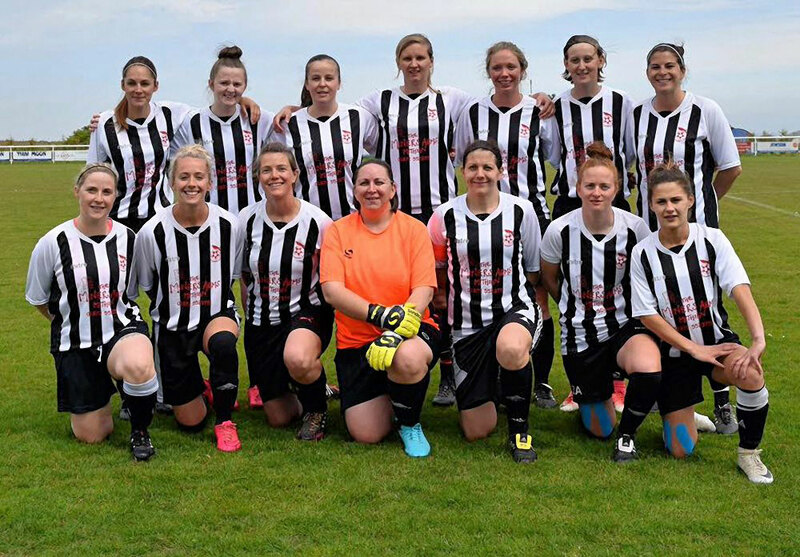 We would love to hear from anyone interested in supporting or sponsoring the squad as they take this big step to develop ladies football in Cornwall. 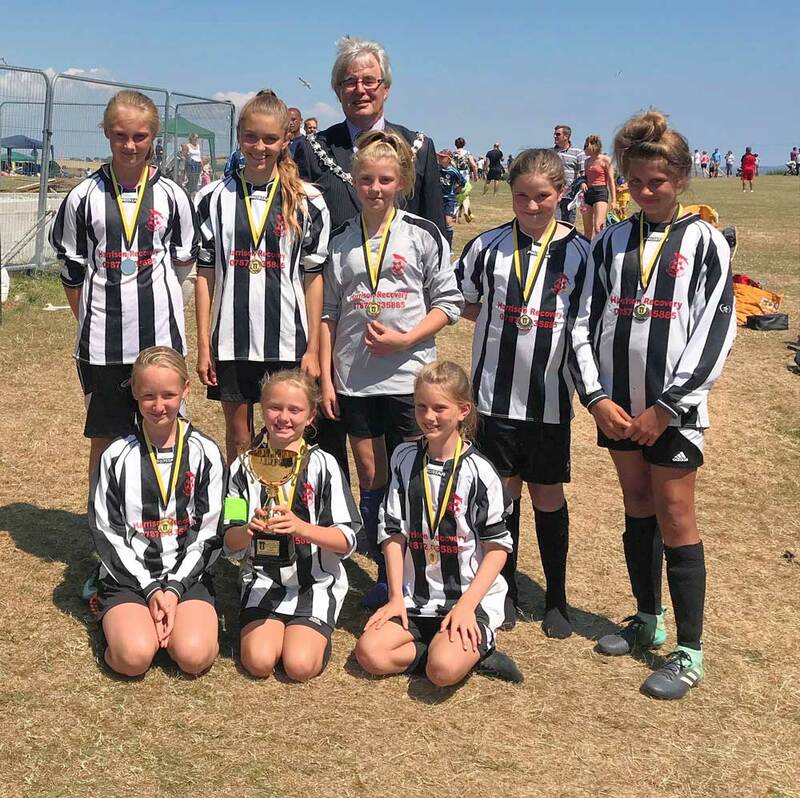 St Agnes AFC Dynamos Girls reached the end of an epic 2017/18 Season with the u10's, u12's and u14's taking part in the CGFL Central Event held at Charlestown today. 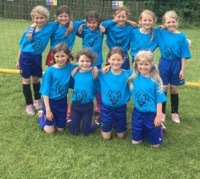 Fabulous girls football played in the sunshine. The u14's were crowned Spring League Champions at the end of a truly amazing season for them winning the Spring League, Autumn League, CGFL Futsal and County Futsal Cup and the CCFA Under 14's Cup! 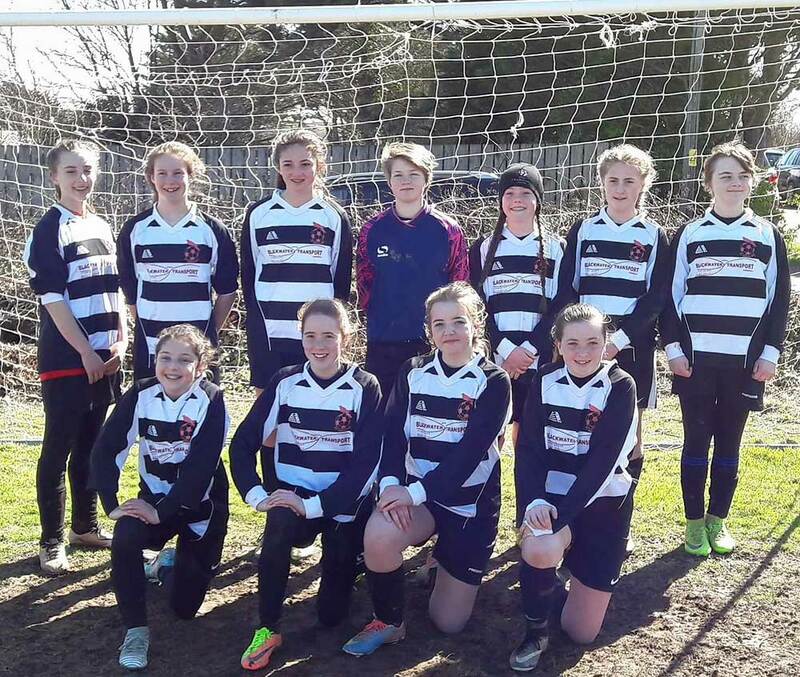 Both u12's teams have developed amazingly well this season and were placed top and 2nd in their competition pools. 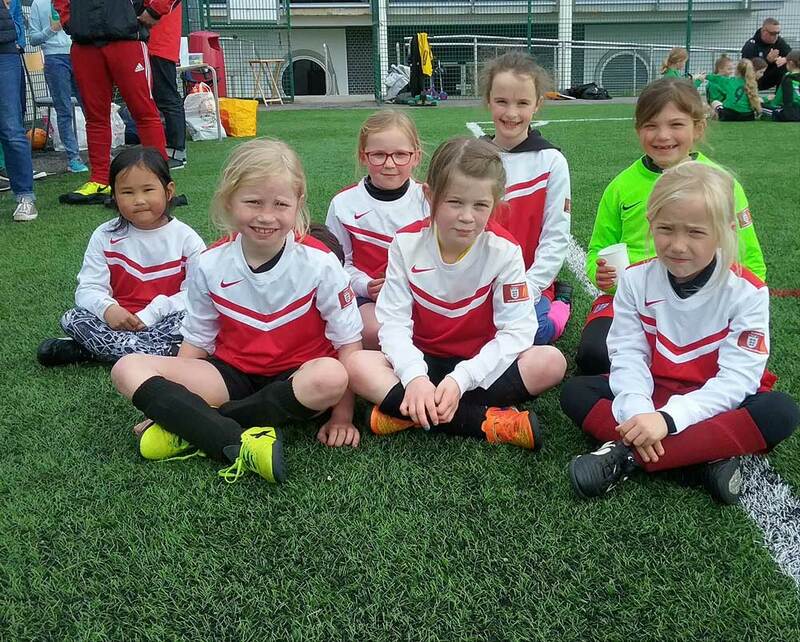 The u10's are blossoming into a great group of players and today won and drew some of their fixture showing fabulous promise. 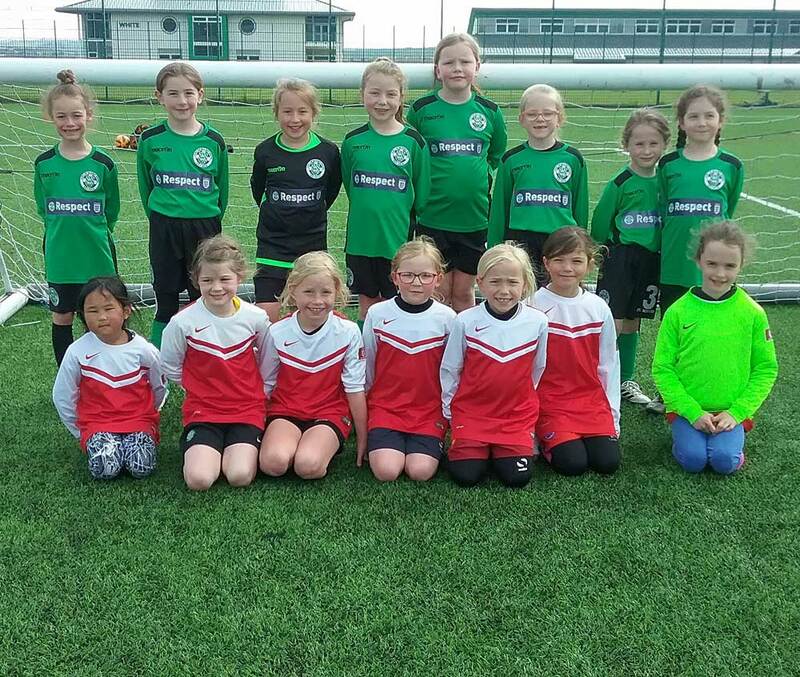 Only our u8's weren't involved today as there were no fixtures for them, but what an exciting set of players they look to be developing into! 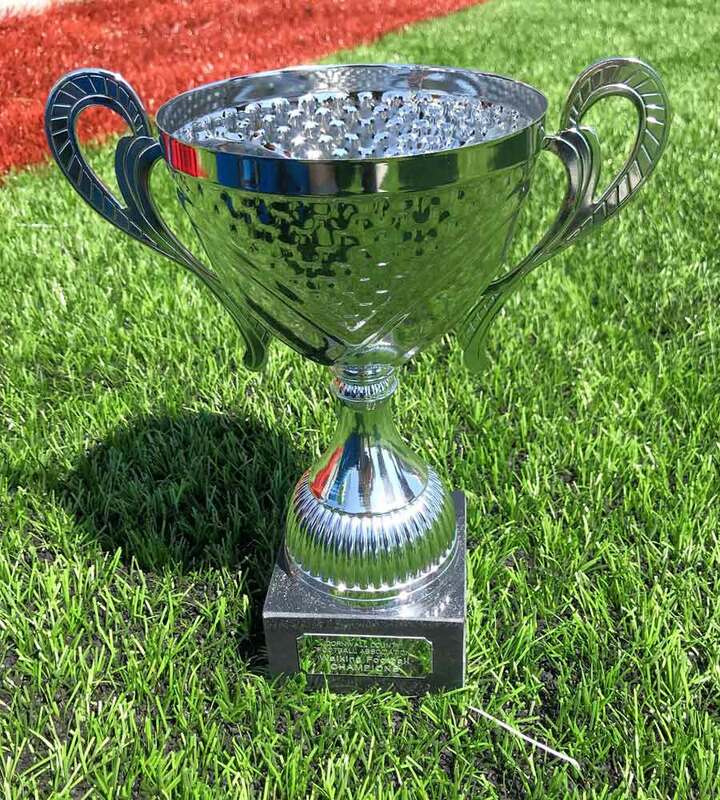 Next weekend the teams have their end of season presentations, but are straight back to Saturday morning training on 23rd June in preparation for the 2018/19 Season. All girls welcome to join in! We will be fielding under 15's, 13's, 11's, 9's and starting 7's too with Saturday morning training 9-10am and Wildcats on Friday evenings 6-7pm. Everyone welcome. A massive thank you to all our amazing volunteer coaches, sponsors and fabulously supportive parents who have helped make it all happen! 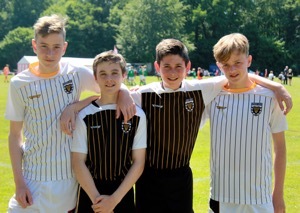 Four players from St Agnes u13’s have just returned from Cornwall select’s tour of Germany. Cornwall took their usual three under thirteen squads; the Wolves, Bears and Hawks, with Samuel Mellor and Gil Smith representing the Bears, and Rhys Hooper, Harvey Andrew selected to represent the Wolves. 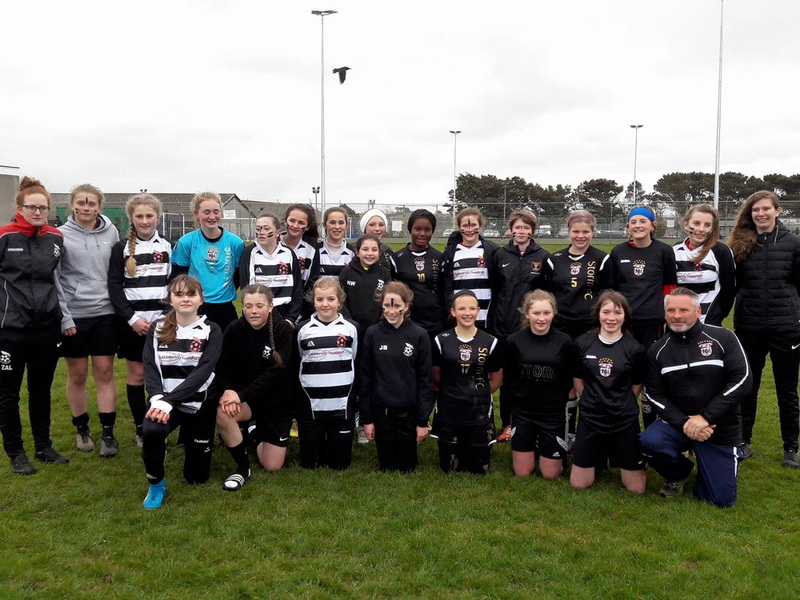 In preparation for their trip the teams had weekly training sessions and competitive warm up matches against local Cornish under 14’s sides. 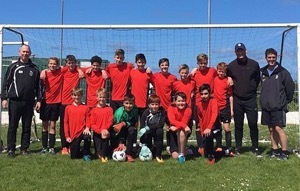 They began their long journey with their team mates to their base in Bad Bentheim just over the Dutch boarder late in the day on Sunday the 13th of May, and after an eighteen hour coach journey, that included a ferry crossing from Dover to Calais they arrived at their hostel accommodation. Their ten day trip included stadium visits to PSV Eindhoven, and FC Twente and fun days out at a theme park and swimming. They also had warm up matches against German sides, in preparation for the main event, a three day tournament at Ibbenburen. Twenty four teams were split into six groups, with the top two from each group going through to the knock out phase. In 27 degree heat all three of the teams made it through to the semi-finals with the Bears being drawn against the Hawks, and the Wolves against the host Ibbenburen academy team. After a close fought contests the Hawks beat the Bears 1-0 and the Wolves came out on top after a penalty shoot-out. So the Wolves met the Hawks in the final, and the Bears went into a third place play off. Both games were close fought affairs with the Hawks winning a close final 1-0, and the Bears coming out on top 1-0 for third. After twenty tears of competing in the tournament history was complete! Cornwall had secured the top three places. The celebrations began, with all three teams receiving trophies and medals. The boys did themselves and Cornwall proud. Oggy Oggy Oggy is still ringing in all of our ears! Well done to all at St Agnes AFC for completing our Annual FA Charter Standard Health Check 2018/19 keeping St Agnes AFC an FA Charter Standard Community Club. In the word's of the FA in the accompanying letter: "Congratulations your club is among the country's best". 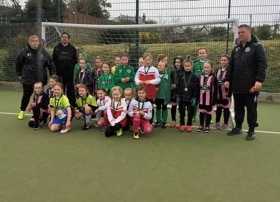 St Agnes AFC is the only club in Cornwall to provide the diversity of football we have: including female, male, veterans, girl, boys, mixed and disability and we have fielded twenty eight (28) teams across this range this season from our tots to our vets making us one of the biggest clubs in Cornwall too! I am a very proud Club Chair and want to say a massive thank you to all the hard working volunteers who have made this happen not to mention our sponsors, supporters and players! Well done everyone! 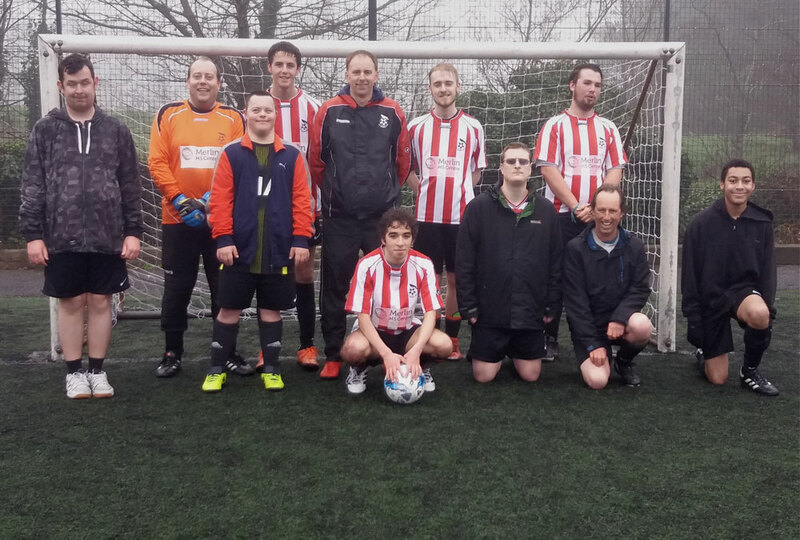 Congratulations to St Agnes AFC Dis-ability League Team who won the 2017/18 CDFL League Cup! 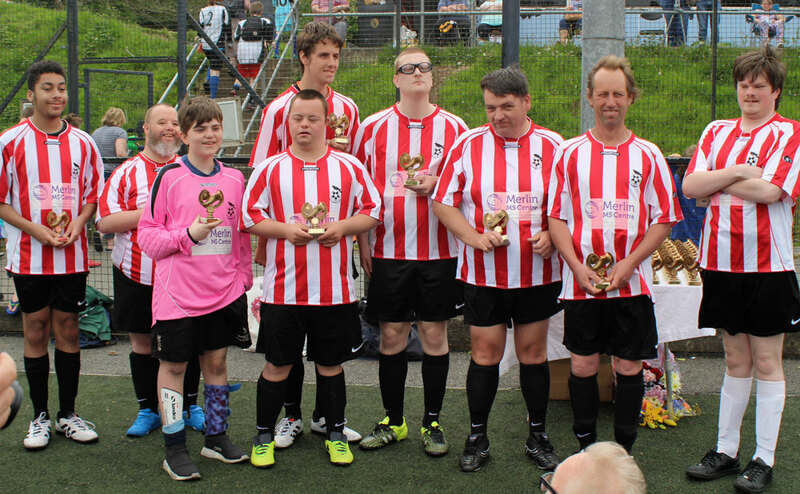 What a fabulous group of amazing individuals, who have really enjoyed their first season as part of the St Agnes AFC Dis-ability Squad with our Championship team as well. We are all very, very proud of them. 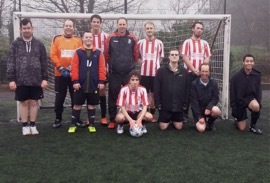 St Agnes AFC is very grateful to everyone who has supported the development of our Dis-ability Squad this season and anyone interested in sponsoring and supporting them for the 2018/19 Season is welcome to get in touch! The Squad will continue training throughout the Summer at Truro College from 11-12 noon (£2) and any players interested can just pop along and join in or get in touch for more details. St Agnes AFC Bolster Veterans manager Steve James and player Brendon Curran are photographed being presented with the CVFL Div 2 Winners Trophy by Stuart Bell. Any players interested in joining the Bolster Veterans (aged 35 and over) for the 2018/19 season please get in touch. 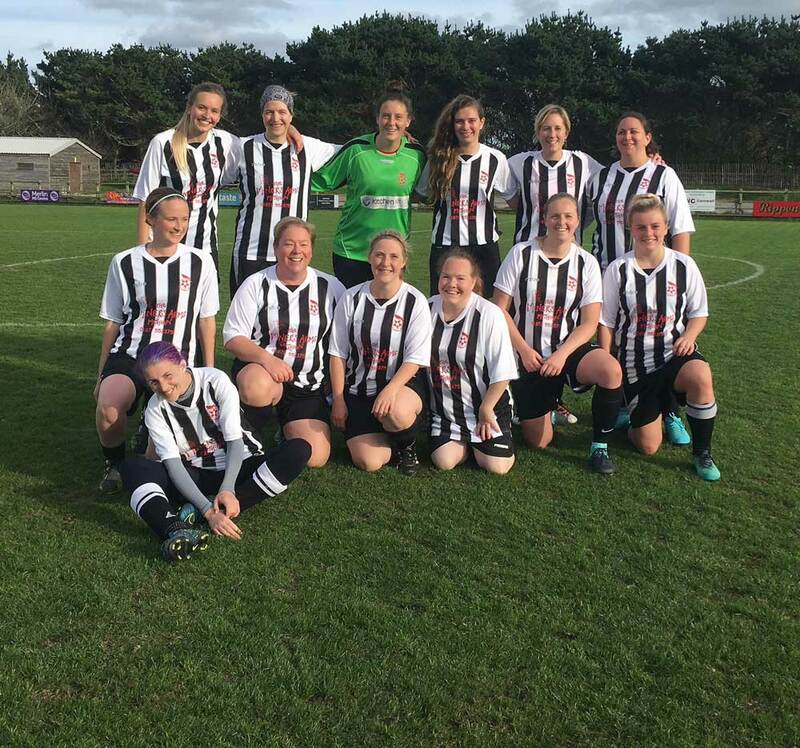 St Agnes AFC Ladies completed their 2017/18 Season with a 3-1 win away against a strong Mousehole Ladies yesterday. A tremendous season for the team standing 7 points clear at the top of the final table with Mousehole Ladies Runner's up. There was a nice touch at the start of the game as they were welcomed to the pitch with a guard of honour from the opposition. 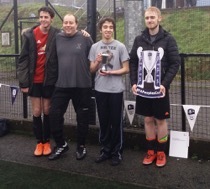 The team were officially crowned the 'back to back' CWFL Champions and presented with their trophies. 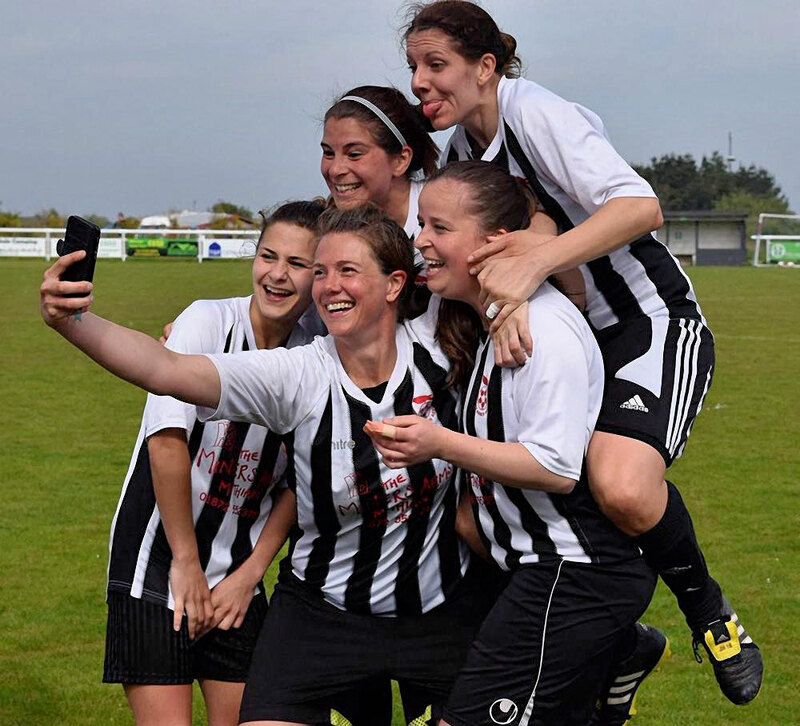 A small selection of photos from the total 'spam' of celebrations attached and the faces say it all and just how much the ladies game matters! The team will take a couple of weeks break to enjoy that winning feeling before starting pre-season. Any ladies of any experience interested in joining St Agnes AFC Ladies and giving football a go are welcome to please get in touch! 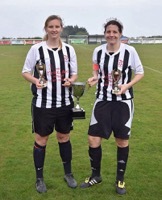 Team photo from fixture v Mousehole; Members of St Agnes AFC Ladies celebrate League win; and St Agnes AFC Ladies joint Captains Jenna Borlase & Jodie Hood celebrate with CWFL Winners Trophy. 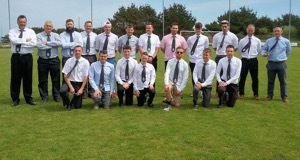 St Agnes AFC 1st team had an excellent day out yesterday as they had unexpectedly reached the final of the LWC Drinks Cornwall Combination League Supplementary Cup. Team breakfast was followed by the bus trip to Helston FC facing high flying Carharrack. 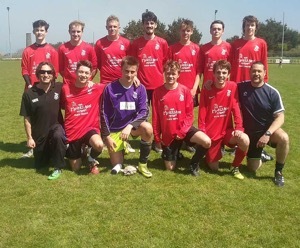 The squad looked uber smart with club ties and was proudly featuring three 16 year olds playing in a men's final during their first season of adult football. St Agnes scored the opening goal against the run of play and had moments of taking the game to Carharrack. The final score was 5-2 to Carharrack. A great day out nontheless and more St Agnes AFC memories created! The first team still have four more home games to play all at home: Tue 22nd, Thur 24th, Sat 26th (3pm) and Wed 30th May. Do pop up to St Agnes AFC to support them finishing the season the Bar will be open! 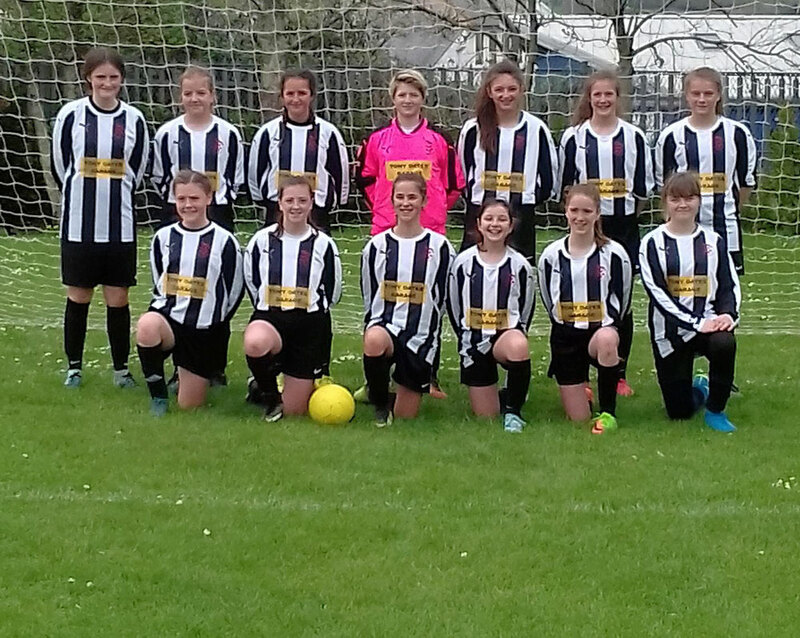 St Agnes AFC Dynamos Girls under 14's travelled to Helston FC yesterday who were great hosts for the Cornwall FA Girls County Cup Finals. 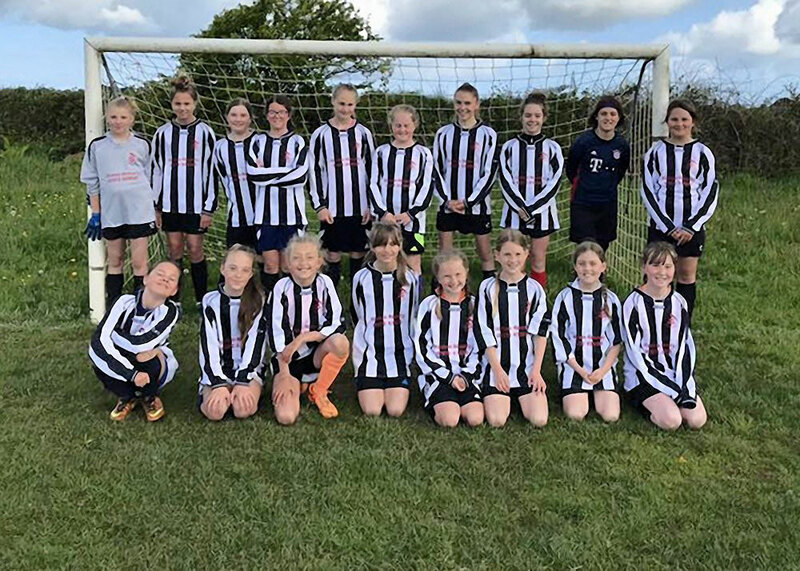 They faced Charlestown under 14's girls in an entertaining match, which was a great advert for the progress of the girls game in Cornwall. 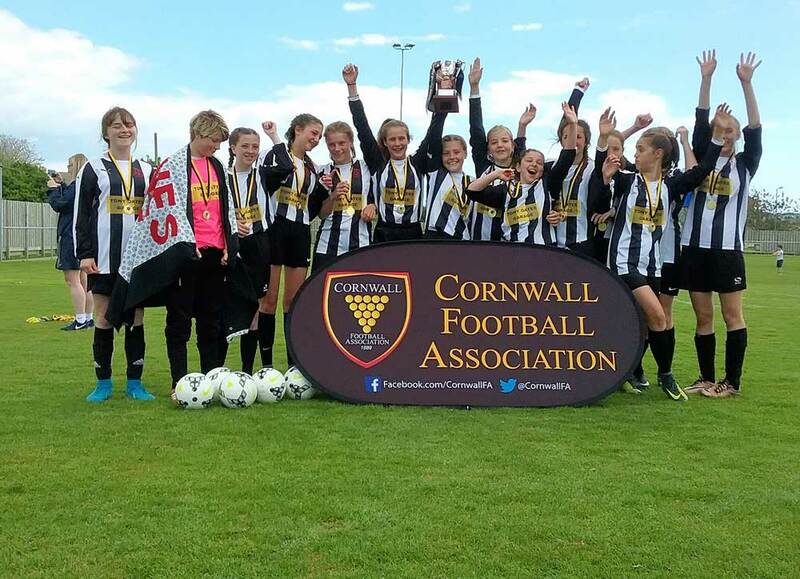 St Agnes girls won the fixture 7-0 to bring home the 1st ever club female County Cup Trophy! 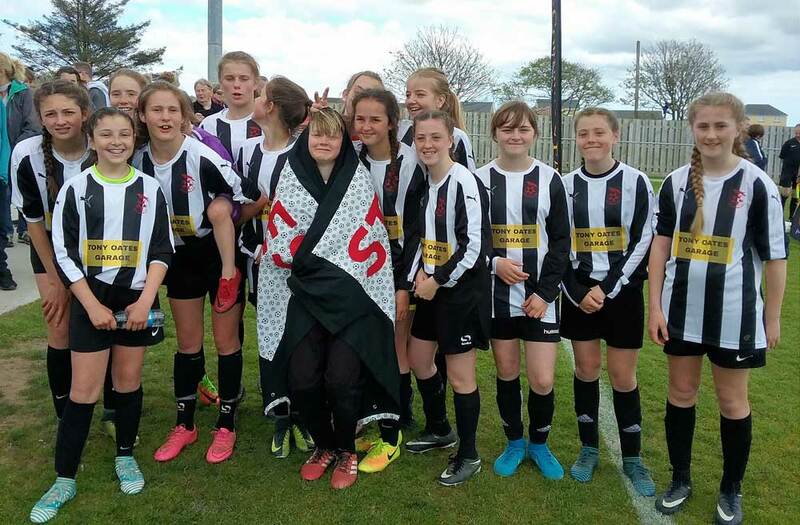 Any girls interested in playing football for the 2018/19 Season is welcome to contact the club (details via website www.stagnesafc.co.uk) we will be offering under 15's and younger age groups. 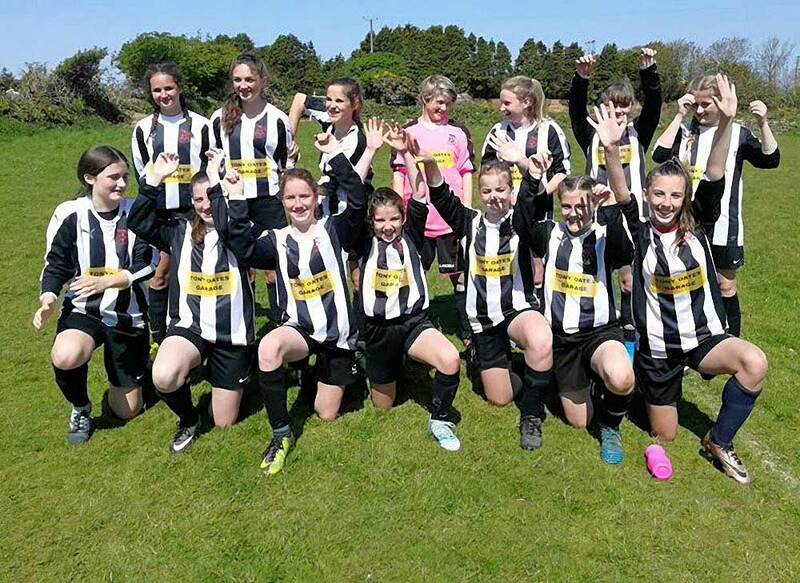 Congratulations to St Agnes Under 13's KYFL who following their 1-0 win away v Goonhavern yesterday are League Champions. 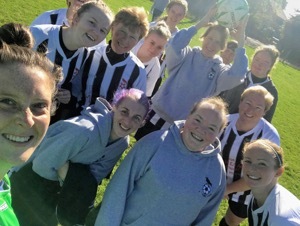 St Agnes AFC Ladies went 1-0 down in the opening minutes of this Sunday's fixture away -v- Wadebridge. 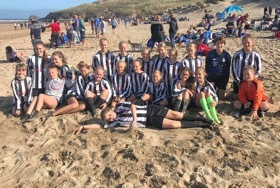 This spurred them on into action with four goals from Lexi Riley, three from Jodie Hood and one each from Laura-Beth Medcalfe and Debbie Duncan the final score 9-1 to a St Agnes. 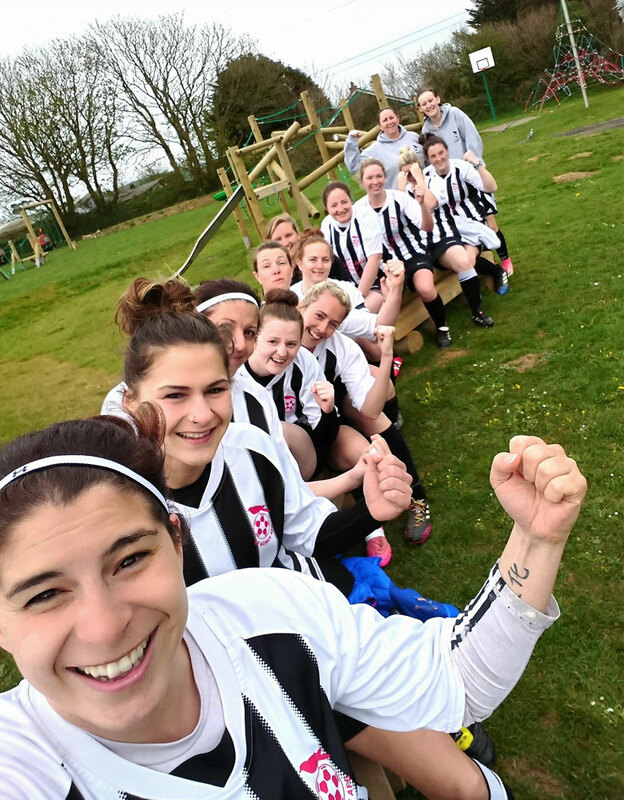 With two matches left to finish the 2017/18 campaign St Agnes AFC Ladies will be planning their pre-season soon and any ladies of any level of experience interested in joining in will be very welcome! 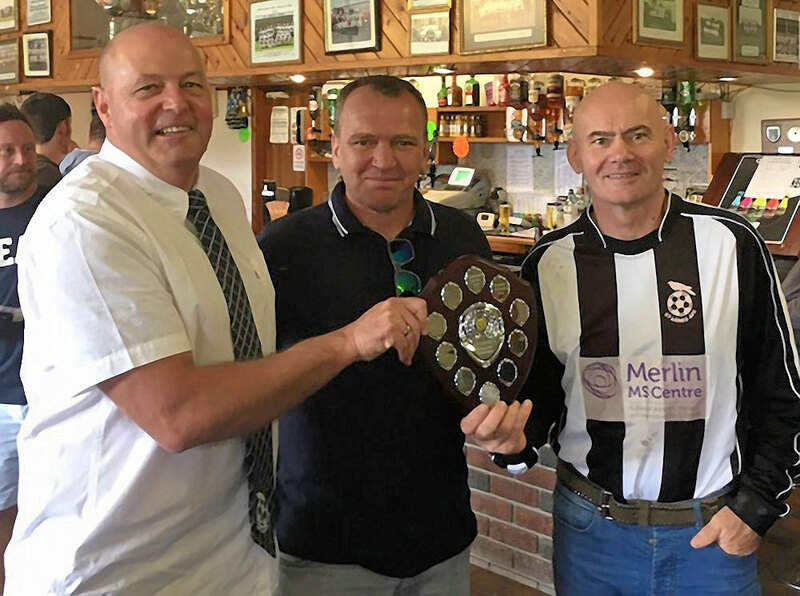 With the Sunday League short of teams in their cups St Agnes AFC Bolster Veterans were invited to join in theWhite Hart Memorial Trophy: a competition held in memory of 4 lads who played a Sunday League fixture and died in an accident on the way home. 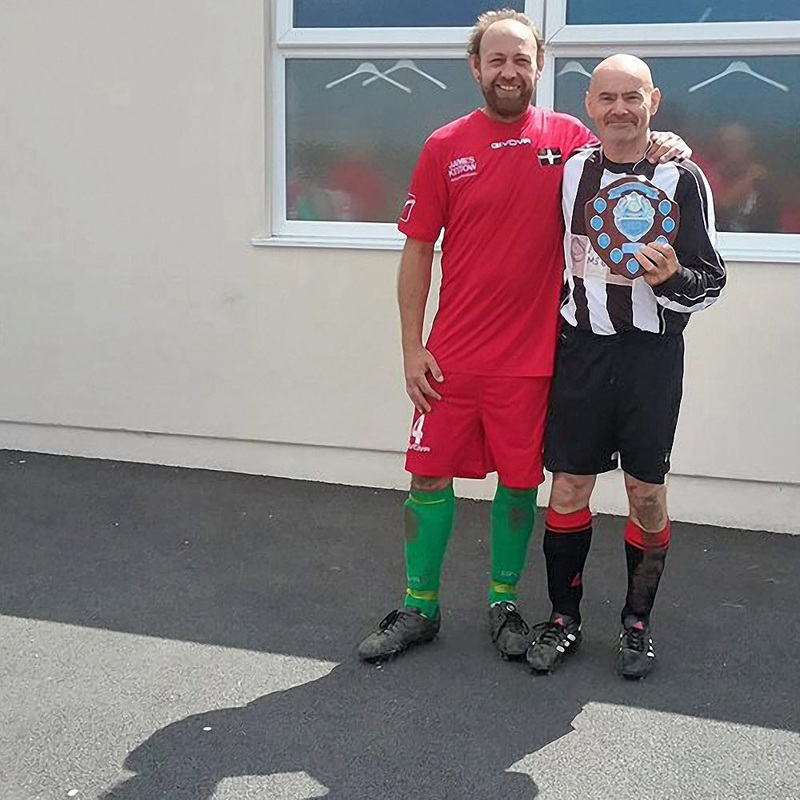 Yesterday saw them play Par Inn in the Final of the competition with St Agnes AFC Bolster Veterans runners-up 2-3 in a closely contested fixture. 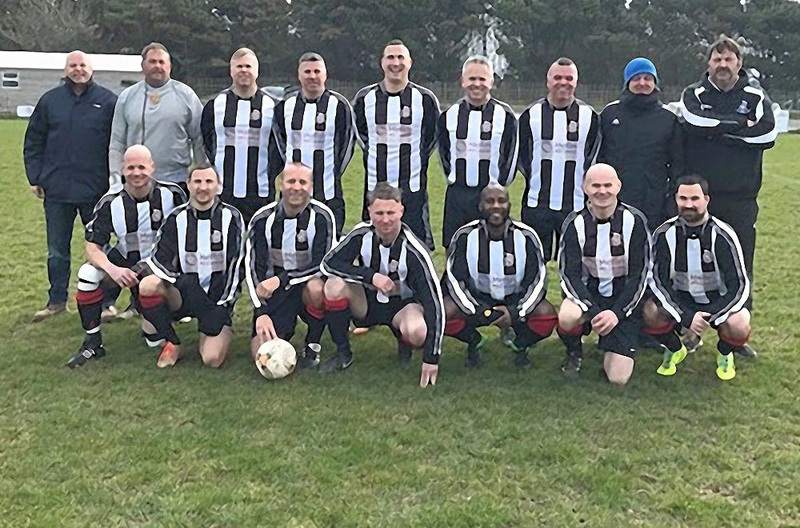 Anyone interested in playing for the St Agnes AFC Bolster Veterans for the 2018/19 Season please get in touch. 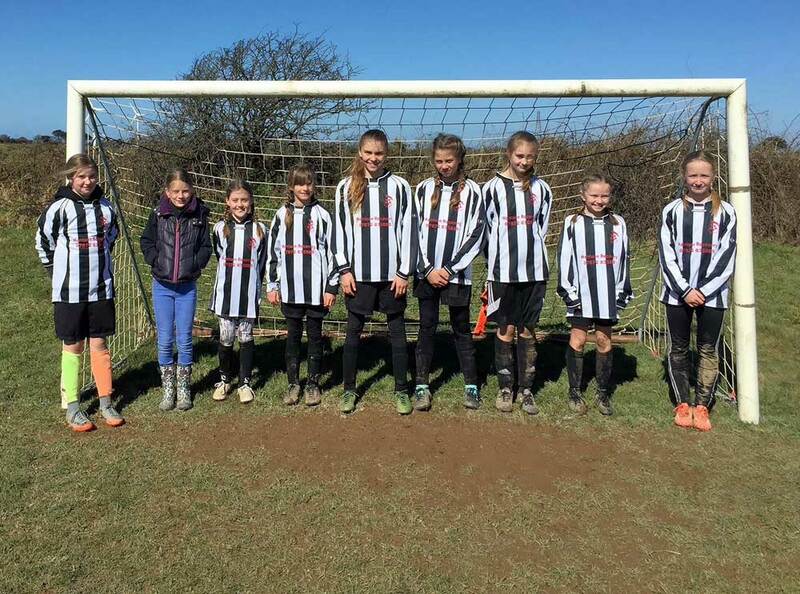 St Agnes AFC Dynamos Girls under 12's were at home today in their CGFL league fixture -v- St Agnes AFC Dynamos Girls under 12's! 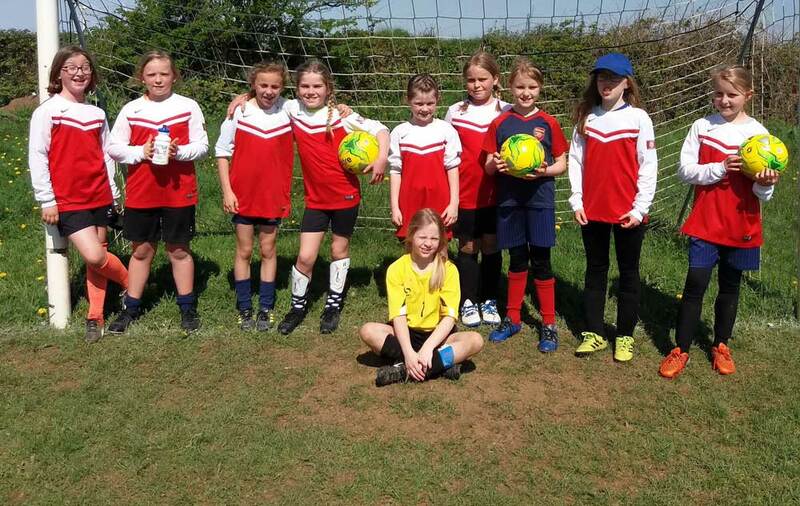 The game was won by St Agnes AFC Dynamos under 12's girls! A great turn out in numbers! Well done to all players and coaches. Any girls aged under 15's and below interested in playing girls football for the 2018/19 Season are welcome to join in. 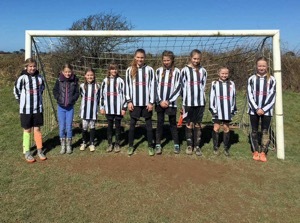 Photographed after this weekend's home league fixture members of St Agnes AFC Under 14's Dynamos Girls have clearly enjoyed a fun morning playing football. The squad have reached the final of the 2017/18 Season CCFA Under 14's Girls County Cup facing Charlestown (away at Helston next weekend): our first ever St Agnes AFC female County Cup Final! 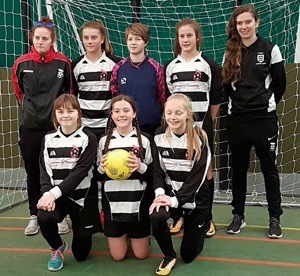 They will also represent Cornwall in the Regional Futsal Finals in Paignton on 27th May. 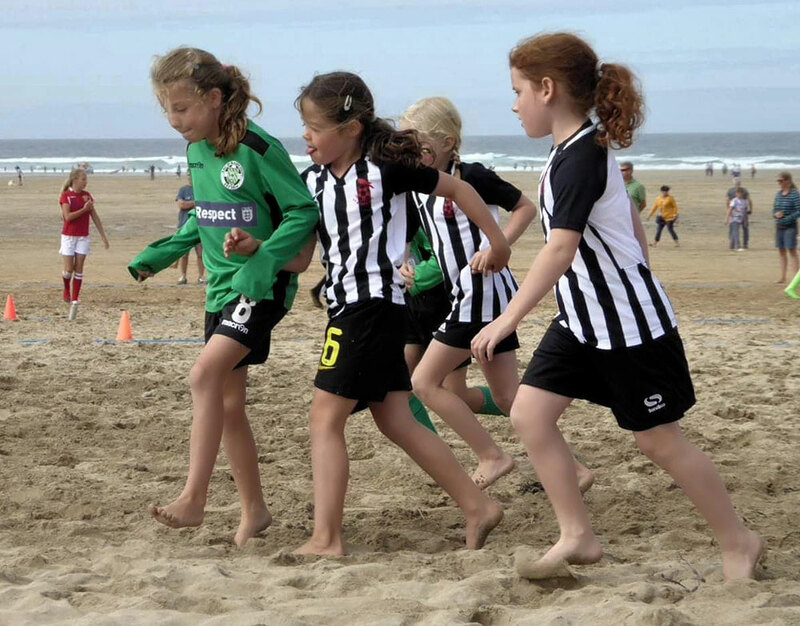 Girls football is a fabulous way for them to have fun, make new friends and belong to a team! 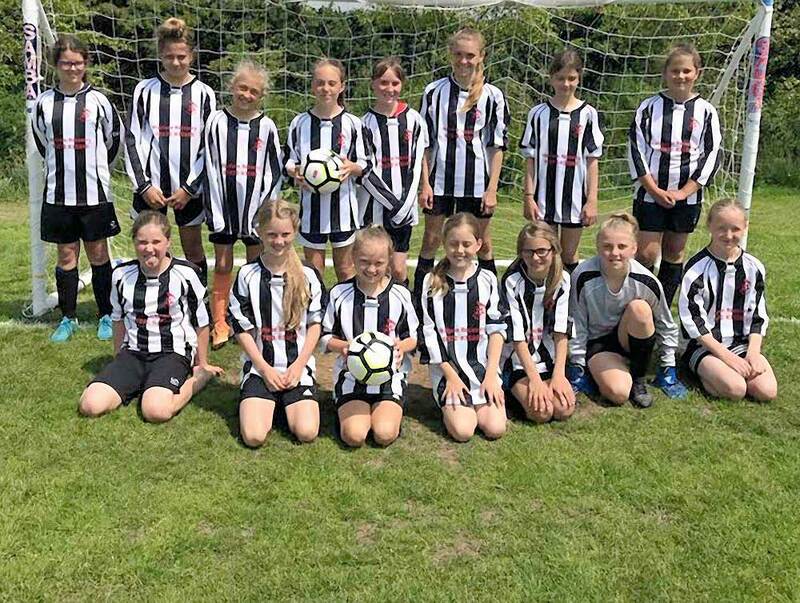 New girls are always welcome to join St Agnes AFC Dynamos Girls who will be running everything from under 15's and below for the 2018/19 Season including our new St Agnes AFC SSE Wildcats Centre (5-11 years) and all girls are welcome! Congratulations to St Agnes AFC Under 18's and their manager Mark Norgate on a 5-2 win today at home -v- Torpoint in the semi-final of the CCFA Rathbone Cup! 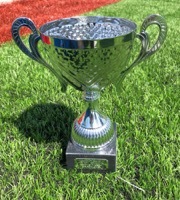 In the Final they will face Saltash under 18's who beat Truro in the other semi-final. 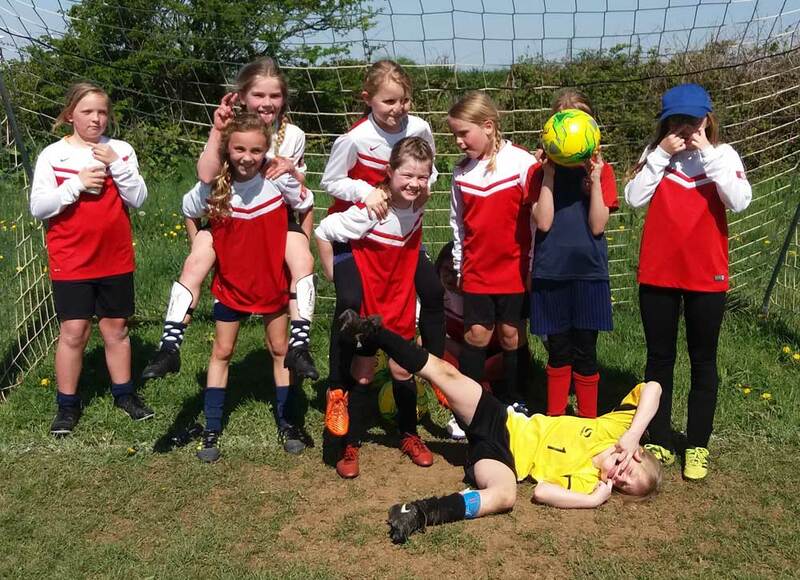 St Agnes AFC Dynamos Girls under 10's were so excited yesterday following their best result of the season they simply didn't know what to do with themselves! Well done girls and coach Hailey! 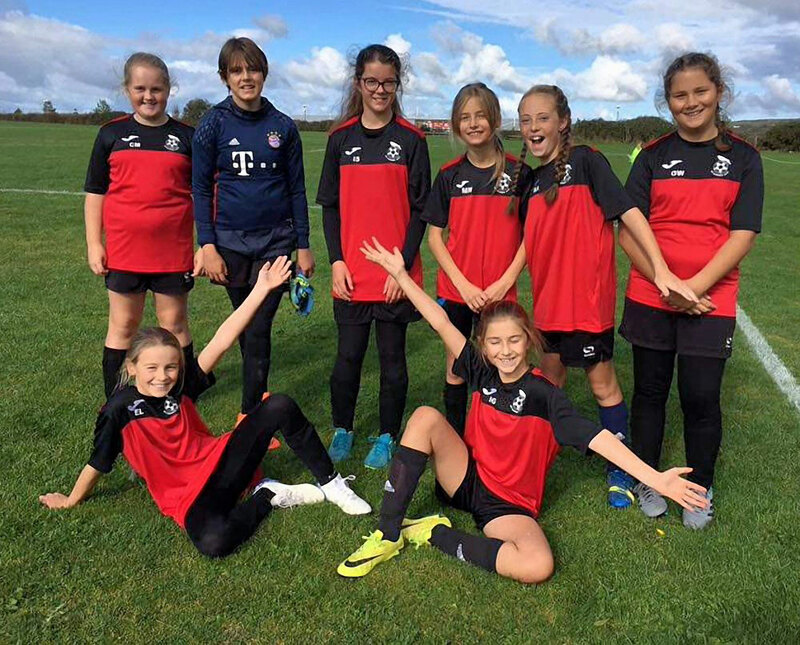 Any girls interested in playing football is welcome to come along to our new St Agnes AFC SSE Wildcats Centre for girls aged 5-11 years on Friday evenings at Truro College from 6-7pm £2. Join in, have fun and make new friends! 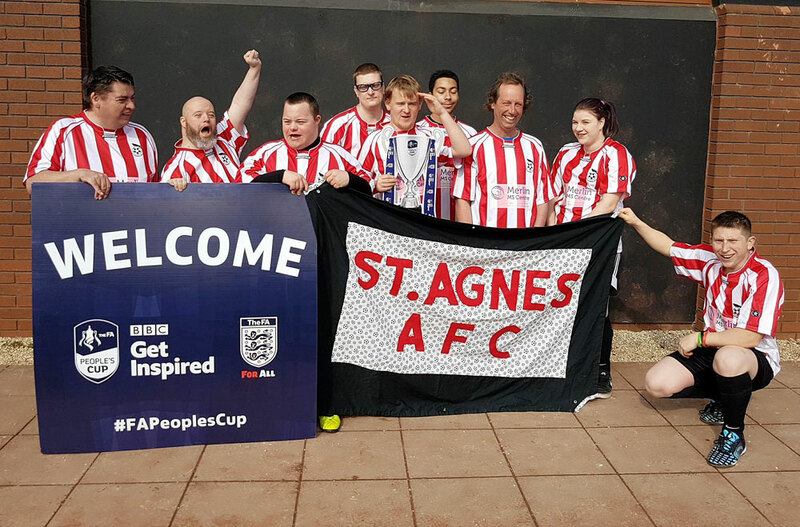 Members of the St Agnes AFC Dis-ability Squad celebrated their enjoyment and experience of the FA People's Cup 2018 at training this week. All players enjoyed snacks and drinks and were presented with a photo collage of the squads travels to Bristol for the Regional Finals. The players all received a special logo'd t-shirt as a memento. 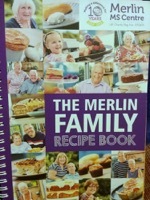 These have been generously sponsored and printed by Tremorvah Industries from Threemilestone. Delightedly wearing his t-shirt player Will said "These are great I will wear it to football from now on. 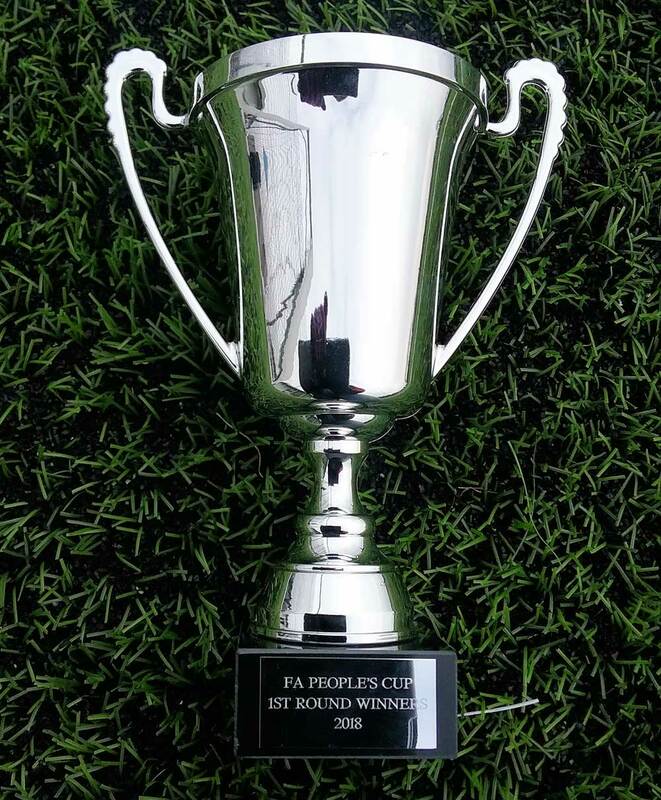 Bristol and the FA People's Cup was great". Player David went home from training proudly wearing his shirt with the biggest smile on his face! 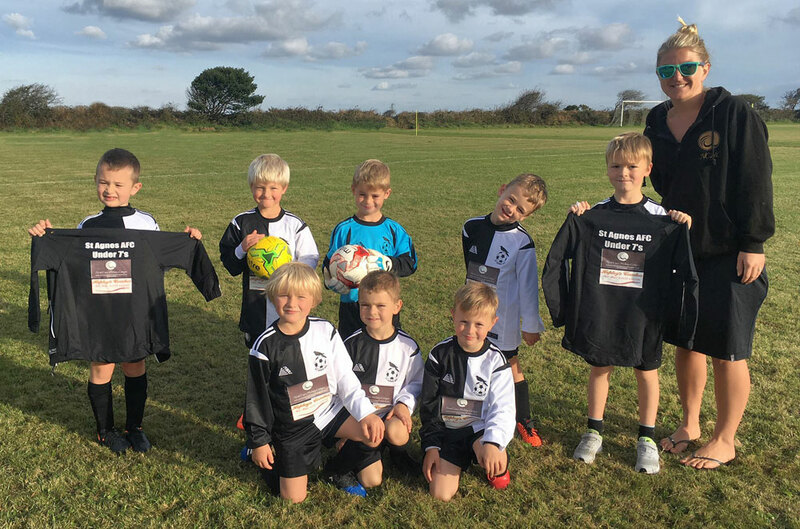 St Agnes AFC Chair Mandy Kimmins said "Thank you to Tremorvah Industries for sponsoring the wonderful t-shirts the players absolutely loved them. We are very proud of the squad and players so any opportunity to celebrate their achievements is brilliant". 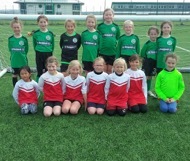 St Agnes AFC Dynamos Under 8's girls welcomed St Blazey Under 8's yesterday for an hour of fun filled football. 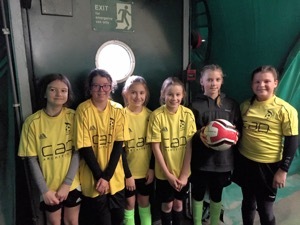 Great fun to watch as the girls enjoyed some entertaining football with big smiles on their faces. 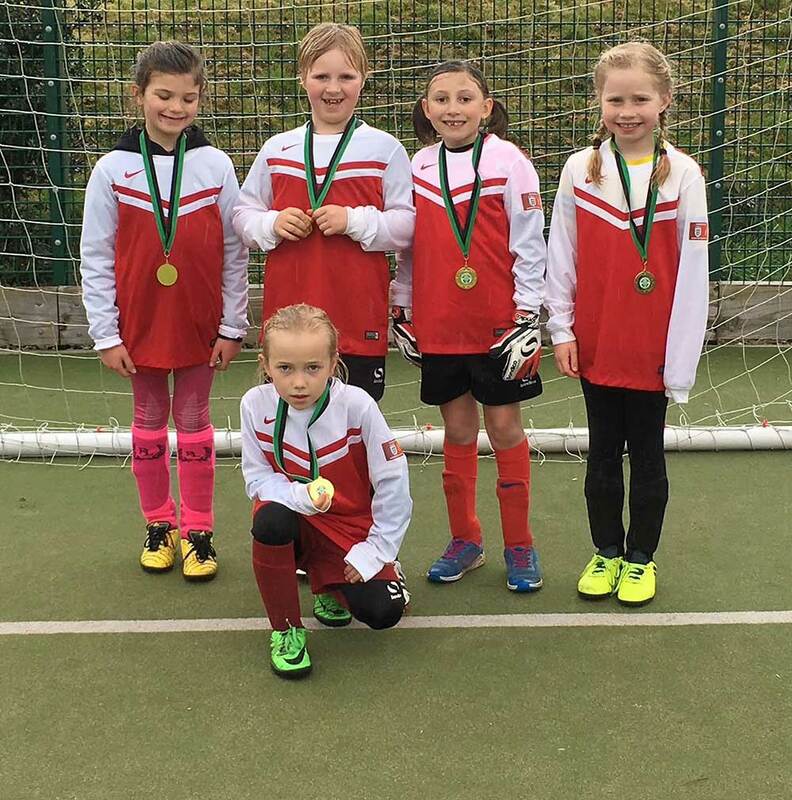 Any under 8 girls interested in playing football are encouraged to join in! 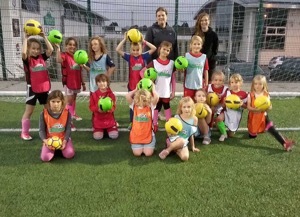 Come along to the new St Agnes AFC SSE Wildcats sessions at Truro College astro-pitch on Friday evenings 6-7pm. All girls 5-11 years are welcome! St Agnes AFC Dynamos under 10's Girls hosted a cluster event yesterday with five teams from three clubs spending two hours taking part in short exciting fixtures. Very exciting football to watch! Well done to all the teams and players who took part. 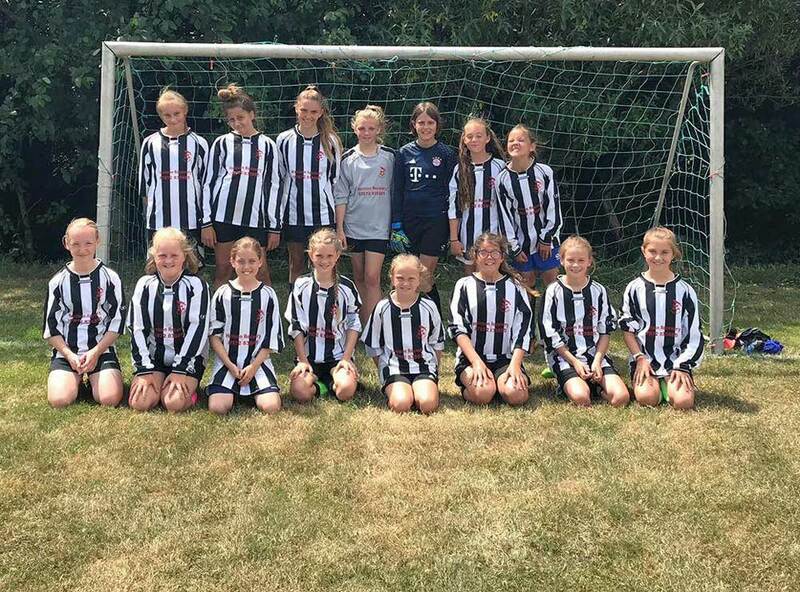 Any under 10's girls of any level of experience (or new to the game) interested in playing football, having fun and meeting new friends are welcome to join the St Agnes Girls. 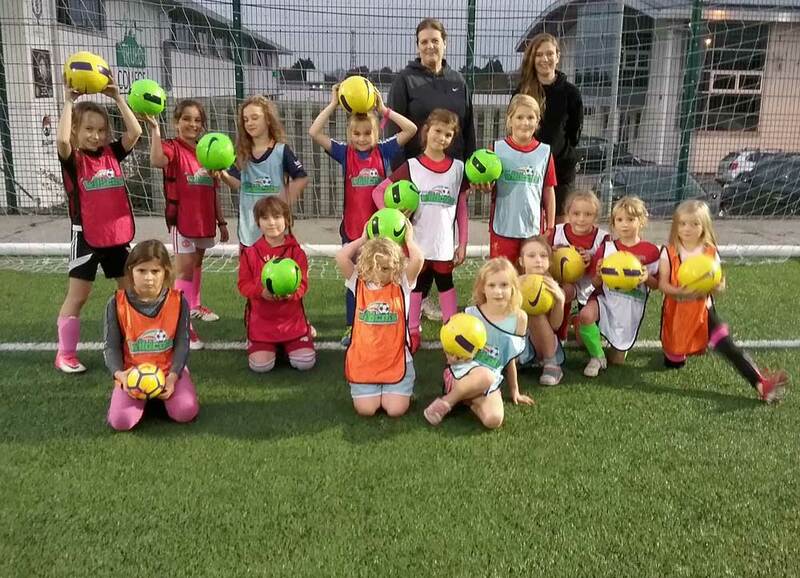 Get in touch or pop along to our new St Agnes AFC SSE Wildcats sessions for girls 5-11years on Friday evenings on the astro pitch at Truro College 6-7pm. 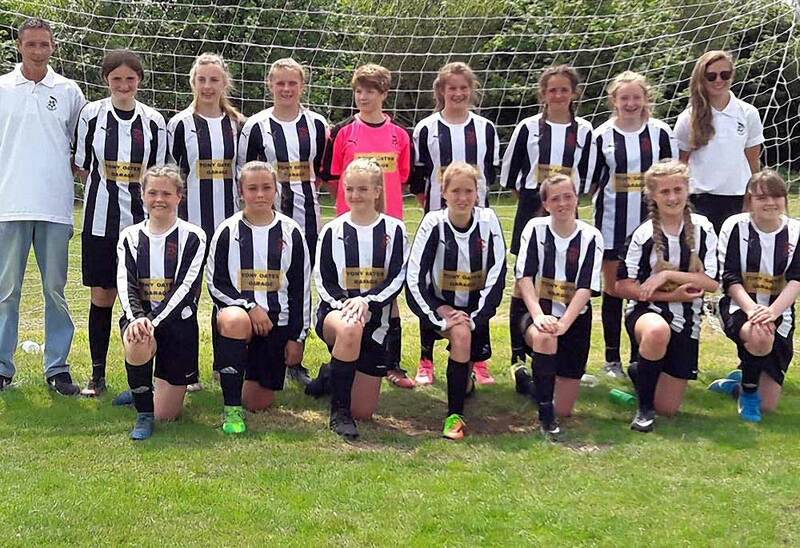 St Agnes Dynamos Girls reached the Cornwall FA Under 14's Girls County Cup Final on Sunday winning their semi-final away v Saltash. 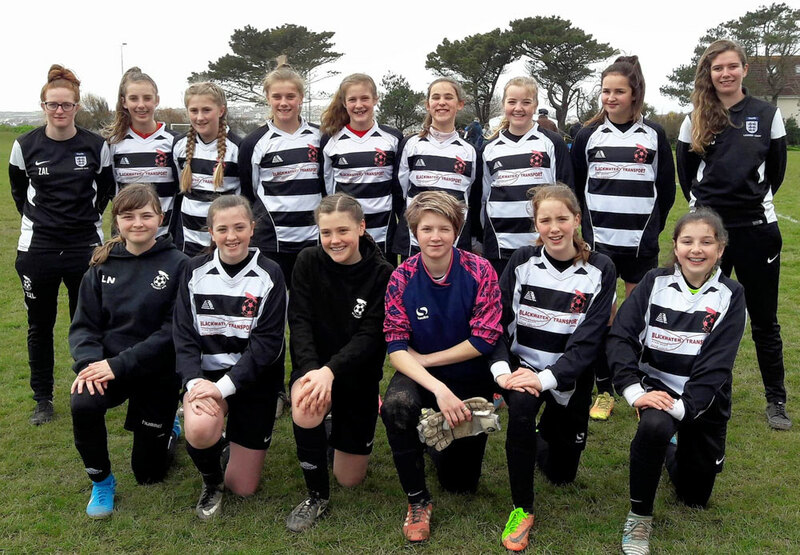 This is the first time a female team from St Agnes AFC has reached a County Cup Final and the girls look forward to playing Charlestown on Sunday 13th May on Finals Day at Helston. 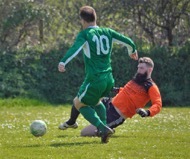 Grampound remain in the relegation zone of the Q Cornwall Veterans League Division 1 after they suffered a heavy home defeat at the hands of Perranporth. Luke Wort was their chief tormentor notching five goals. Paul Robertson claimed the other goal in a 6-1 victory with Steve Moorcroft bagging a consolation for the home side. Foxhole put in another spirited performance, but ultimately fell to another defeat at the hands of current champions St Dennis. 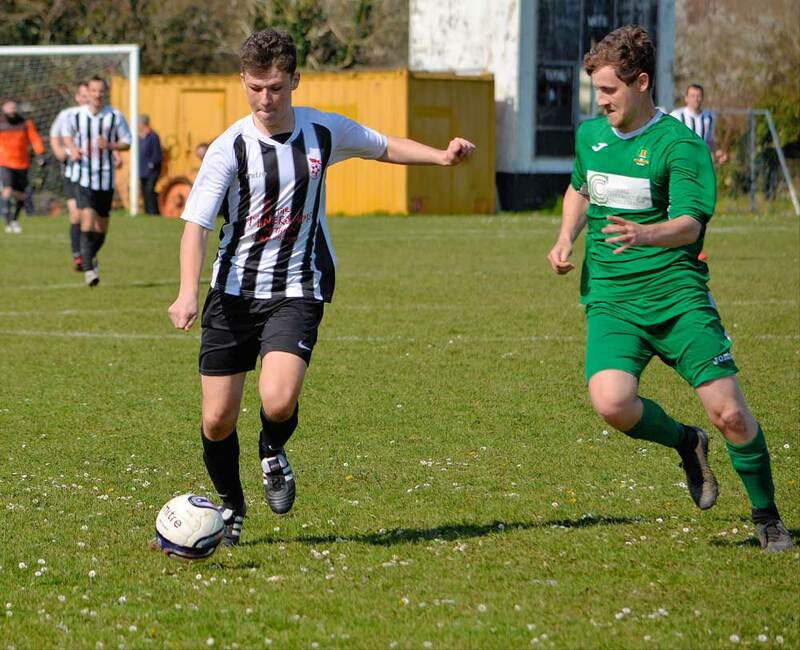 Home side St Dennis fell behind early in the game when Martin Gilbert smashed home after only 6 minutes. A few minutes later the Foxes almost stretched their advantage when Ali Milton's long range effort struck the crossbar. A defensive lapse let in the prolific Richard Griffin who accepted the gift to level matters and two minutes later Griffin doubled his personal tally when he hit an unstoppable shot into the top corner to put the hosts ahead. Soon after, Kev Morcom's misdirected cross sailed into the net to stretch the lead. Griffin completed a first half hat trick when his shot squirmed through the unlucky Phil Rees in the Foxes goal to put Saints 4-1 up. Two minutes before the break Steve Rolling stabbed home after 'keeper Stuart Bell had fumbled and a minute later Bobbylee Johns brought Foxhole right back into the match to make the score at half time 4-3. Both sides had chances in an open second half, but late in the game Mark 'Boaty' Rowe sealed victory for the hosts when his deflected shot completed a 5-3 scoreline. 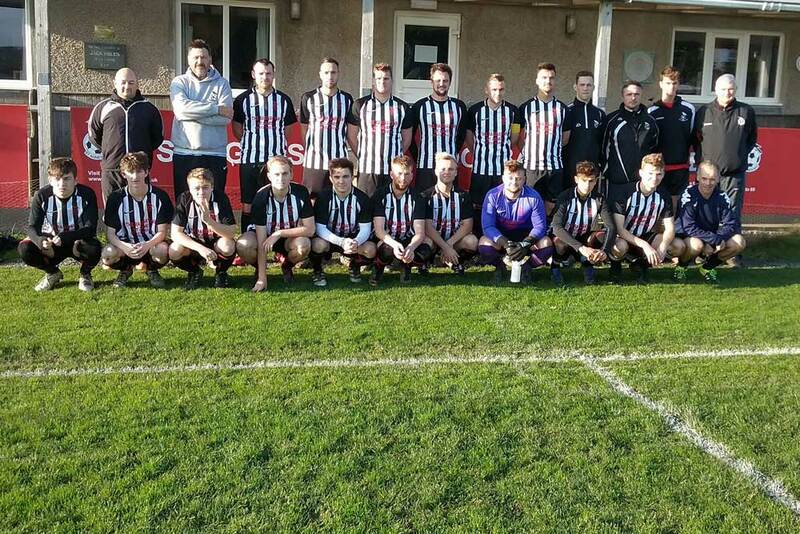 St Agnes Bolsters claimed the division 2 title without kicking a ball after overnight leaders Bude Town were beaten at home by a strong, physical Saltash United. Chris Truscott bagged 4 including 2 quality headers and an impressive lob in a 6-1 romp, with new signing Craig Lauderdale and Carl Nickson notching the other goals. 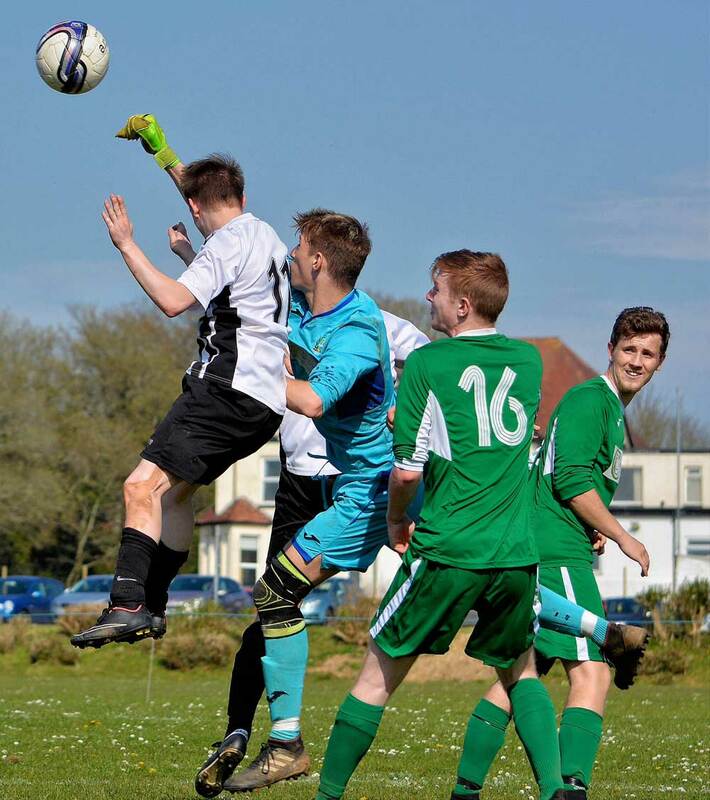 As a result of the heavy defeat Bude’s goal difference suffered which handed the title to Bolsters. 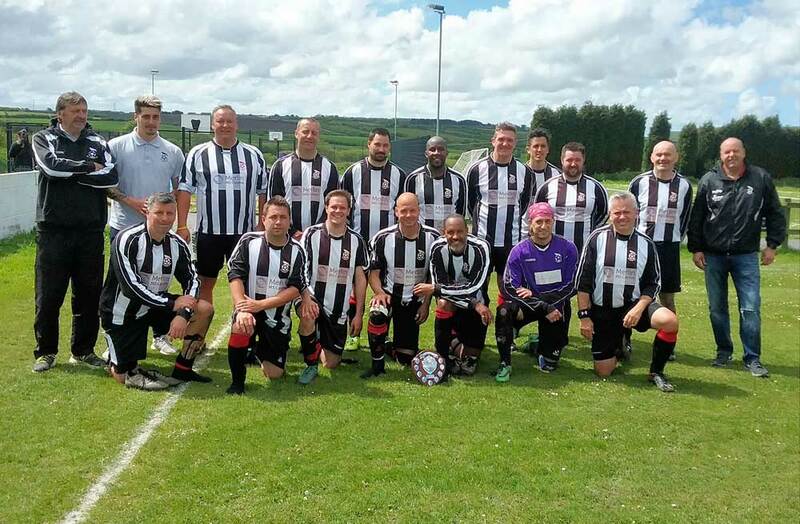 Bude though have the consolation of gaining promotion in their first season in veterans’ football. The only other game in Division 2 saw bottom club Halsetown in home action against fellow strugglers Royal Par. The visitors raced into a 3-1 half time lead, but the hosts stormed back in the second period to win the match 4-3. Home goals from Kevin Toms, Andre Otto, Andrew Perkin and Gareth Clifton-Dey lifted Halsetown off the foot of the table. 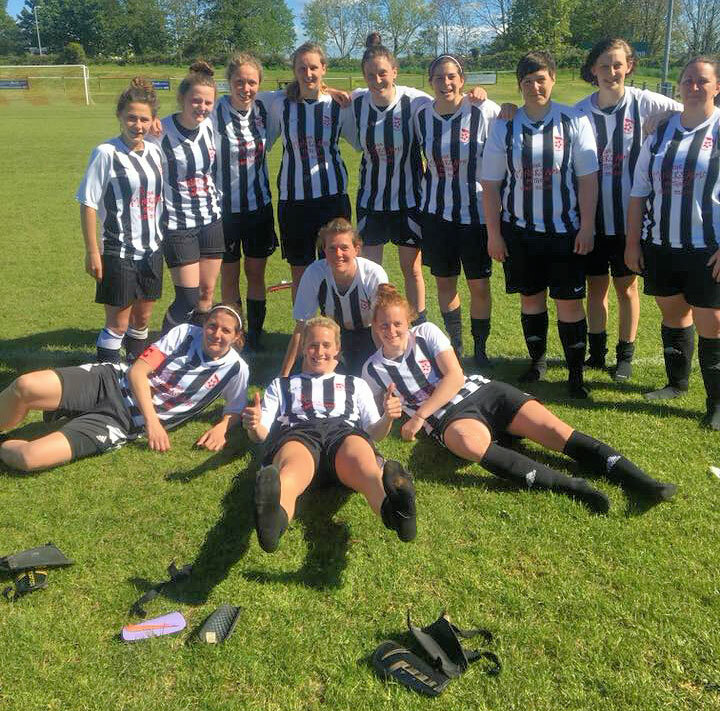 St Agnes AFC Ladies moved to top place at the head of the Pirate FM CWFL after a good 0-10 win away against their excellent battling hosts St Teath Ladies on Sunday. With five league games still to play and other teams with games in hand the the league remains well open for several teams to take the end of the season trophy spot. St Agnes Ladies are photographed celebrating their win at the park in St Teath. 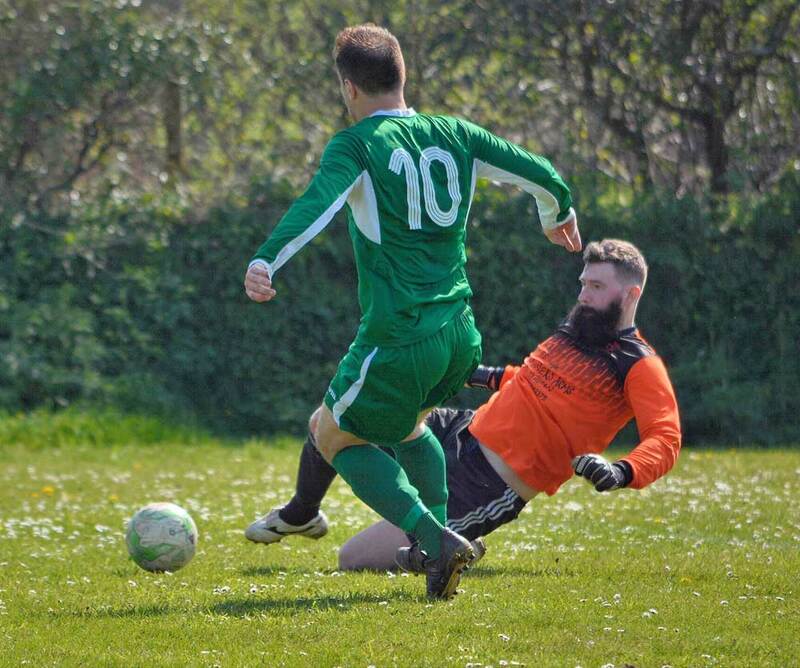 St Agnes 1st team had a good 2-6 win on Saturday away v Holmans with goals from Terry Cambell (2), Curtis Pay, Duanne Britain, Jakob Springall and Mark Bell. 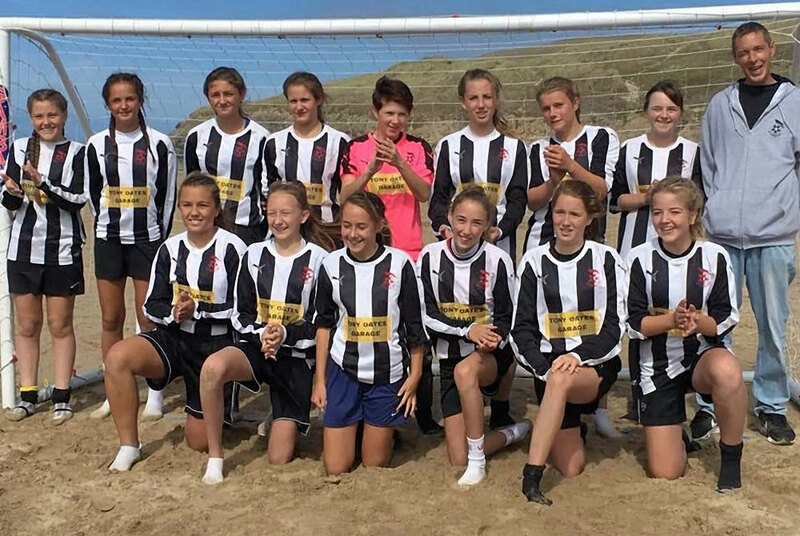 Members of St Agnes AFC Dynamos under 14's girls enjoyed their invitation to play a touring team from Texas at the West Country Cup 2018 in Newquay. 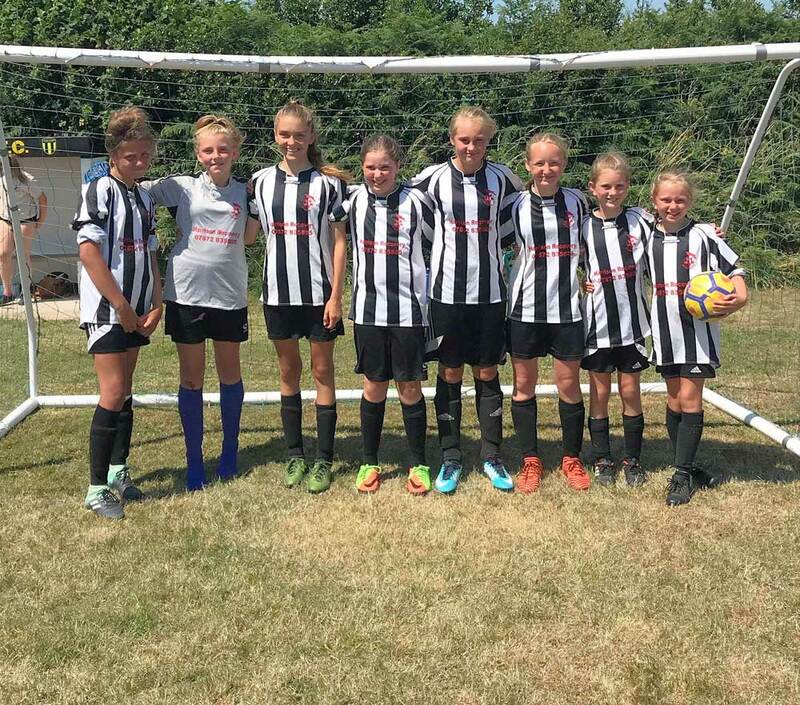 As part of a five team round-robin the St Agnes girls won two of their fixtures against Bodmin, Callington drew 0-0 against the Texas team 'Kernow Storm' and lost 1-0 to the event winners Plymouth Phoenix. 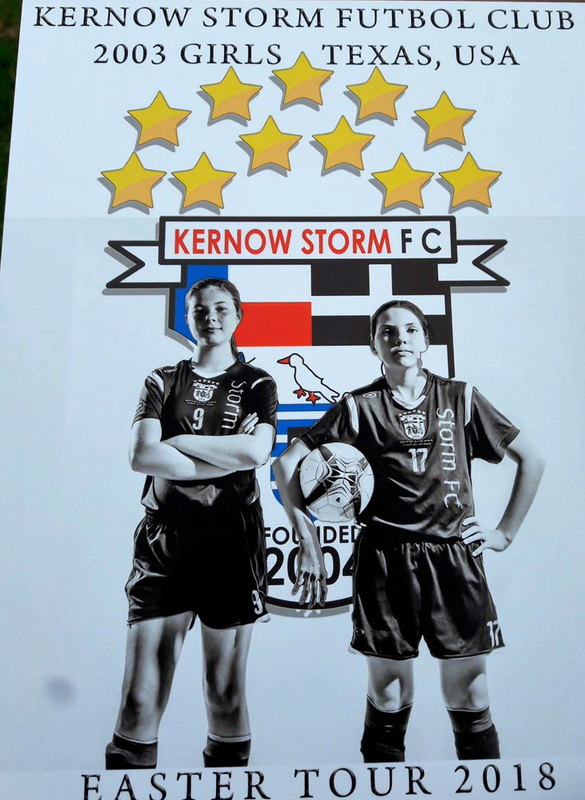 It was a fabulous experience to face different opposition and the girls are photographed as a team and with members of the Kernow Storm, Texas team and coaches. 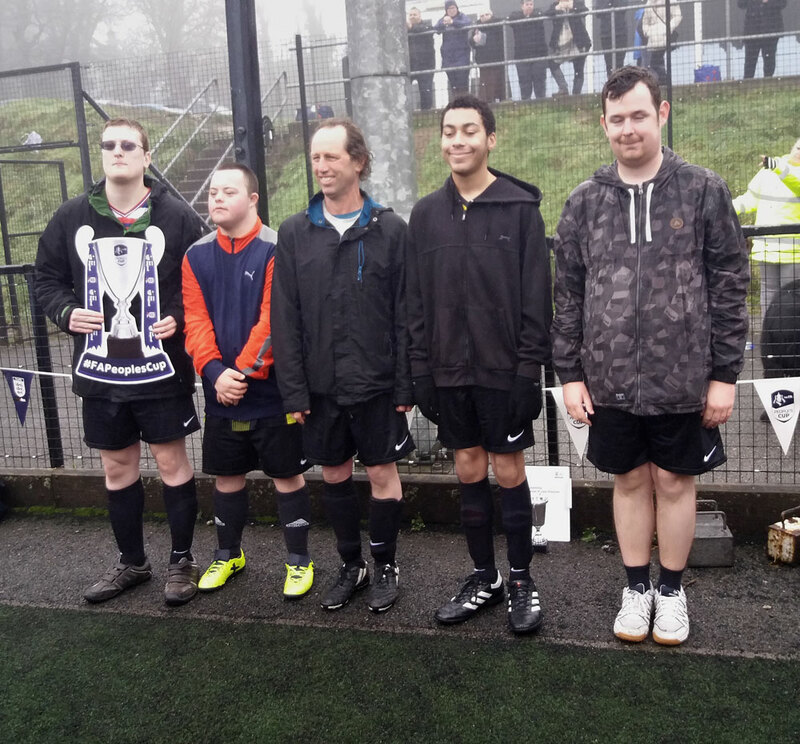 St Agnes AFC are incredibly proud of their League and Championship Dis-ability Teams who headed to Bristol on Sunday to take part in the Regional round of the FA People's Cup representing Cornwall. With staggered kick off's for the teams, two mini-buses were planned with the first heading off at 6am: this being super challenging with the clocks springing forward to lose an hour the same night! Nevertheless both squads successfully made the trip and had a wonderful experience in Bristol meeting and playing other teams from across the region. 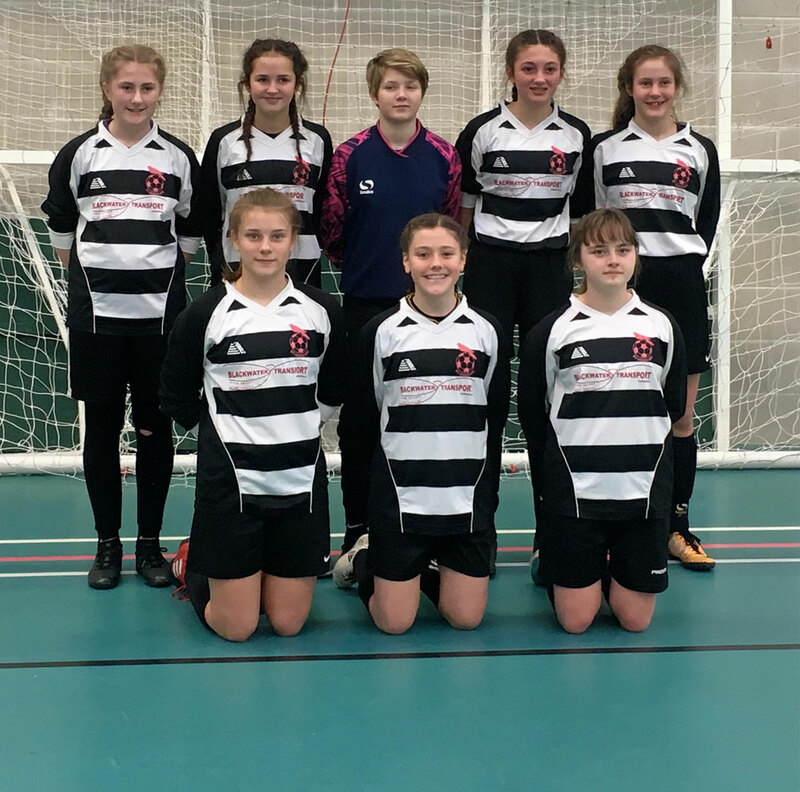 The Championship Squad progressed to the Regional Semi-Final losing out to a stronger more physical team from Dorchester. Even the 13 hour day and travel didn't spoil the experience for either squad and both sets of players are still absolutely buzzing with enthusiasm. 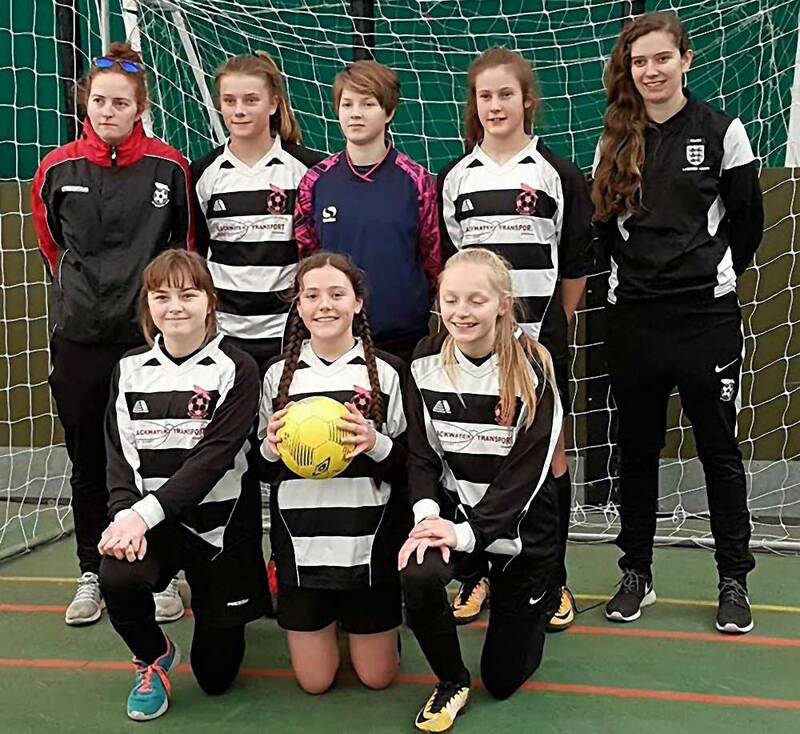 Team Coach Hailey Collins said "I am so proud of all the players, they played some great football". Player Ollie said "I am very tired but it was a lovely day. I loved the football it was exciting". St Agnes AFC would like to say a massive thank you to everyone who supported the players, team and club in enabling them to achieve this huge adventure. 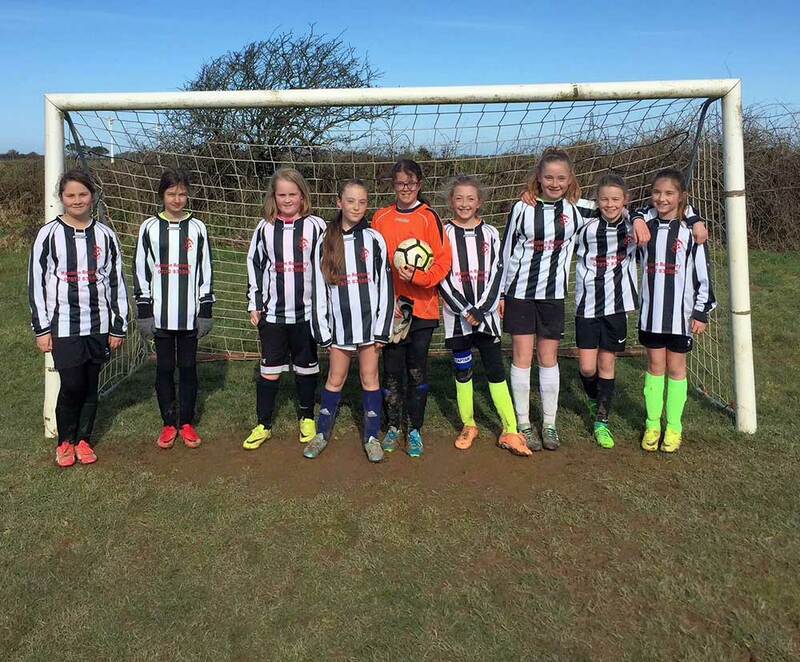 Both St Agnes AFC Dynamos Under 12's Girls teams were in action on Sunday with home fixtures. 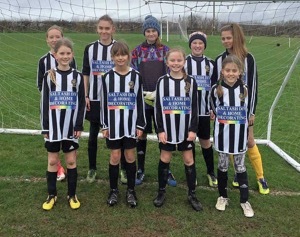 Entertaining Charlestown Girls in the Under 12's CCFA County Cup, St Agnes girls progressed to the semi-final with a 6-0 win. 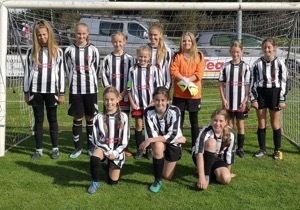 Facing Newquay in the CGFL St Agnes Under 12's had a 2-0 win. 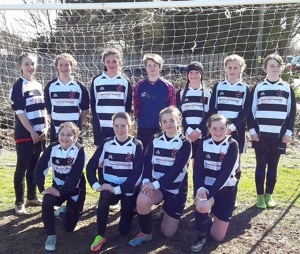 In what has been described as one of the most intense and gripping girls' fixtures, St Agnes AFC Dynamos Under 14's entertained Helston at home in the 1/4 Finals of the CCFA Under 14's County Cup. 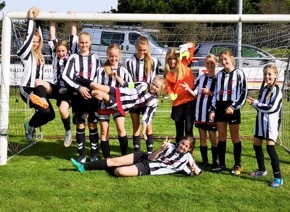 The St Agnes girls found the Helston keeper in tremendous form with the score line 0-0 at the end of ordinary time. Extra time saw two super goals from Millie, one from Sophie and the St Agnes Girls progress 3-0 into the semi-finals. 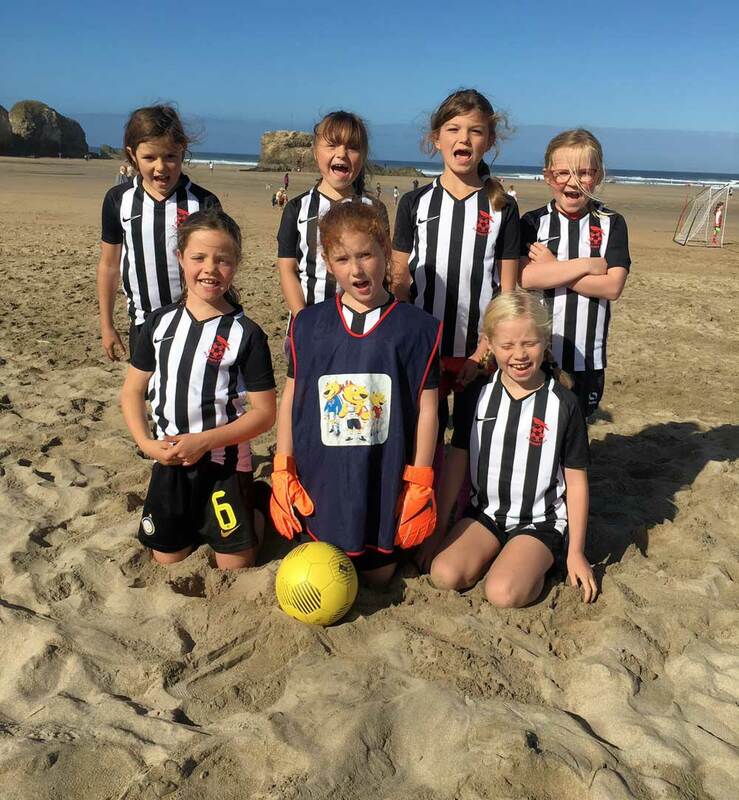 Members of the newest team at St Agnes AFC Dynamos the Under 8's Girls had a very exciting trip on Saturday with their first ever fixtures. 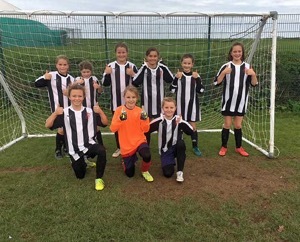 Hosted at Penrice College in St Austell, the team enjoyed some wonderful football playing other new teams from St Blazey and Foxhole. 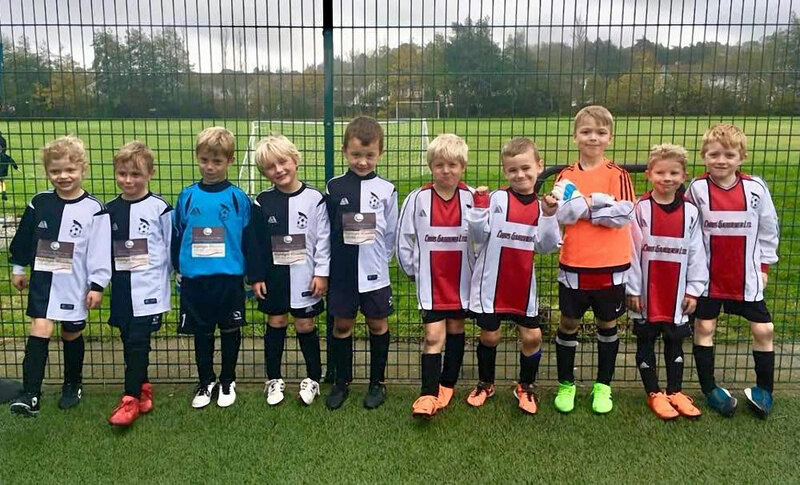 Some of St Agnes AFC Under 6’s and Under 7’s were rocking their whacky/odd socks this morning at training to raise awareness for Down Syndrome Awareness week! 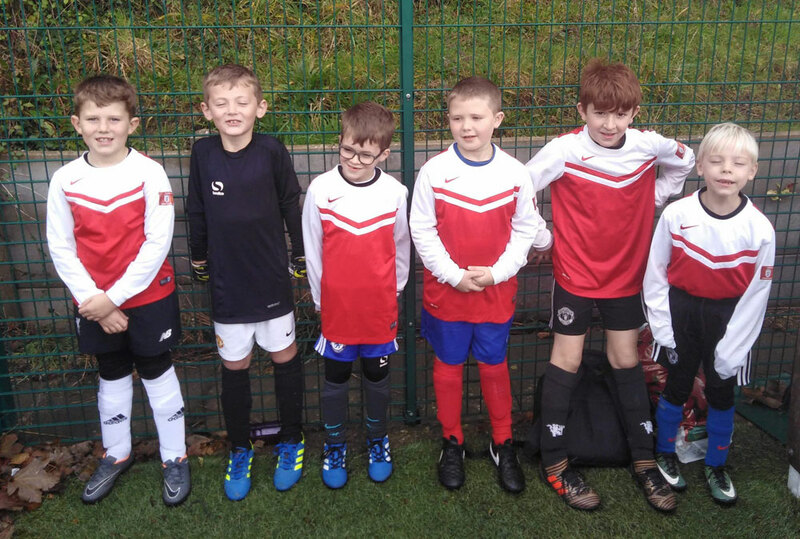 Despite the cold weather (and the threat of snow) seven of our registered players turned out a fantastic performance against some other experienced, formidable Under 7’s teams. We had the chance to play teams we have already played plus a couple we hadn’t played yet, really stretching the players in a brilliant friendly Round Robin tournament at Hayle FC! All of the St Agnes players gave it their all, both on and off the pitch! They were polite, well mannered and respectful of all the other players, referees, coaches and the rules given to them. They were a credit to both St Agnes AFC and their parents and we as coaches were exceptionally proud that they were with us, the performance they gave and their overall attitude! We came away with a range of results and the boys were very pleased with themselves with lots of running and hard work! Some amazing saves were made, brilliant defending and the strikers had a great day too with one absolutely killer free kick almost from the half way line straight in the top corner of the goal! 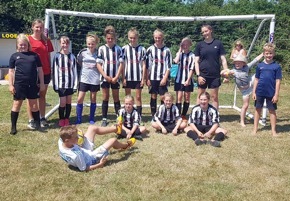 Despite an injury to one of our players in our third match, which meant an early finish for him, all our players had a fantastic time and thoroughly enjoyed themselves, especially being rewarded with Kernow Youth League Festival wristbands to wear with pride and show that they had participated. St Agnes Under 7’s have two friendly league matches left for the season plus a few more tournaments booked in. 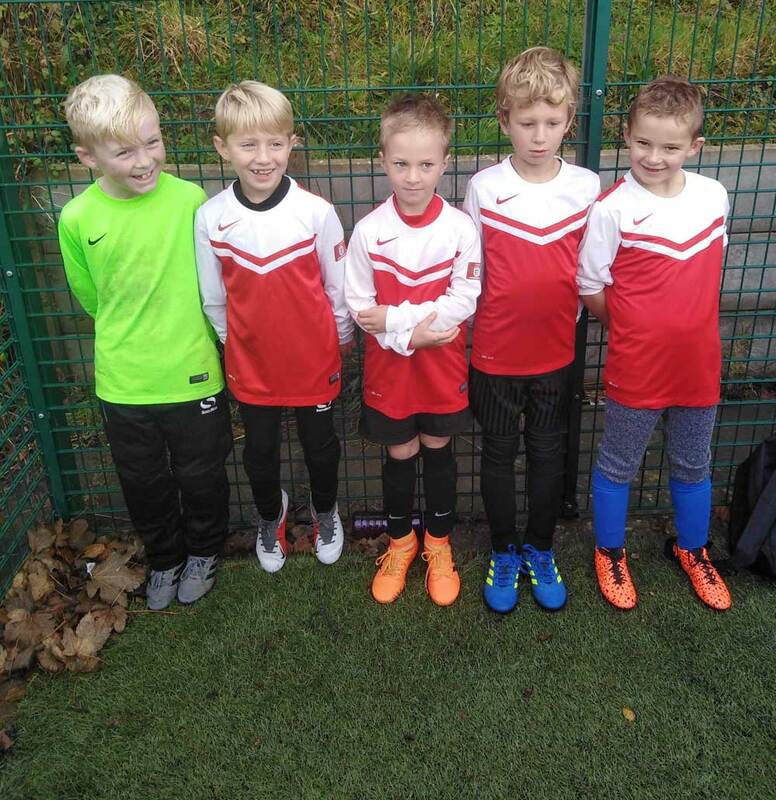 They are continuing to go from strength to strength and we are amazed at how far they have come since starting to play matches in September, we are like a different team! Well done St. Agnes Under 7’s! Fantastic day. 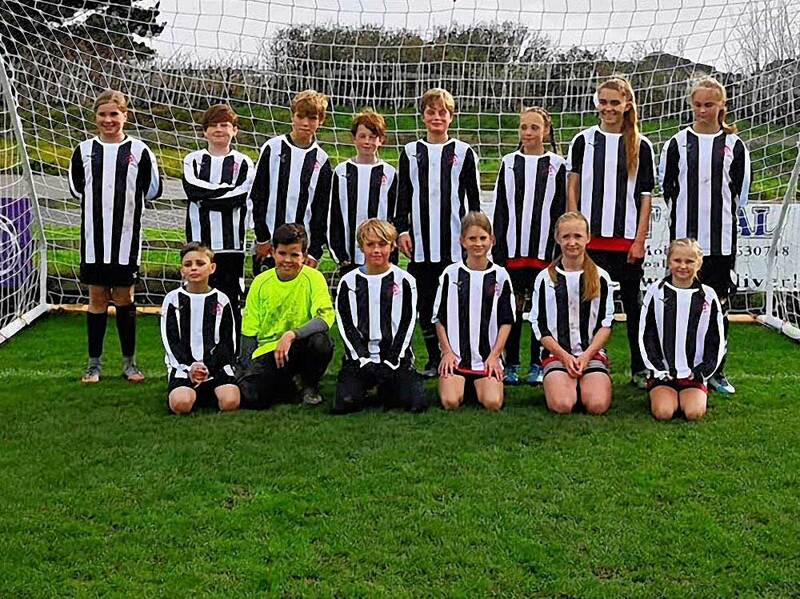 Thank you to Kernow Youth League for organising and Hayle FC for hosting. 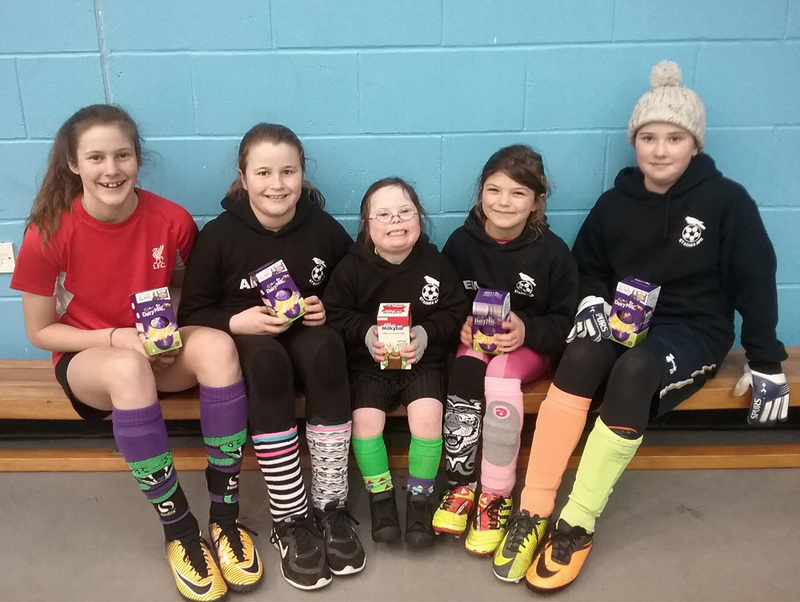 St Agnes AFC Dynamo Girls celebrated World Down Syndrome Day (21st March 2018) at training today by 'Rocking their Socks'. 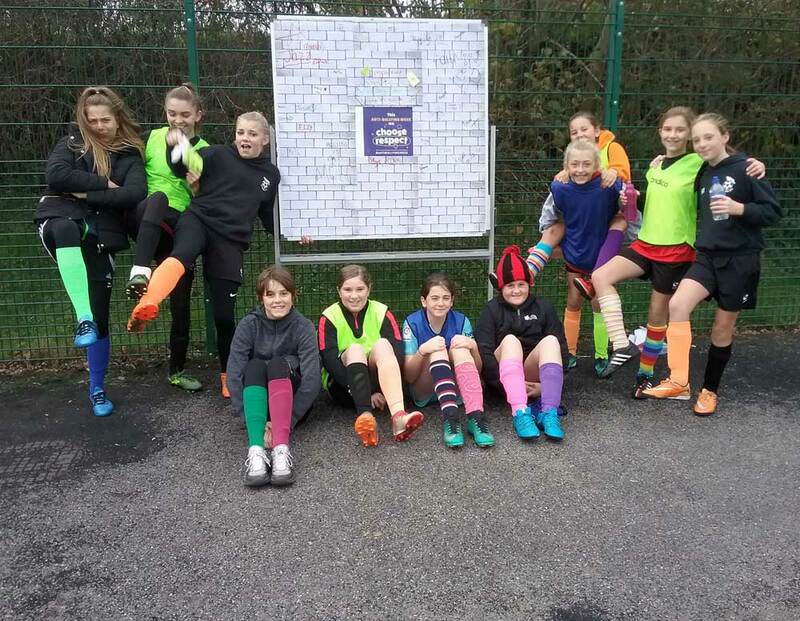 With crazy socks, odd socks, bright socks, short socks and long socks almost 50 of the girls entered into the World Down Syndrome Day initiative with style. Winners across the age groups were chosen by their coaches with Easter Egg prizes awarded. 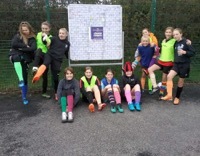 The girls are making a donation of £60 to Cornwall Down Syndrome Group to support their dance classes. 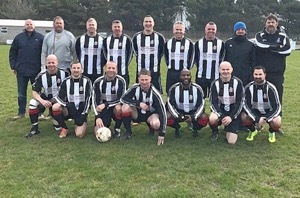 Well done to the St Agnes AFC Bolster Vets on their 6-1 win at home -v- Royal Par Vets. 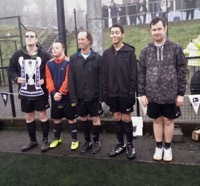 Goals from Danny O'Hagan, Ronnie Sekatawa, an OG and a Trevor Wisker hat-trick, saw them progress through the quarter final of the Knock-out Cup into the semi-final. 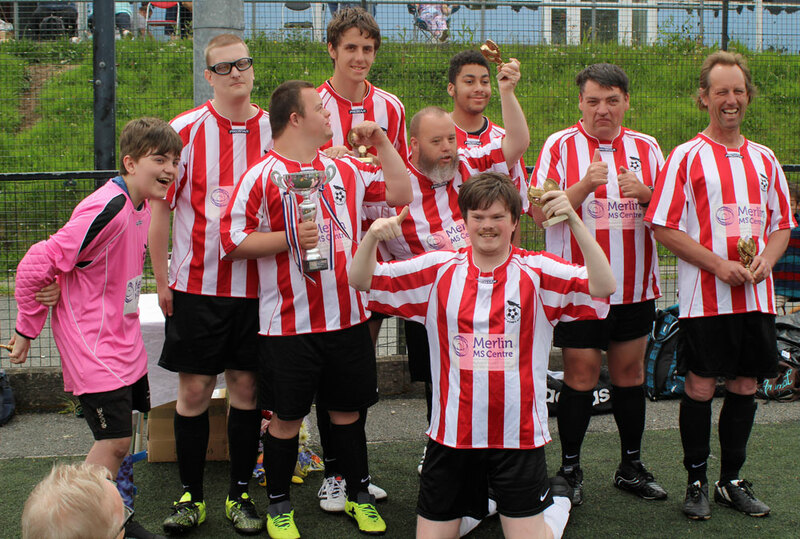 There were double celebrations at St Agnes AFC Dis-ability Squad training this week. 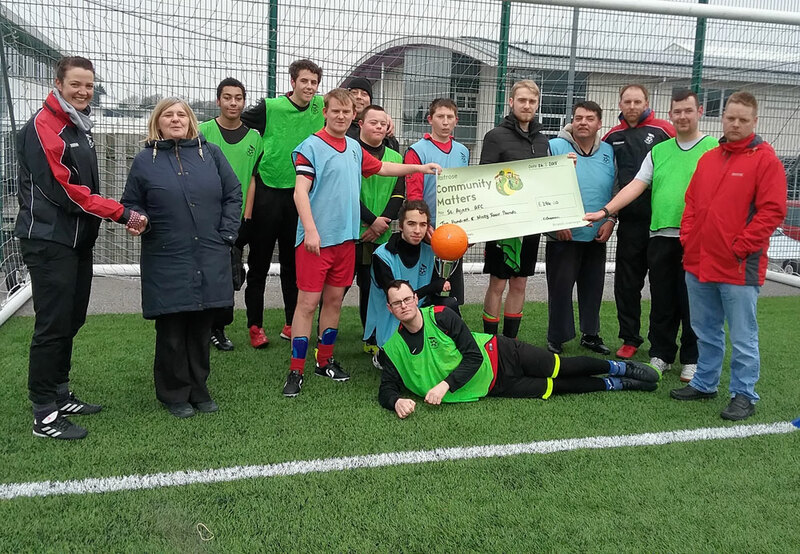 Another opportunity for a photo with their cup won by the Championship team in the 1st round of the FA People's Cup last weekend and a huge thank you to Waitrose for the cheque presented from their Community Matters Scheme. Thank you Waitrose: as the players told you "it all helps"! Coffee Morning Thank You! Thank you to all the amazing people who supported our February Coffee Morning held in St Agnes Church Hall where we raised a tremendous £512! This will be split equally between Mount Hawke and Porthtowan Cricket Club and St Agnes AFC: helping improve facilities for our youth sections. It really is a wonderful amount of money! Thank you from both of us: Mandy Kimmins and Ann Miles. 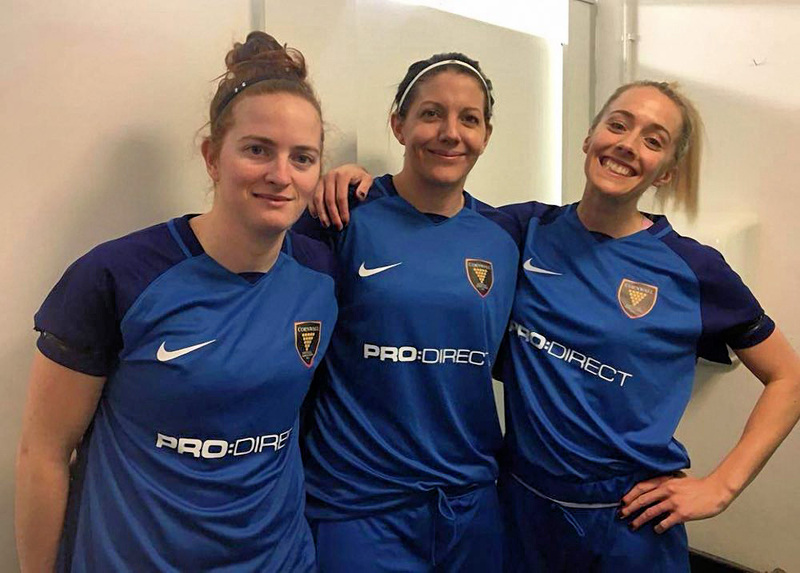 Congratulations to three members of St Agnes AFC Ladies team who were selected to play for Cornwall Ladies -v- Leeds Ladies. All three were in the starting line up of the first county ladies fixture in three years and gave a grand account of themselves. 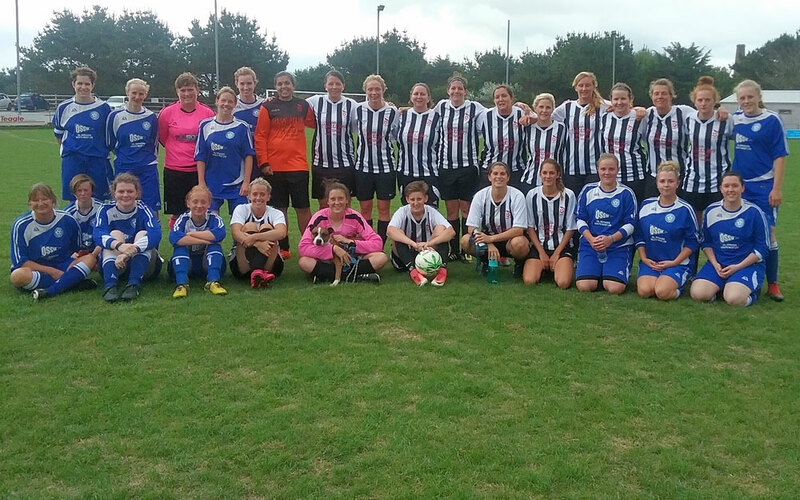 The game was a fabulous showcase for ladies football in Cornwall with the end result Cornwall 0-3 Leeds. Well done Zoe Arundell-Lethbridge, Jodie Hood and Laura-Beth Medcalfe! 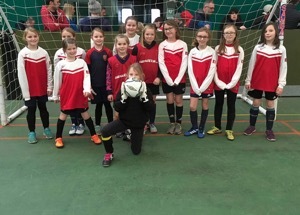 Members of the St Agnes AFC Dynamos Girls had a fabulous time at the Cornwall County Futsal Competition held at the Ben Ainslie Centre in Truro. 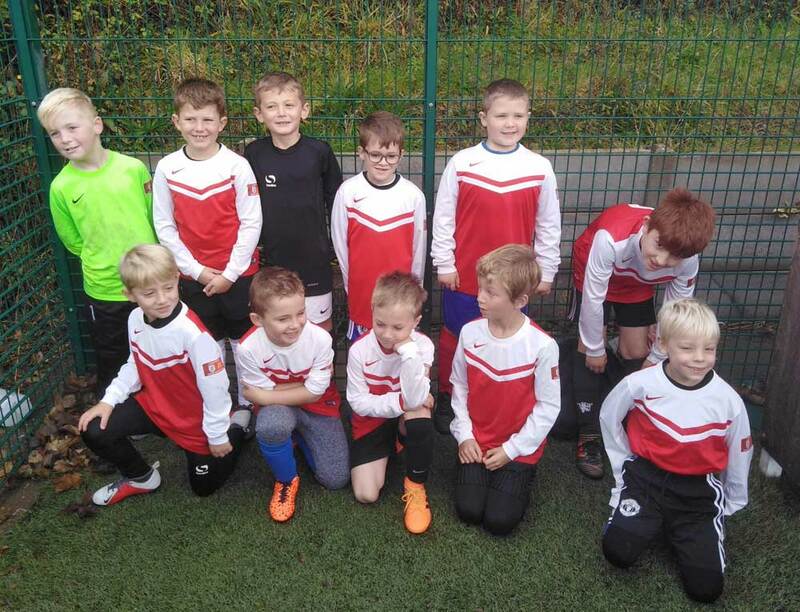 The under 10's played some lively entertaining fixtures with huge enthusiasm and improving skills. 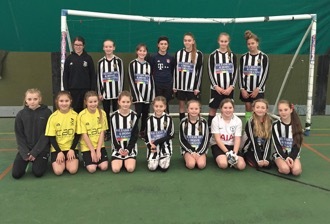 The under 12's narrowly missed out in a place in their final on goal difference only. 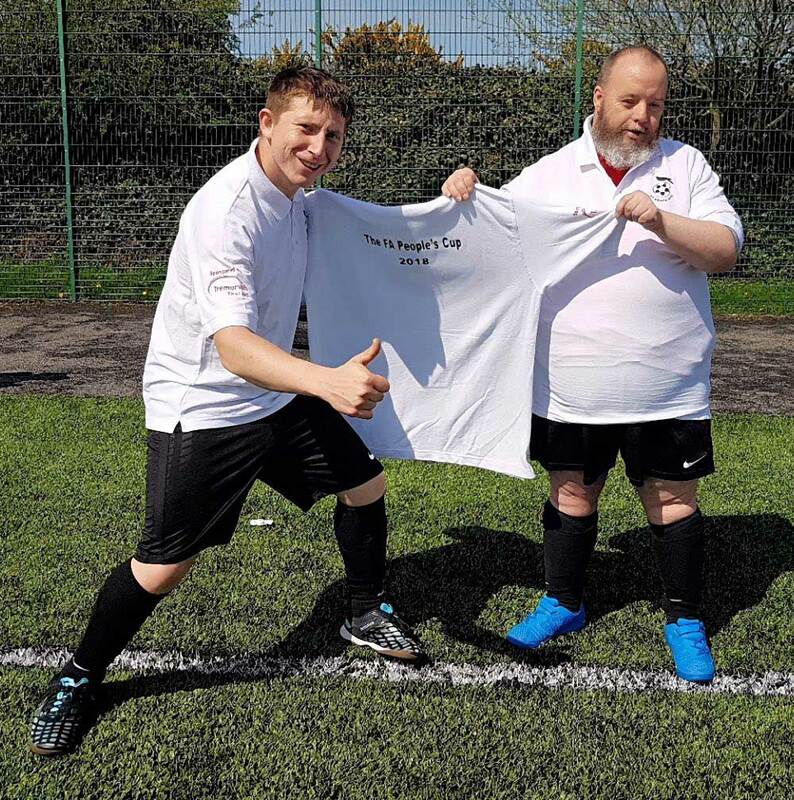 They were really delighted to be wearing their new team shirts generously sponsored by Richard Jacka of Harrison's Recovery 07872 835885. 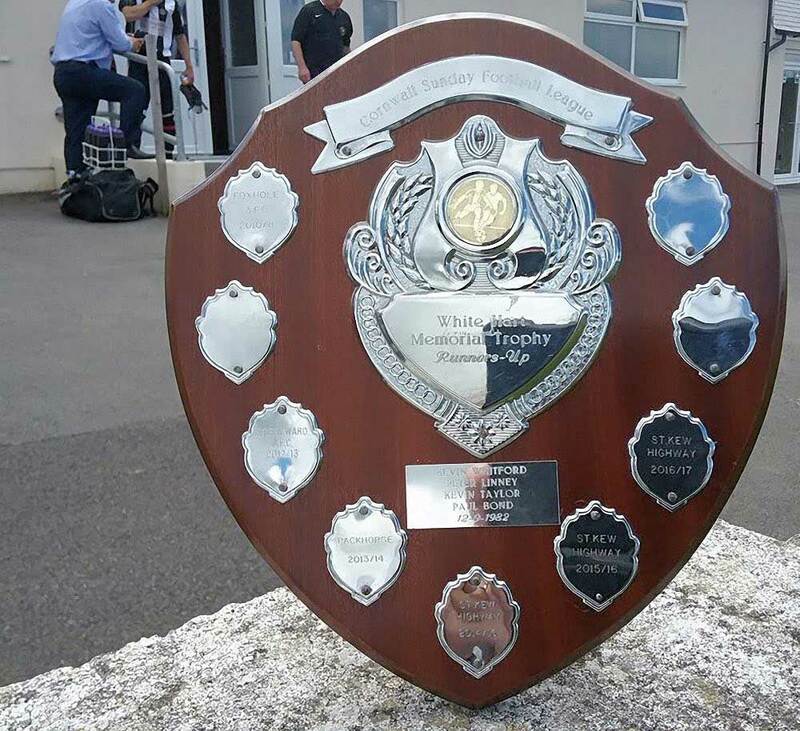 The under 14's were unbeaten and won their final -v- Saltash 3-0 to be crowned County Champions. They progress to the Regional stage of the competition. Any girls interested in playing football of any level of experience or none at all are welcome to join in. 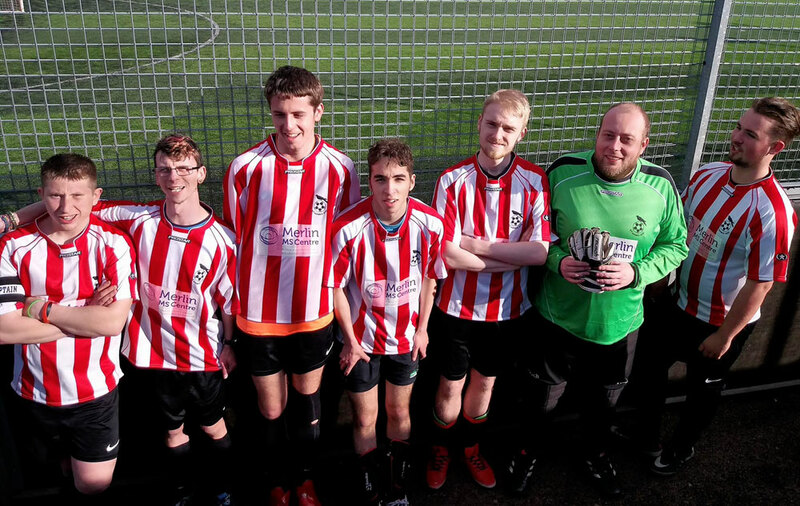 A massive well done to members of the St Agnes AFC Dis-ability Squad who took part in the FA People's Cup today! 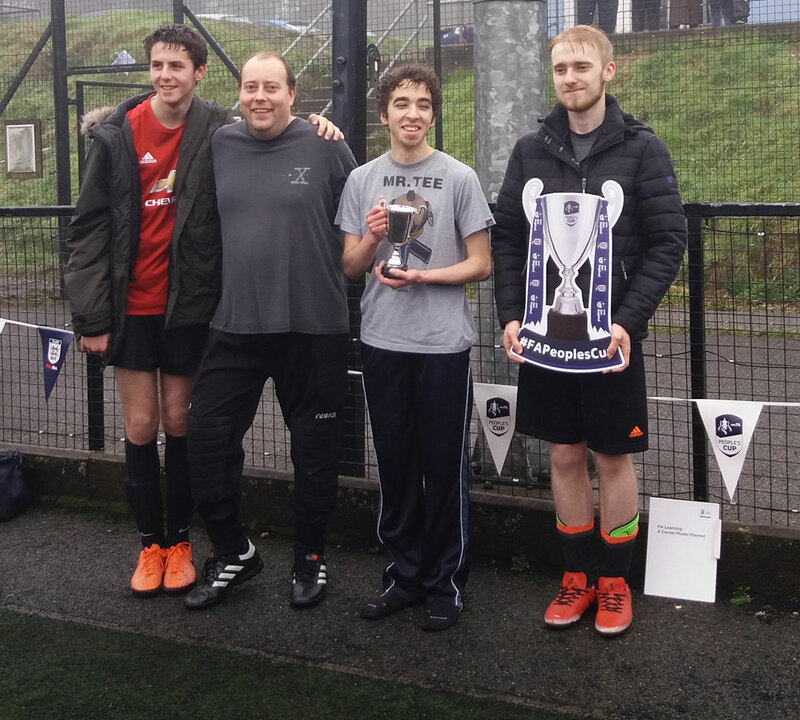 A wet mizzly day didn't deter the enthusiasm of the squad, some of whom are photographed here with the Championship team winning the cup to progress to the next round and the League team coming runner's up. Awesome stuff and thank you to our amazing coaches too! 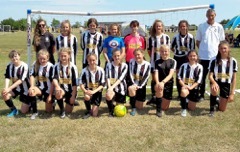 Congratulations to three members of St Agnes AFC Ladies Squad Laura-beth Medcalf, Jodie Hood and Zoe Arundell Lethbridge who have been selected to represent Cornwall -v- Leeds Ladies next weekend. Good luck to the team and coaches! 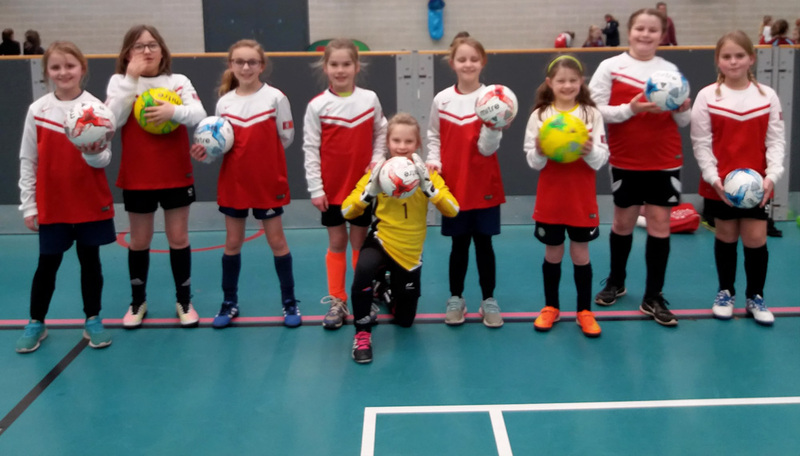 Well done to our awesome enthusiastic St Agnes AFC Dynamos Girls Under 10's who played in the CGFL Futsal event today. Very proud of their performance and efforts and thank you to coach Jenna Borlase for going with them! 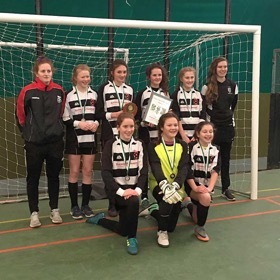 St Agnes AFC Dynamos Under 14's Bolsters and Cuckoos won the CGFL Futsal Cup and Shield today with a totally awesome performance from all of the players! Well done and thank you to their coaches and parents. 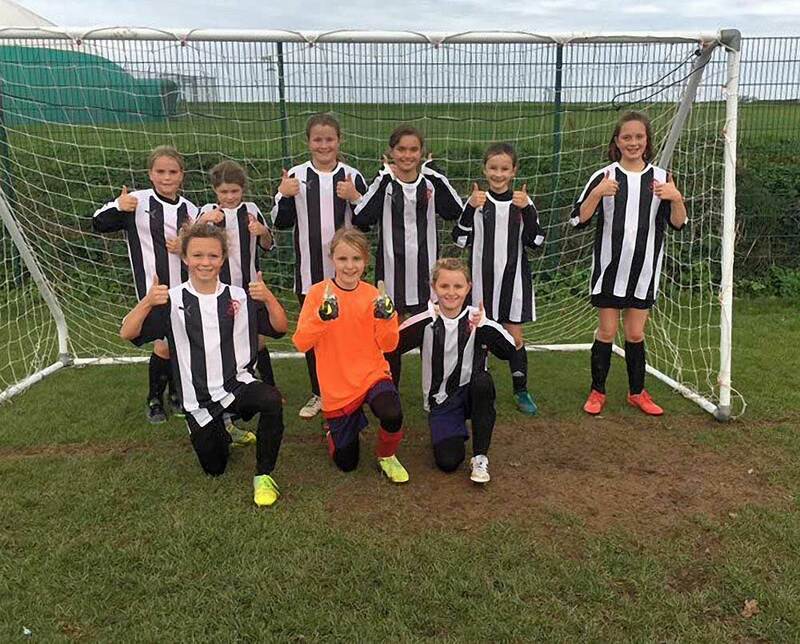 The Bolsters won 1-0 -v- Saltash in ordinary time and the Cuckoos took it all the way to a dramatic sudden death at penalties -v- Penzance. Once again the inclement weather in the build up to the weekend left several pitches unplayable leaving the Q Cornwall Leisure Veterans League programme decimated once again. Ironically, the sun shone brightly at St Ives Rugby Club where Halsetown hosted promotion chasing St Agnes Bolsters in Division 2. The visitors were seeking revenge for their cup defeat earlier in the season and started brightly with Trevor Wisker giving Aggie an early lead after only two minutes. At the midpoint of the half the visitors doubled their lead when Paul Hutchens scored straight from a corner. The second period was very much a dull affair. Halsetown did create a few openings to get back in the match, but Bolsters made the game safe in the 86th minute when a cross into the penalty area was fumbled into his own net by the home ‘keeper. The 3-0 victory puts St Agnes Bolsters top of the table. Having completed their league fixtures Bolsters now have a waiting game to see if they can claim one of the two promotion spots. 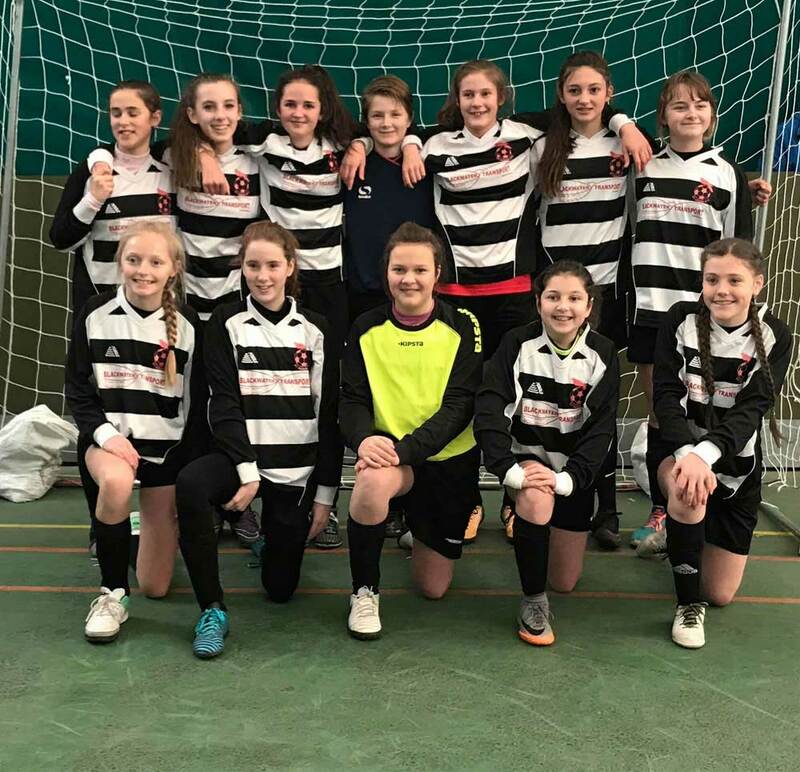 St Agnes AFC Dynamos Girls Under 14's were on fire at the CGFL Futsal event hosted in the Sports Dome at Newquay Treviglas School. A great group of talented players with two teams entered into the event they will gone on to compete in the Cup and Plate Trophy event in February. 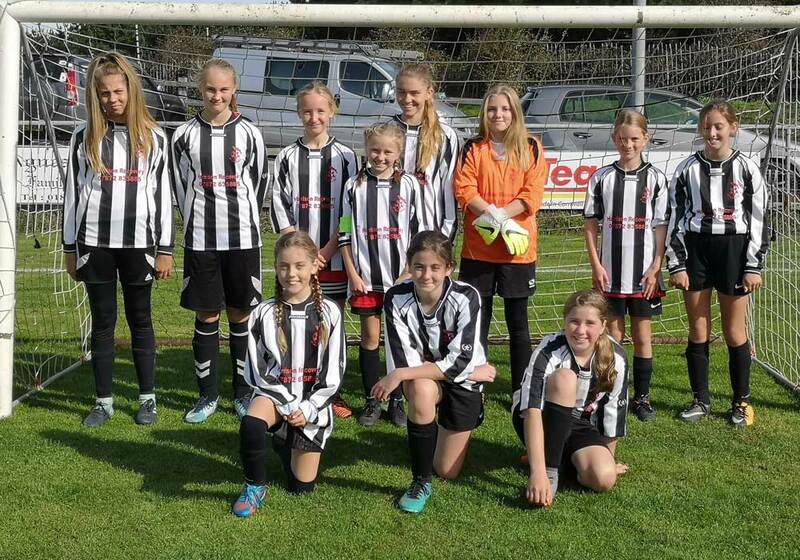 Well done St Agnes AFC Dynamos Girls Under 12's who were on fire away -v- Looe in CCFA County Cup. They found the back of the net with a tremendous win to progress into the next round. Thank you to Looe for their hospitality and for getting a game on in the recent weather! Well done team, coaches and parents/supporters - you are all awesome! 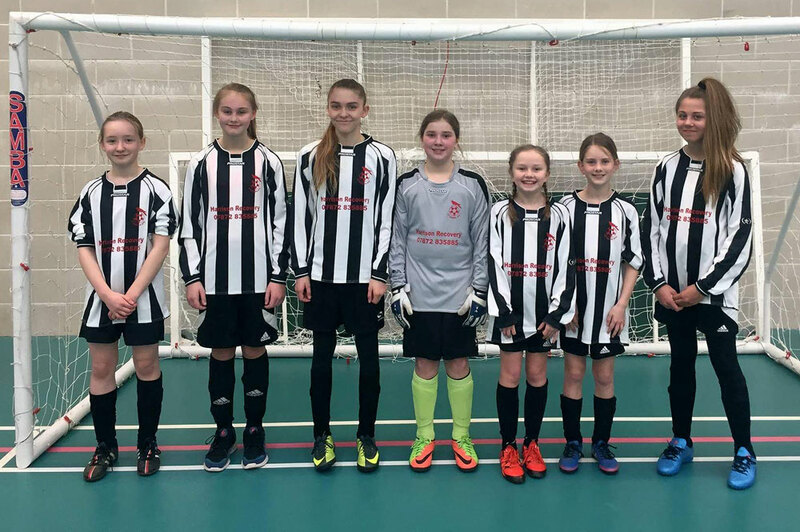 St Agnes AFC Dynamos Girls Under 10's entered 2 x squads into the CGFL Futsal event at Newquay. 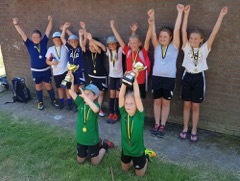 A very excited group of girls who enthusiastically played some entertaining football! 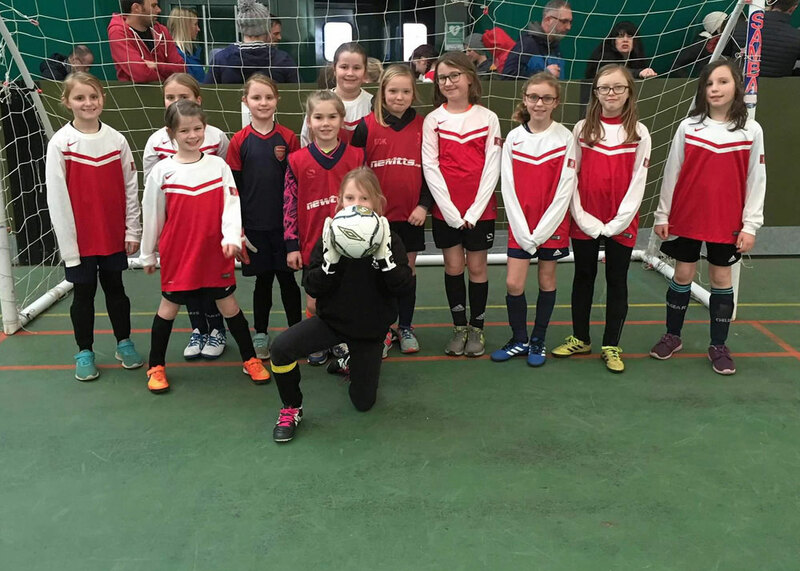 Fabulous turn out today at CGFL Futsal. 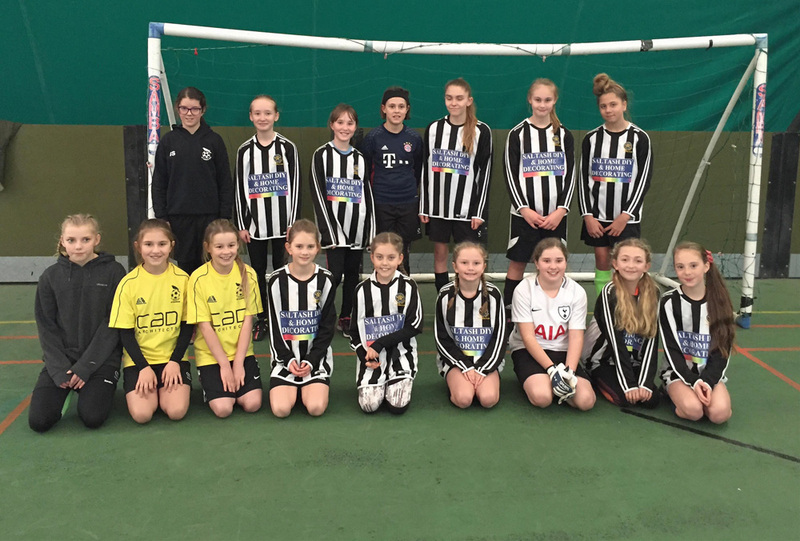 Brilliant effort from our three under 12's teams! Super proud of all the players and coaches and thank you to the super supportive helpful parents. Well done everyone! 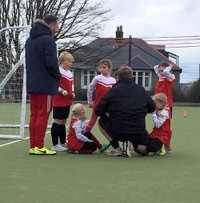 The FA Mentor Programme is now well established in Cornish football with 5 Mentors supporting coaches and clubs year on year, however, for those that don't know about the FA Mentor Programme here is some information from a club that has benefitted from having and FA Mentor. 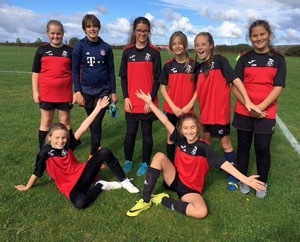 St Agnes AFC were offered the support from an FA Mentor last season, some of their committee and volunteer members initially wondered how it would work for their club but after Tash Mills began working with the club they were already seeing the difference her support had made. 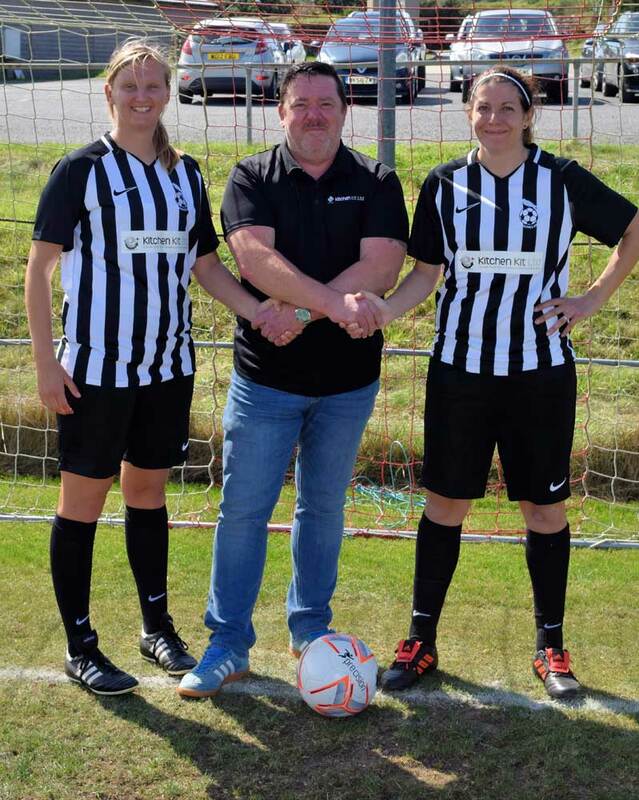 Mandy Kimmins, Chair of St Agnes AFC, said this about Tash and her work with the club “Over the time Tash has worked within our club the benefits have been incredible! 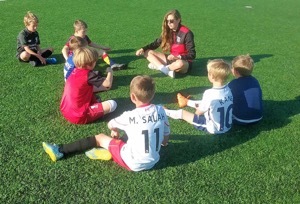 With a quiet reassuring manner our FA Mentor Tash has become a fabulous asset and spring board to our club.Directly because of her involvement and the individual and group support and confidence she has offered coaches and managers we now have better qualified staff delivering better sessions. Managers who wouldn't even have considered furthering their qualifications have completed Level 2 courses with her regularly in touch, mentoring, supporting and helping in a manner I think has been way above her role. Tash has been able to work with the coaches who want to learn and be mentored, but has also broken down barriers with those less enthusiastic ones who are reluctant to input and resistant/sceptical of change. She has demonstrated some really good communication skills and resilience on her part with amazingly positive results! 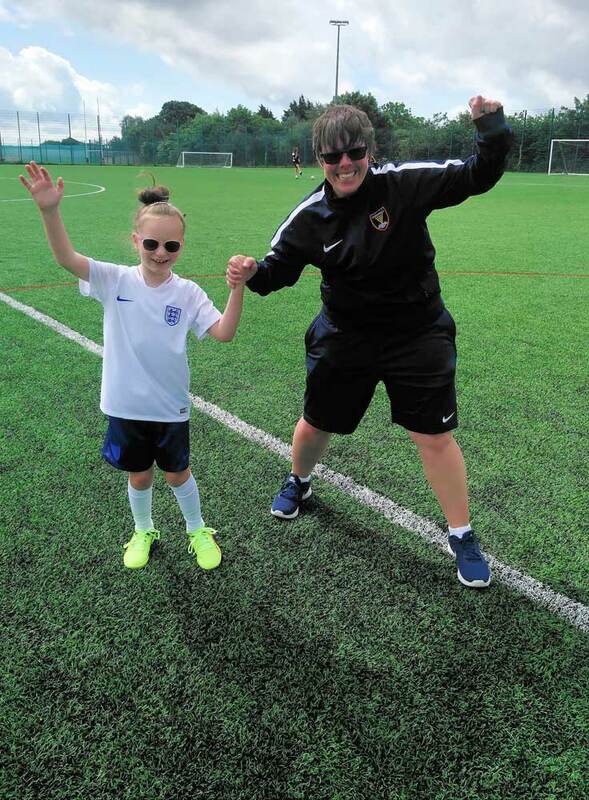 Tash has been working recently to help develop our female coaches setting up a network group between them and delivering CPD for both female only coaches and with our Disability Section". 1. 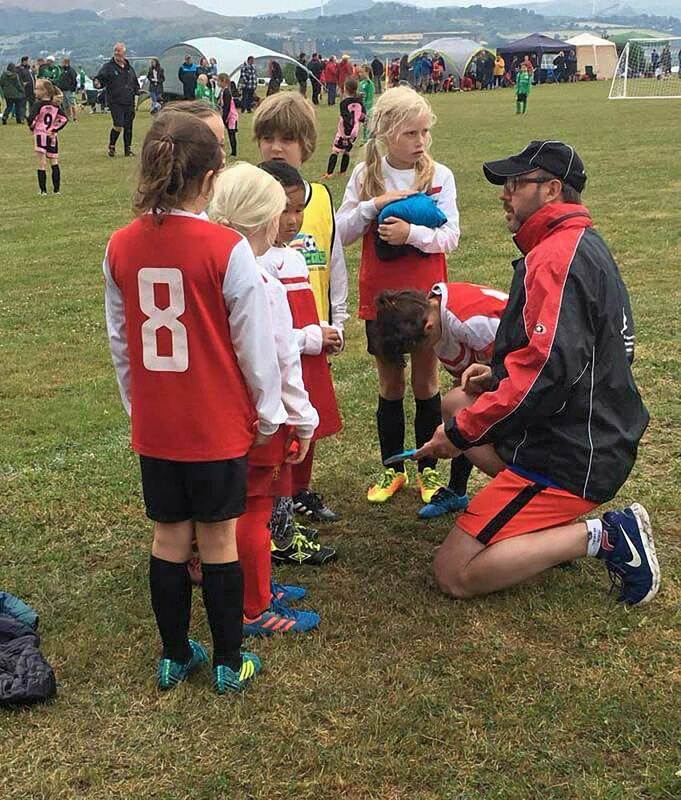 Our men's first team manager involved in football all his life as a player and coach, manager of a men's team for 20 years with an old style Level 1 Qualification and, whilst interested and eager to learn, not feeling confident or able to progress his coaching any further. Tash has supported and encouraged him to now complete his Level 2 qualification (including the required Youth Modules 1 & 2 elements) this simply would not have happened without her input. 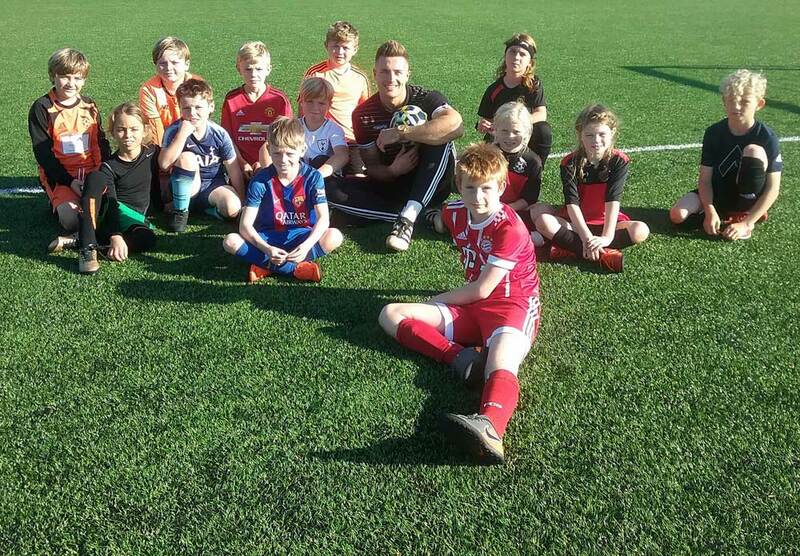 A men's team manager having never been involved or with any confidence in youth football he offered to fill in and deliver an under 8's session at the weekend which he successfully completed and enjoyed. Asked what he thought about the FA Mentoring he said "It has been really good. It's made me rethink the way I do my practises, how I bring in progression and the way to communicate and deliver sessions. Most of all it has given me confidence to learn and progress as a coach". 2. One of our Disability Coaches was previously involved with a different club set up and Tash had been offering to support him for some time without a positive response. Since joining St Agnes AFC in the summer he has been encouraged to engage with Tash as Mentor. Our Disability Section is new this season with 2 coaches who had never met working together. 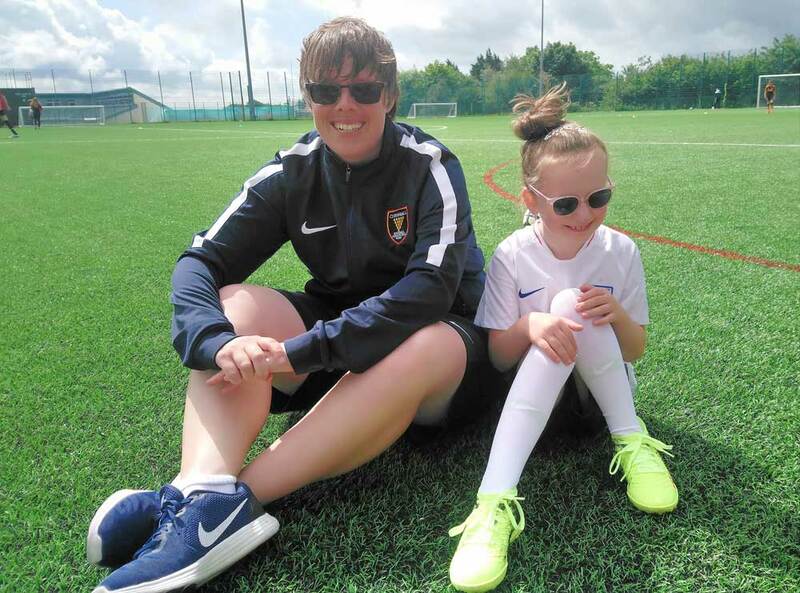 Through time and patient Mentoring Tash has worked with each individually and jointly and now has them structured with a plan of sessions to deliver together across the League and Championship levels both feeling confident and supported. It’s been fabulous! The players absolutely love the set up and the 'better' coaching being developed is benefitting them all. A couple of weeks ago I watched one player who normally can only walk around with the football literally run up the ramp to the training pitch he was so excited and engaged to be there. We now have our own Club Mentor in place and through Tash's involvement coaches supporting each other across the club. 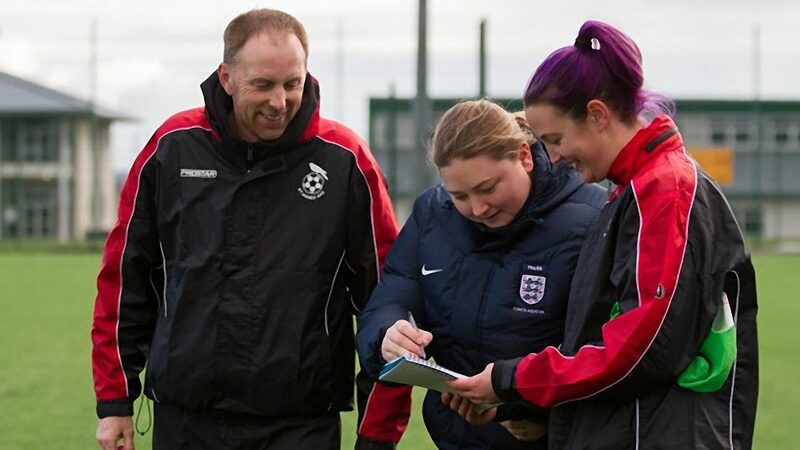 If you are a coach or part of a club and think your coaches would benefit from having the support of an FA Mentor then please complete the 'Register your Interest' form. As you can see the Mentor Programme is a fantastic opportunity for any level of coach who is enthusiastic to develop!